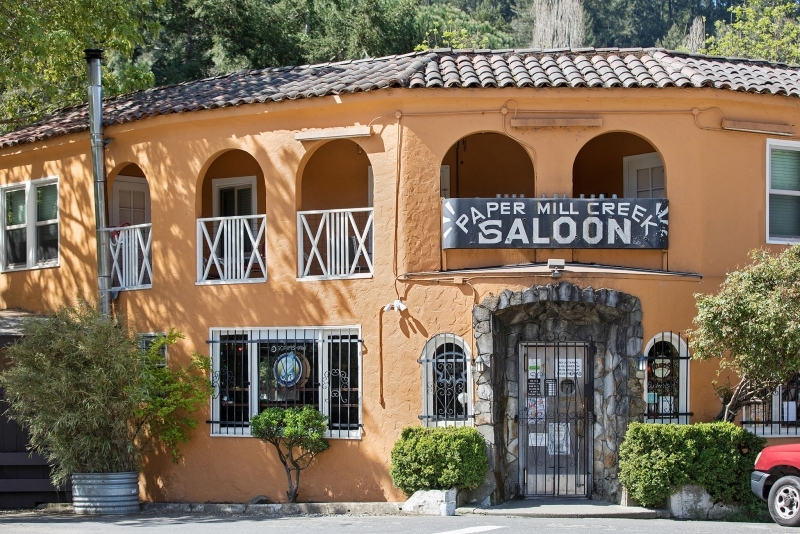 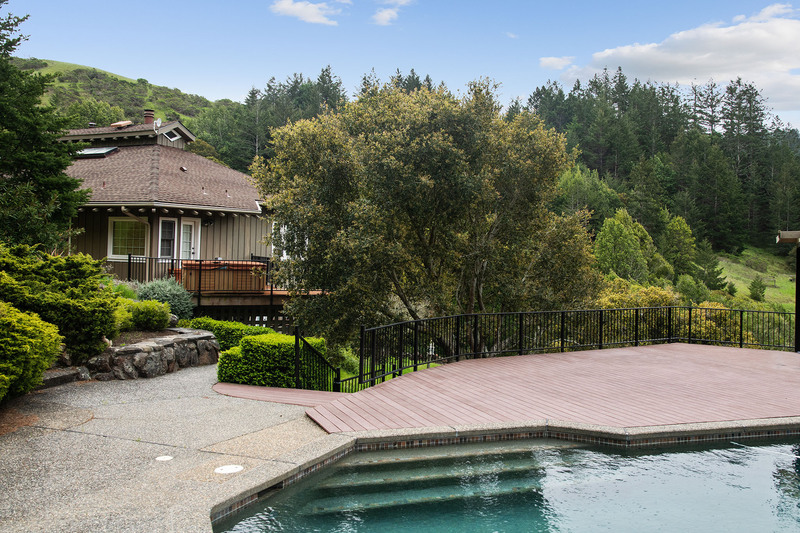 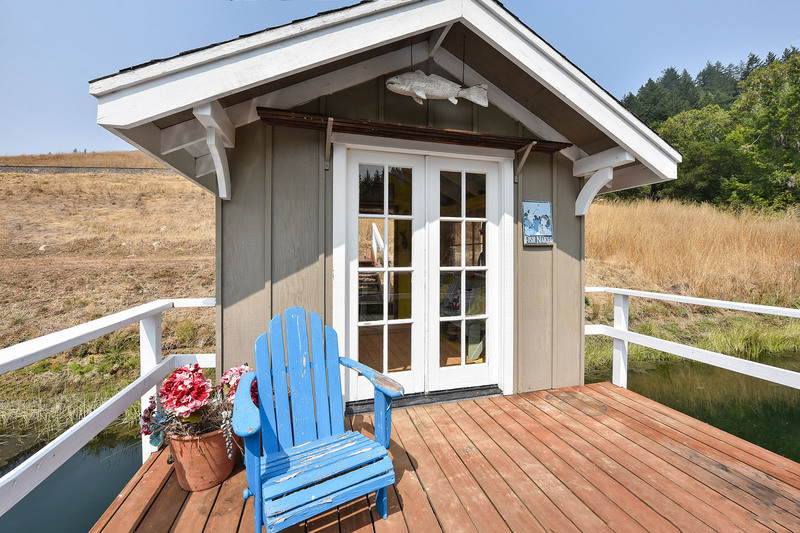 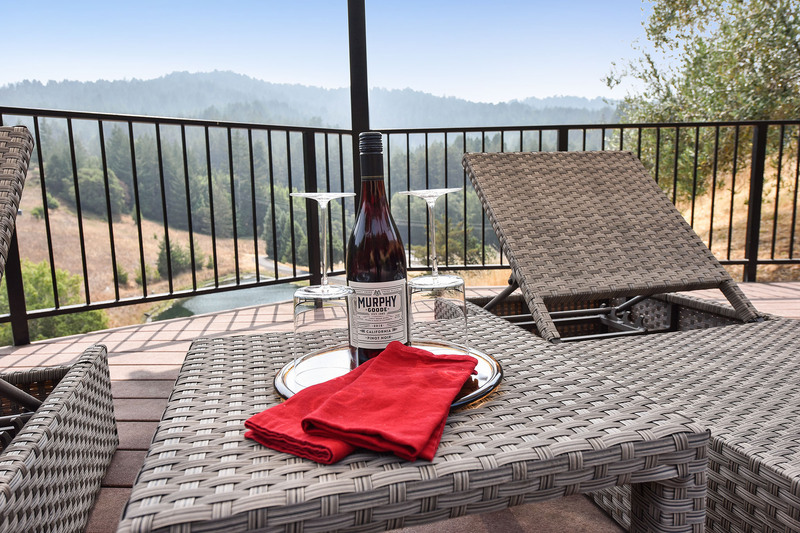 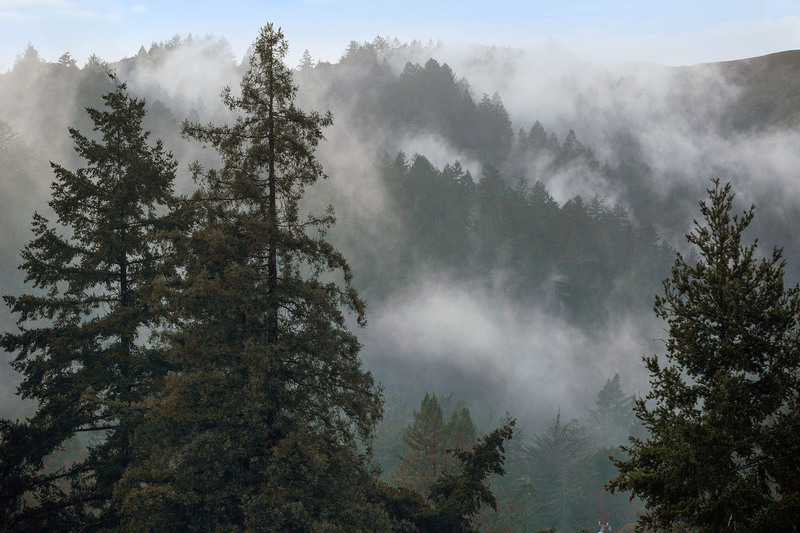 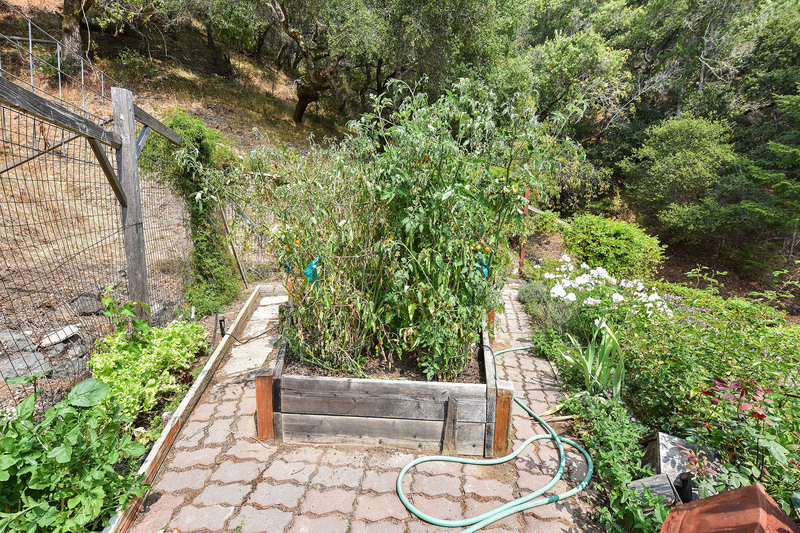 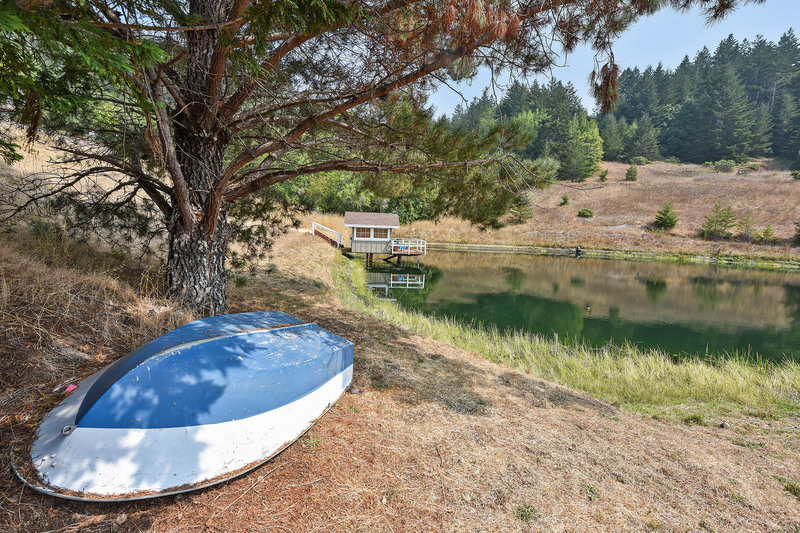 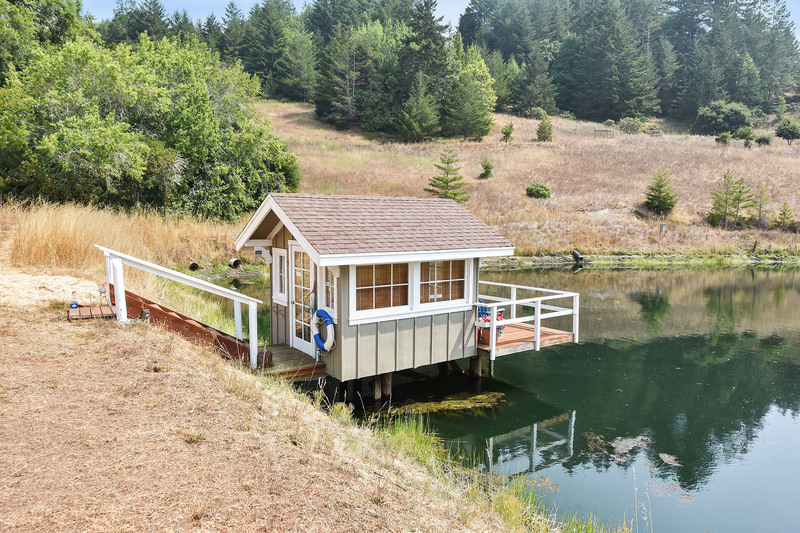 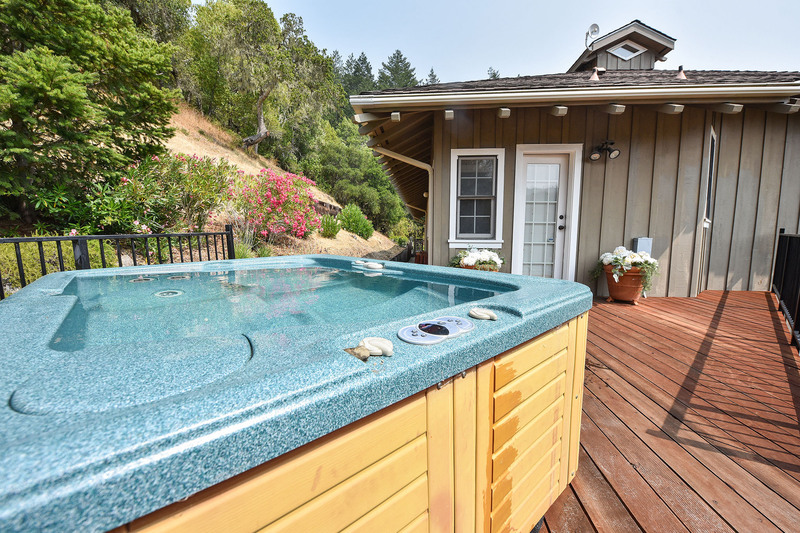 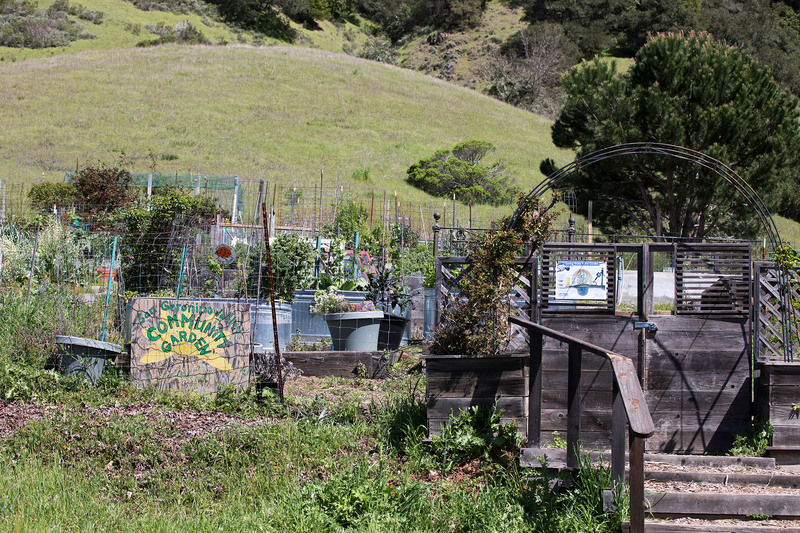 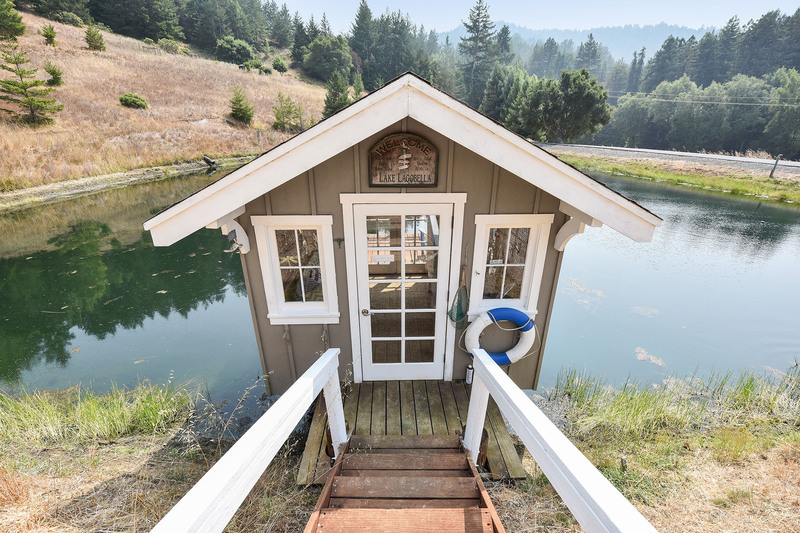 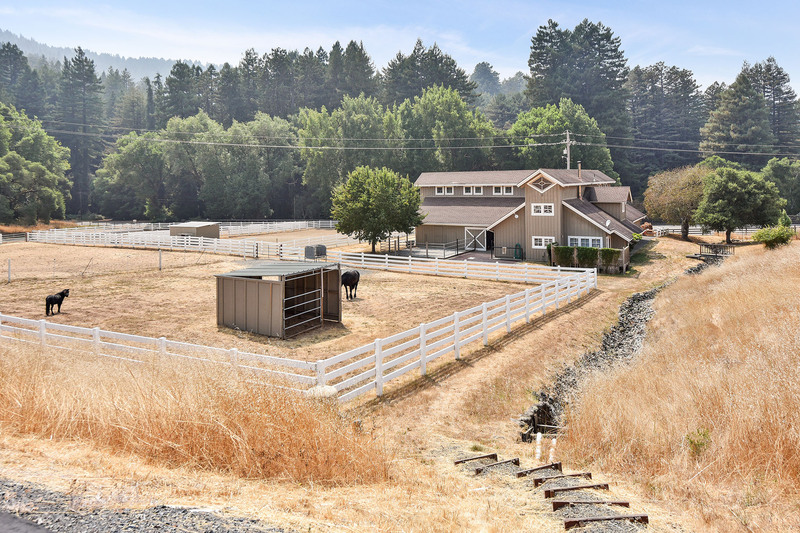 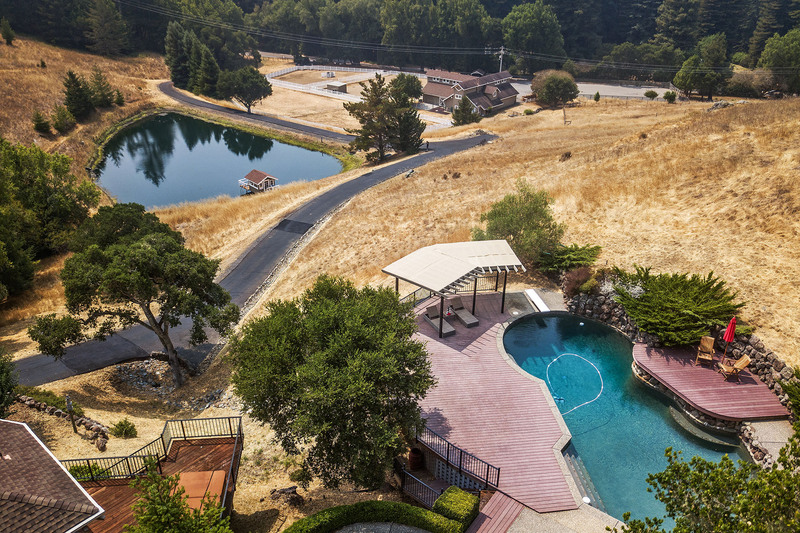 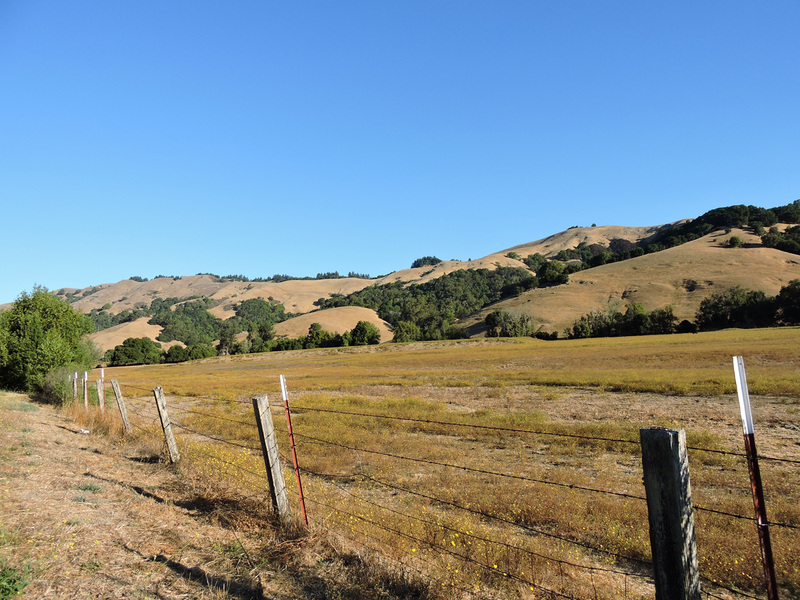 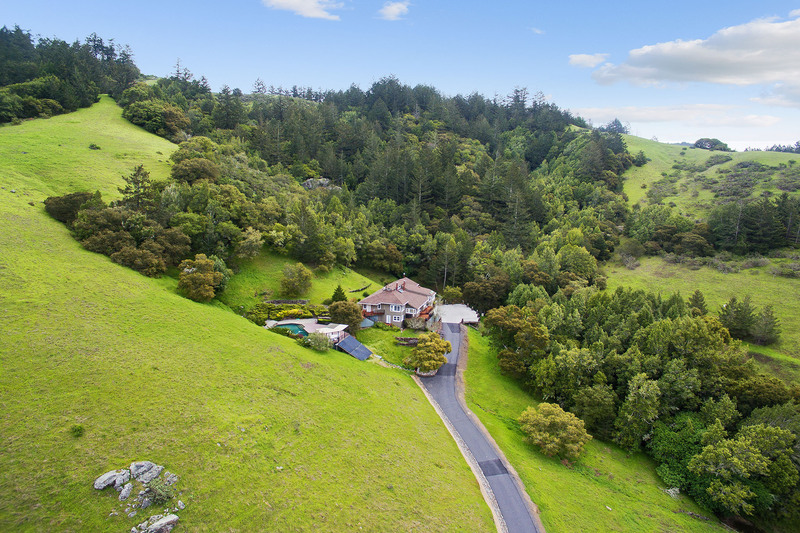 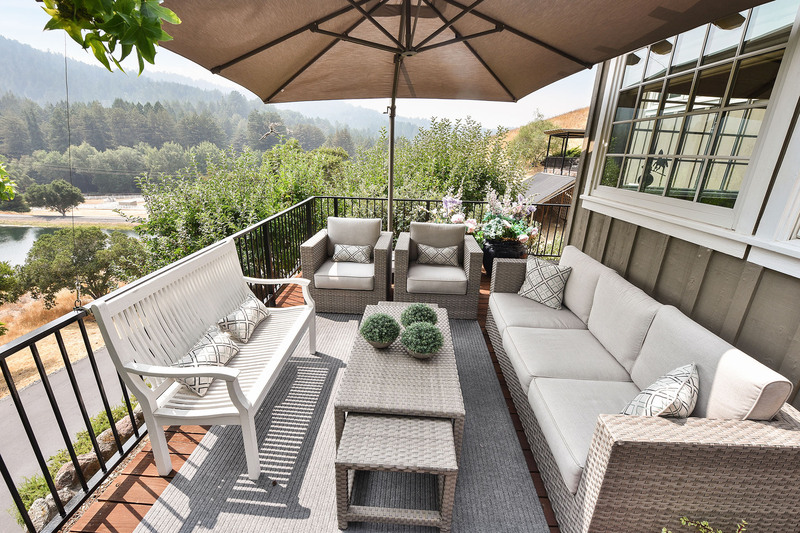 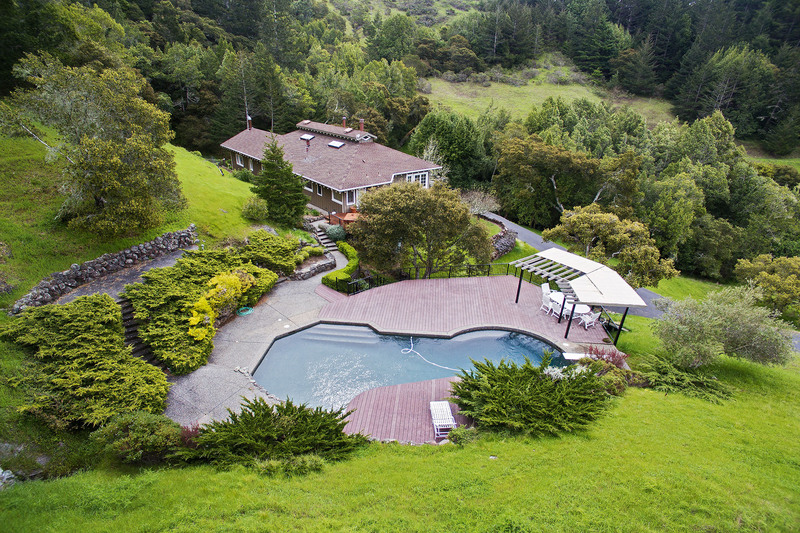 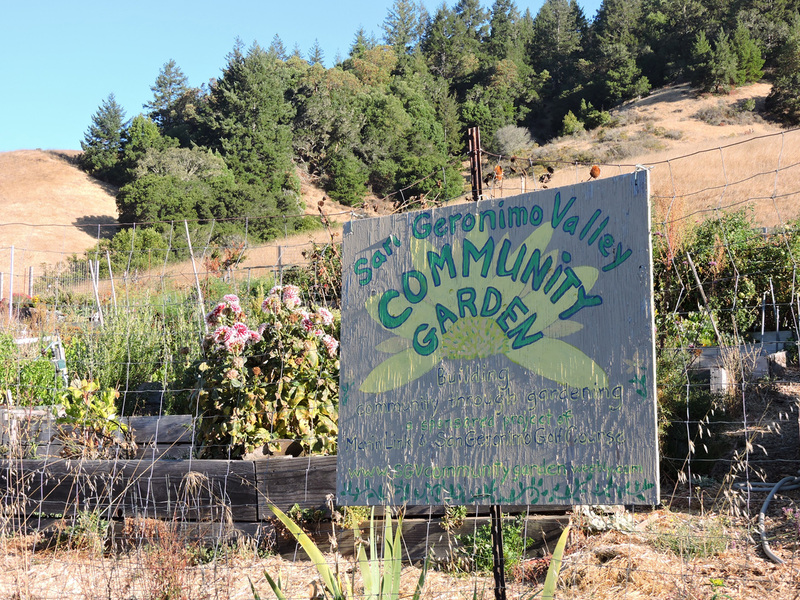 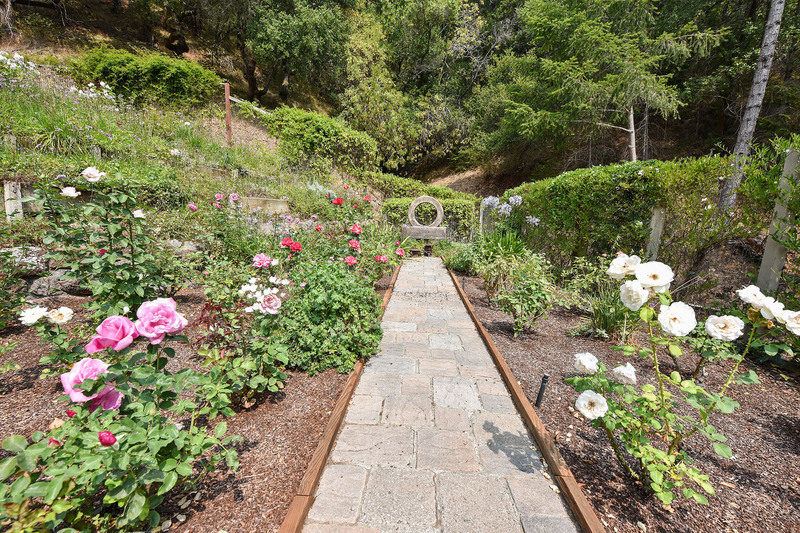 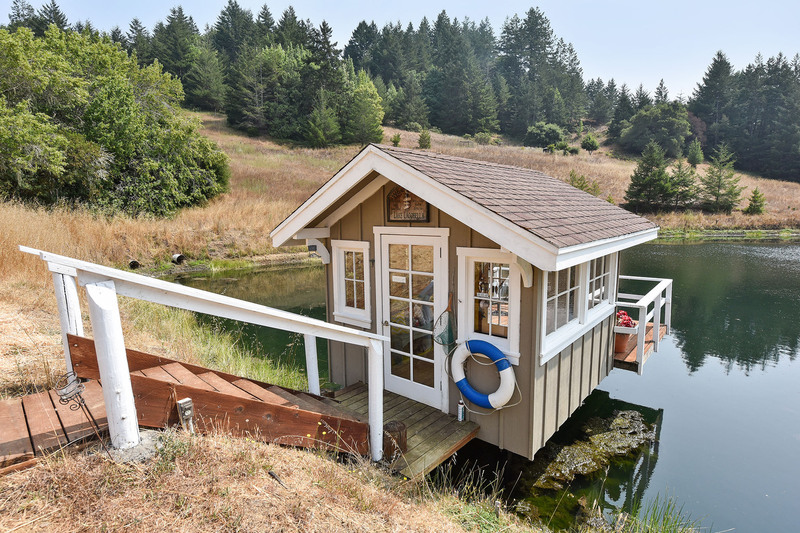 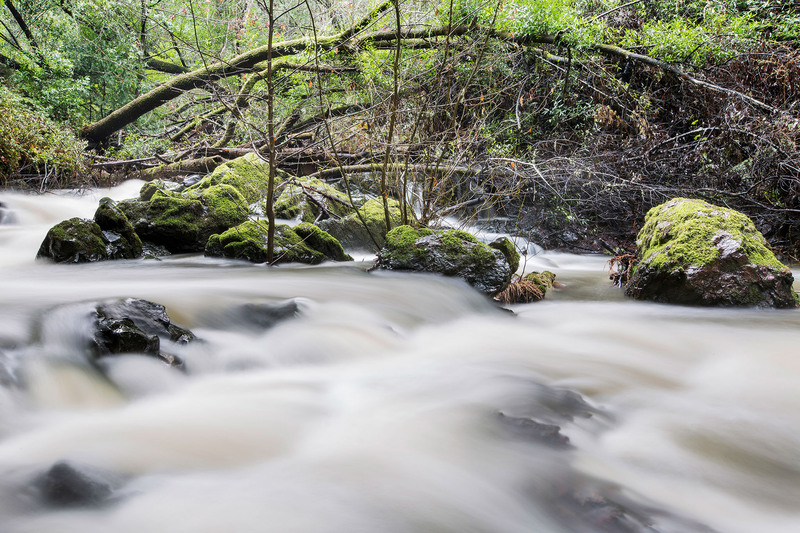 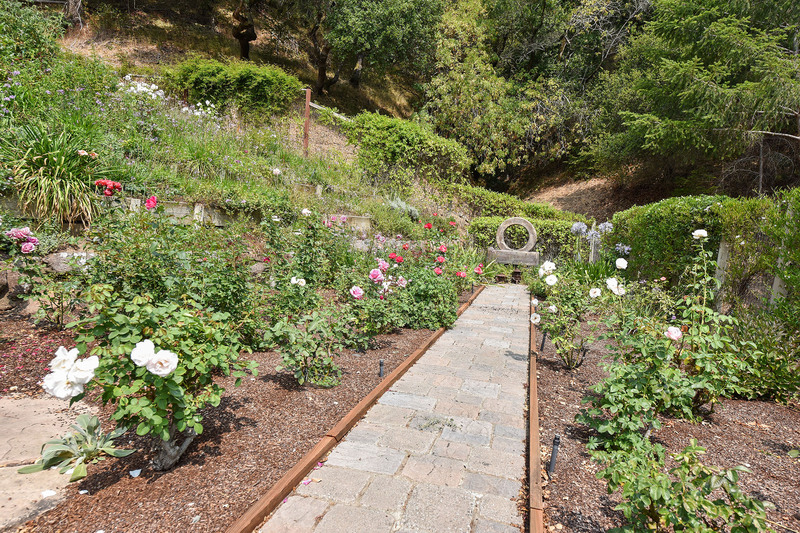 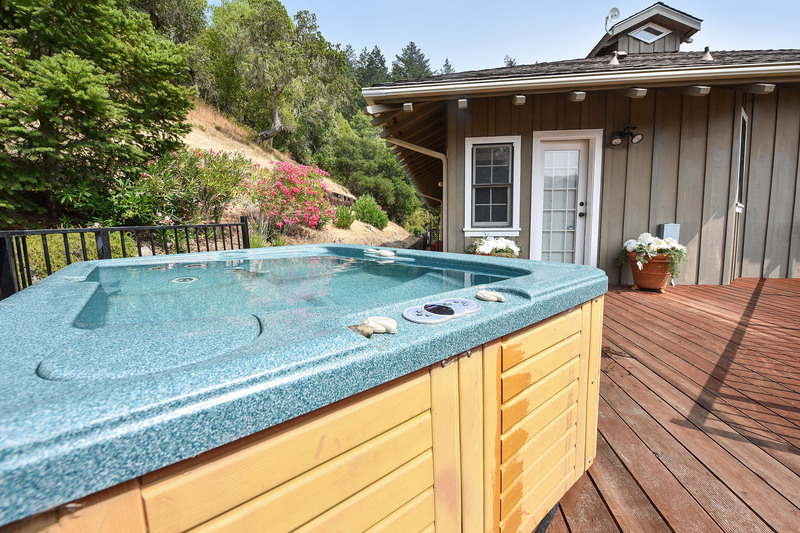 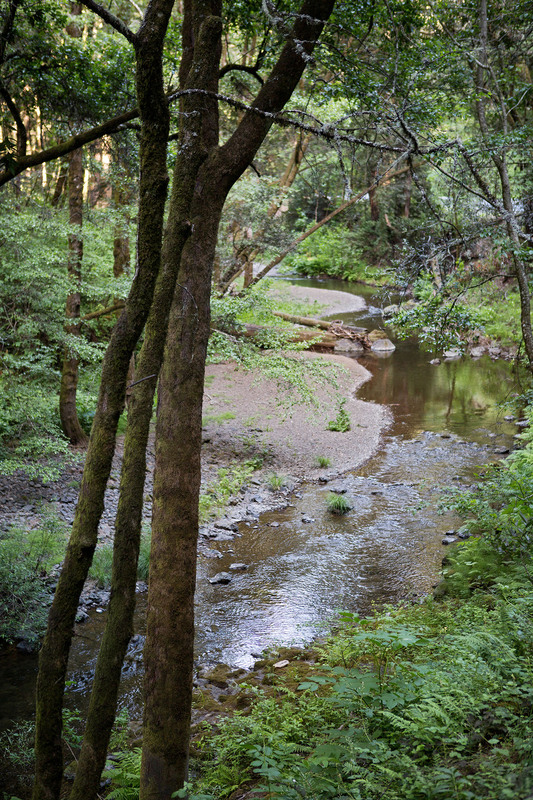 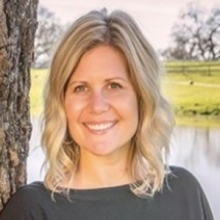 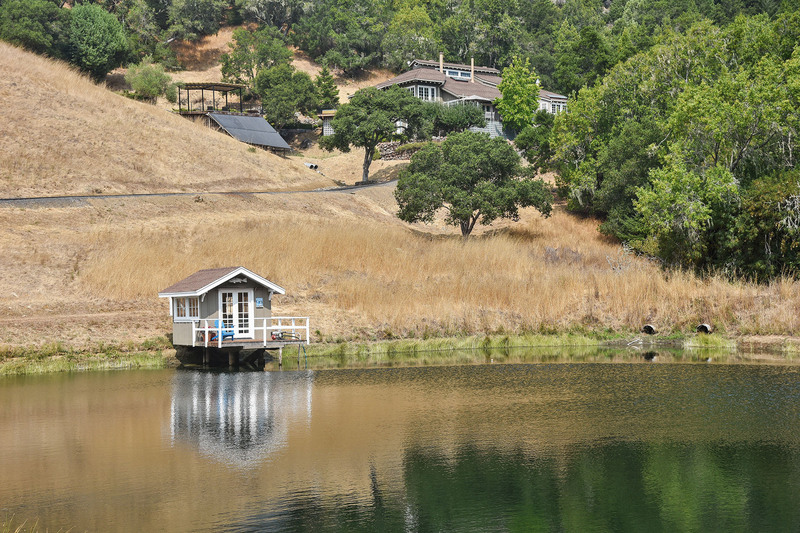 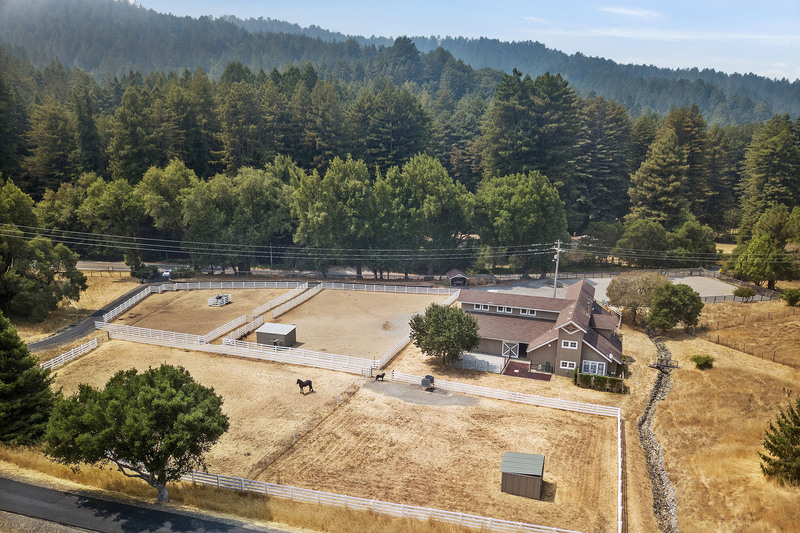 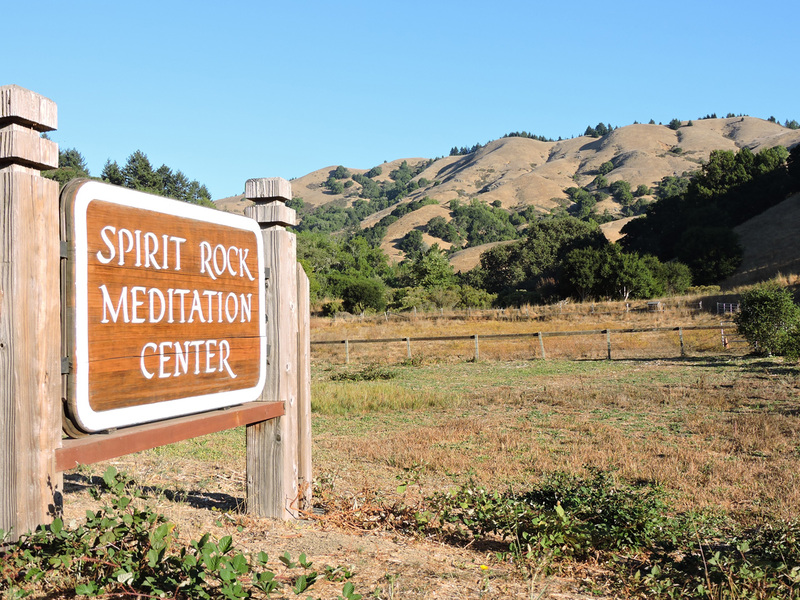 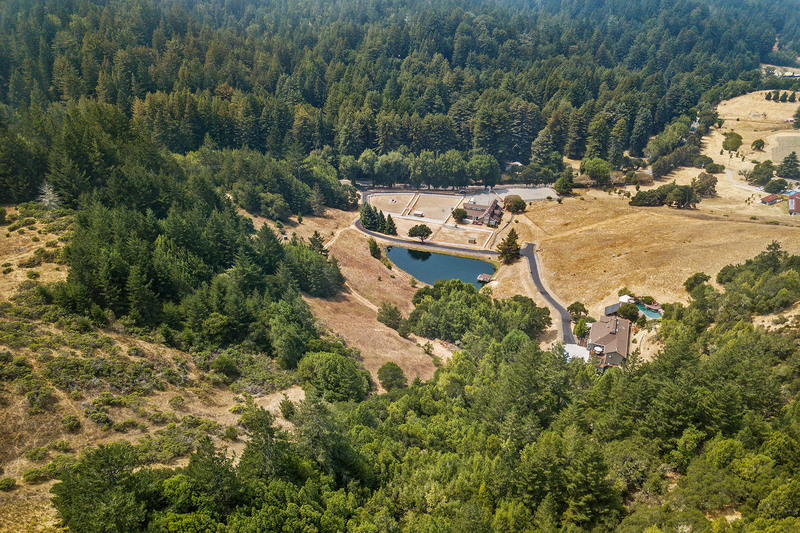 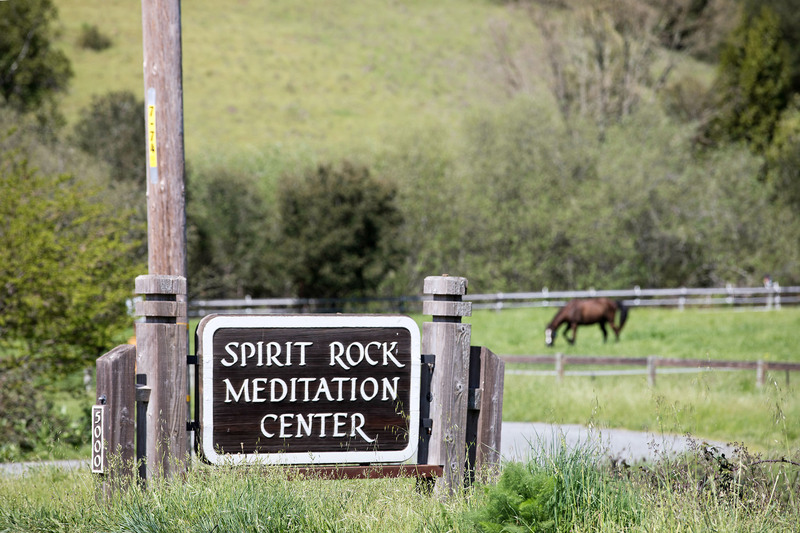 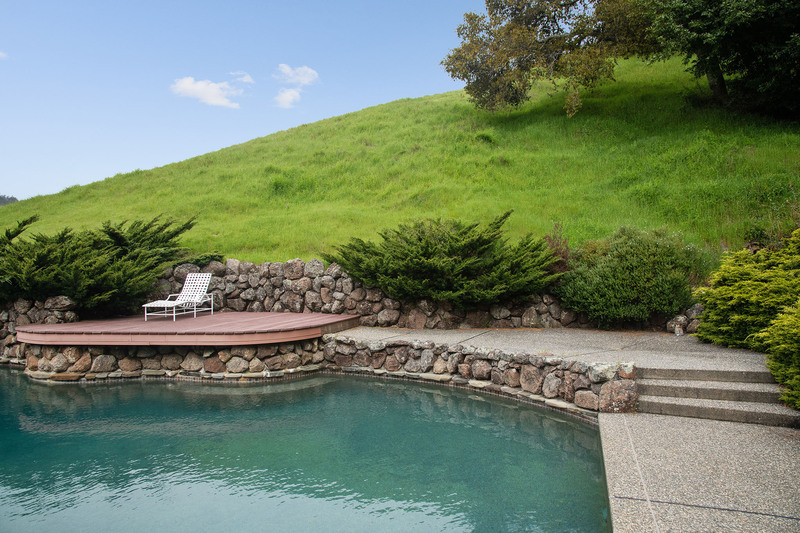 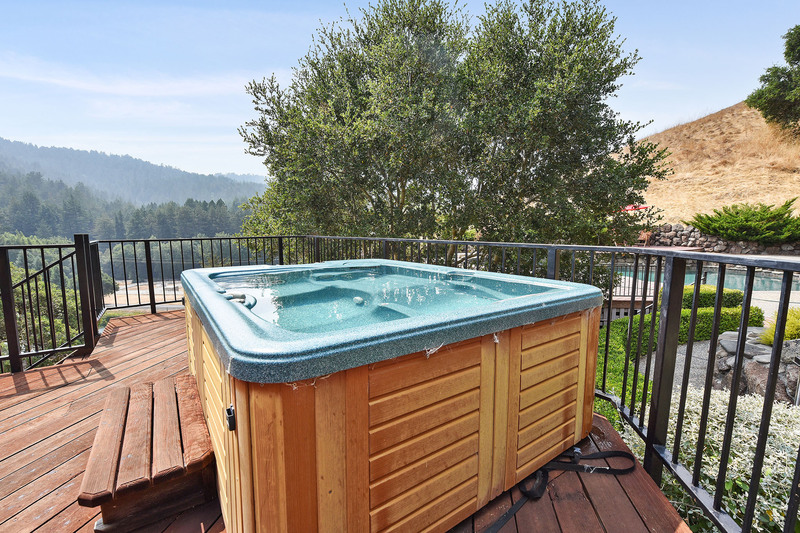 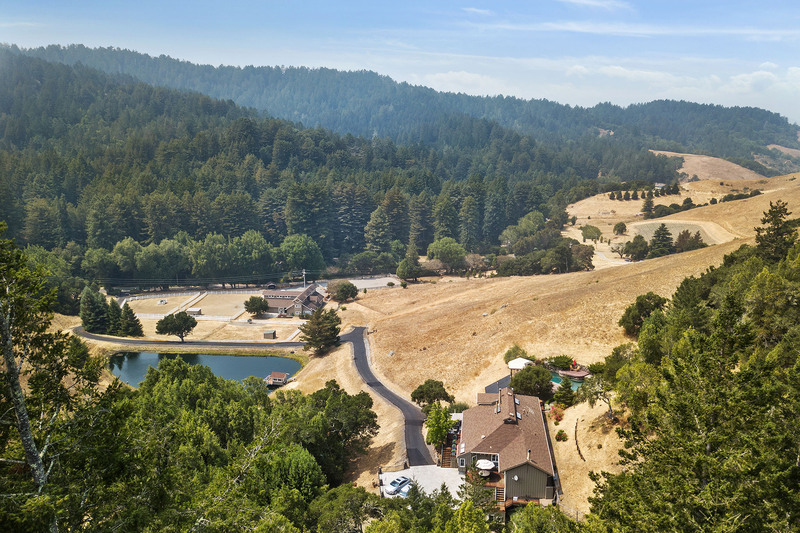 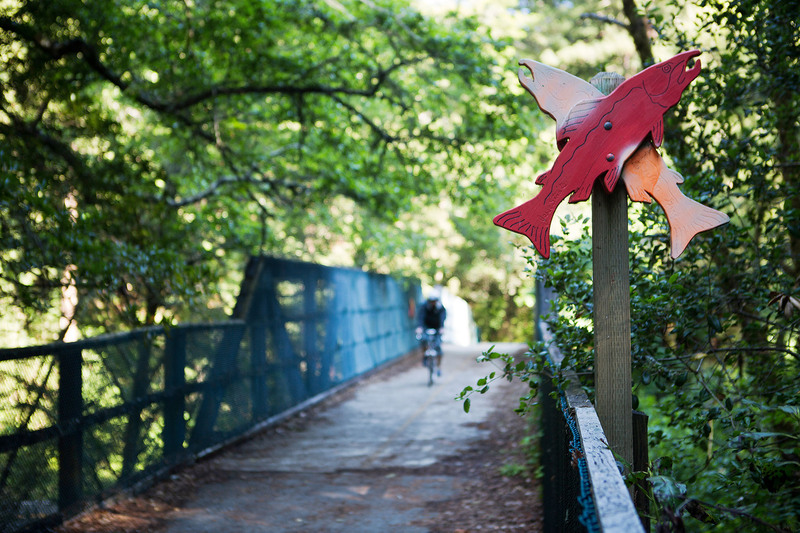 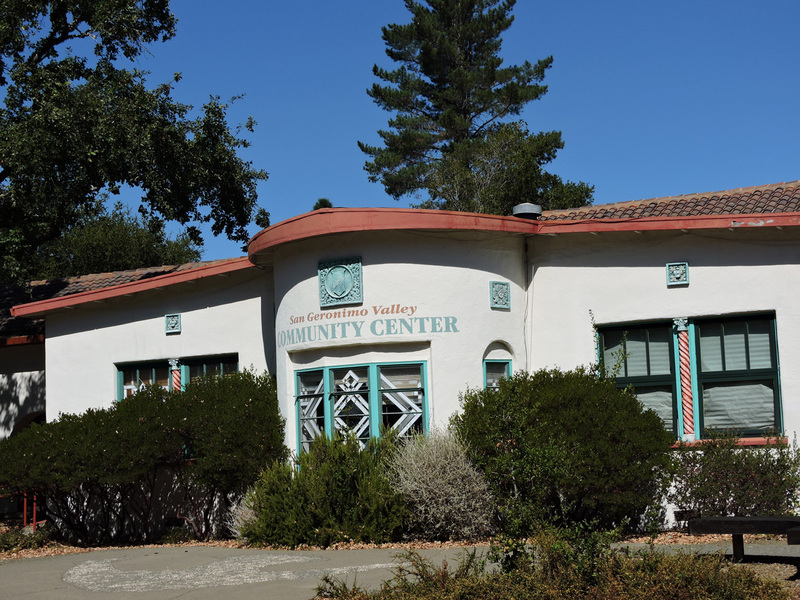 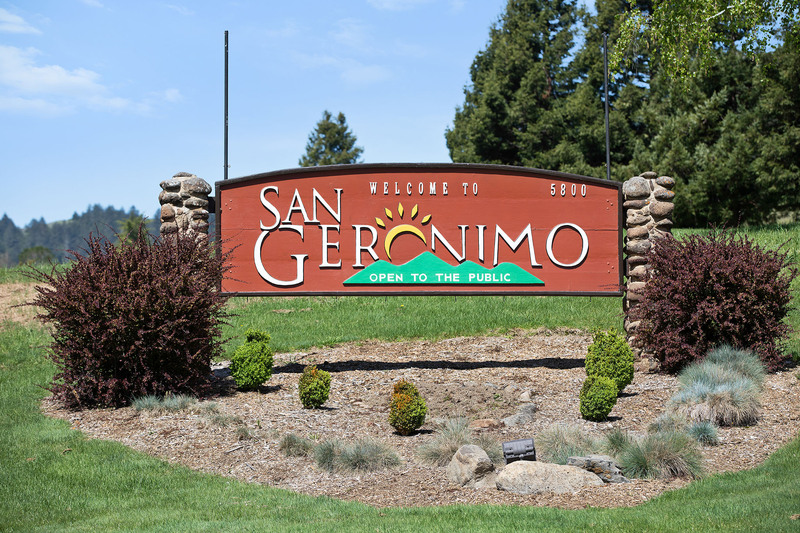 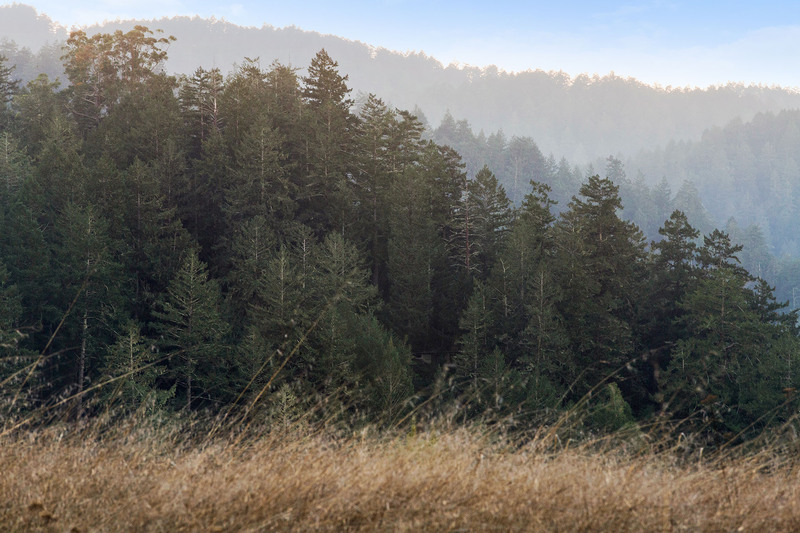 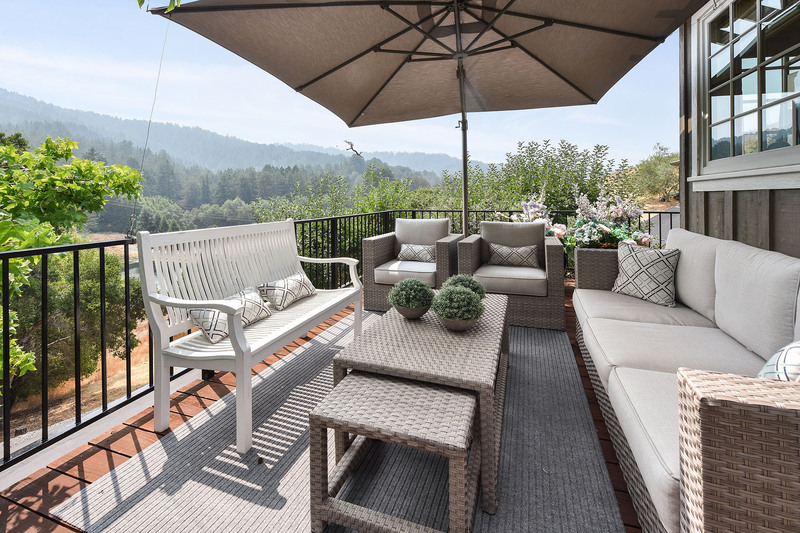 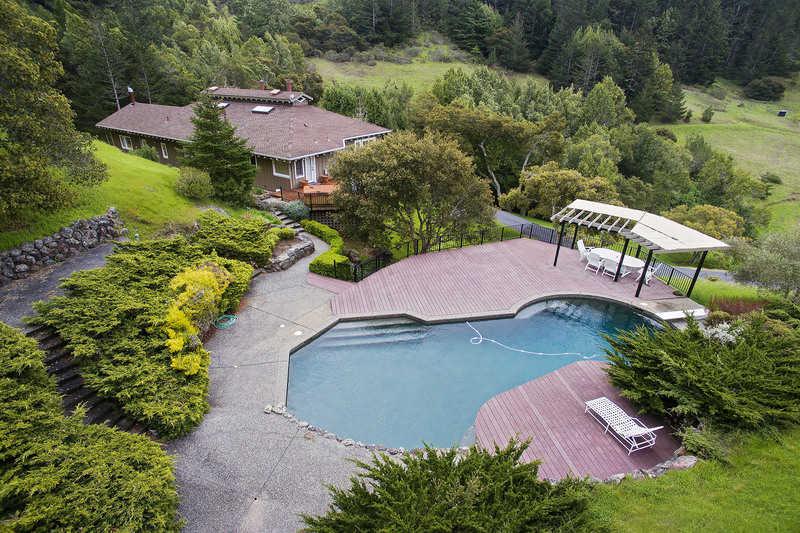 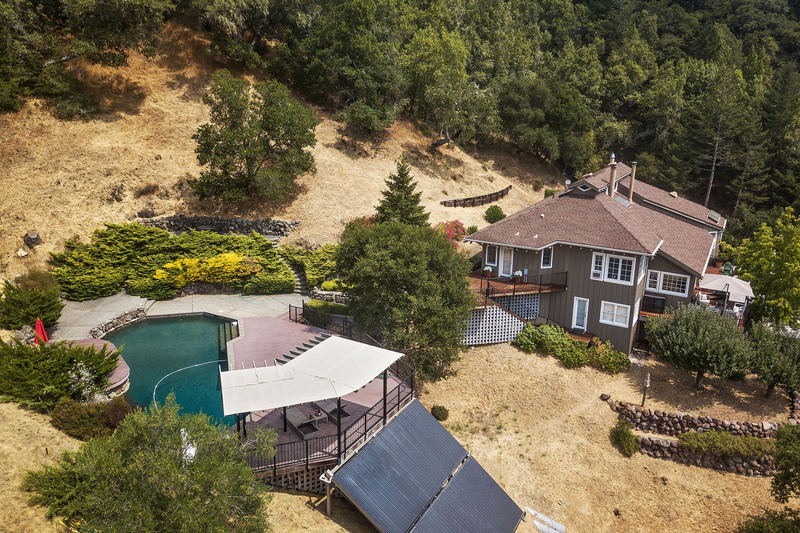 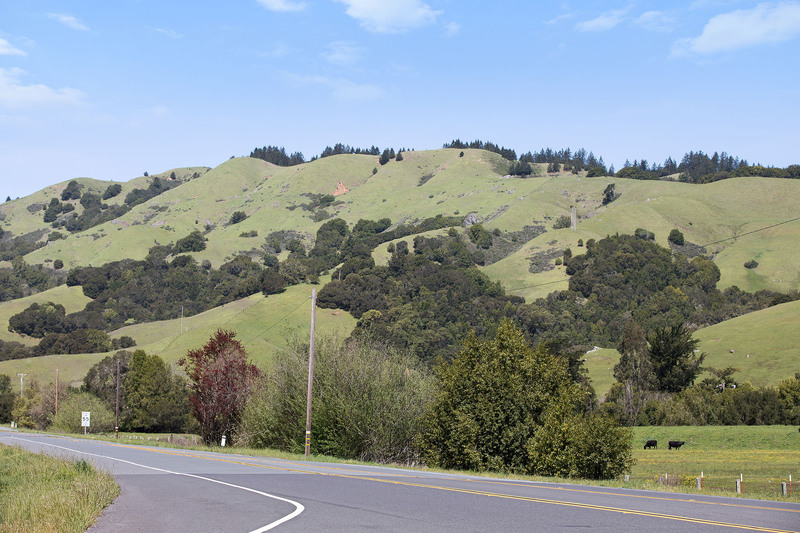 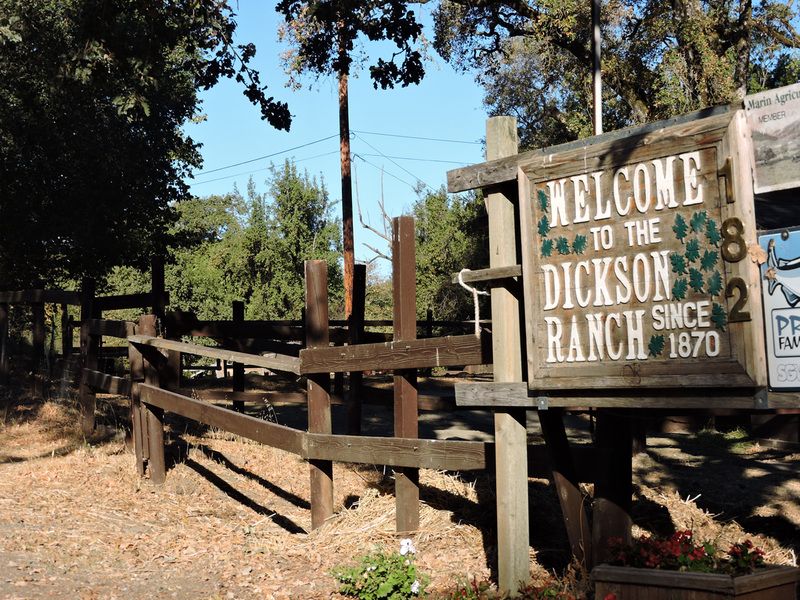 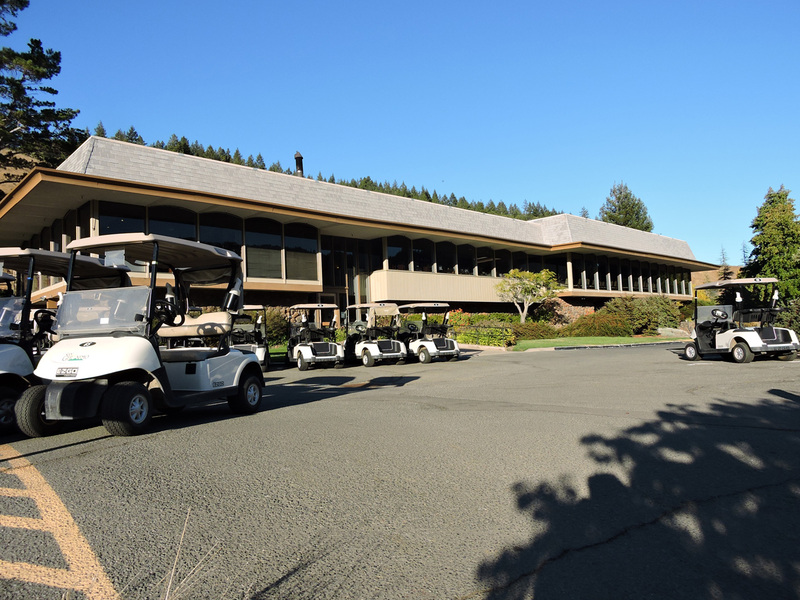 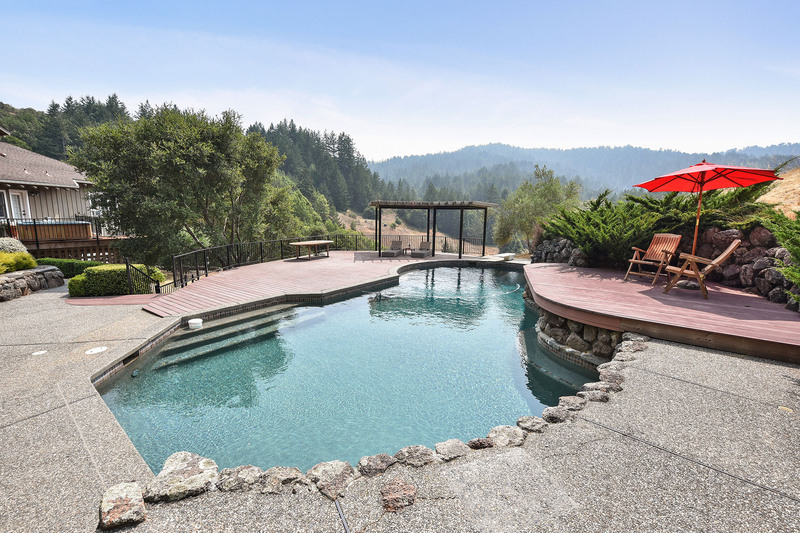 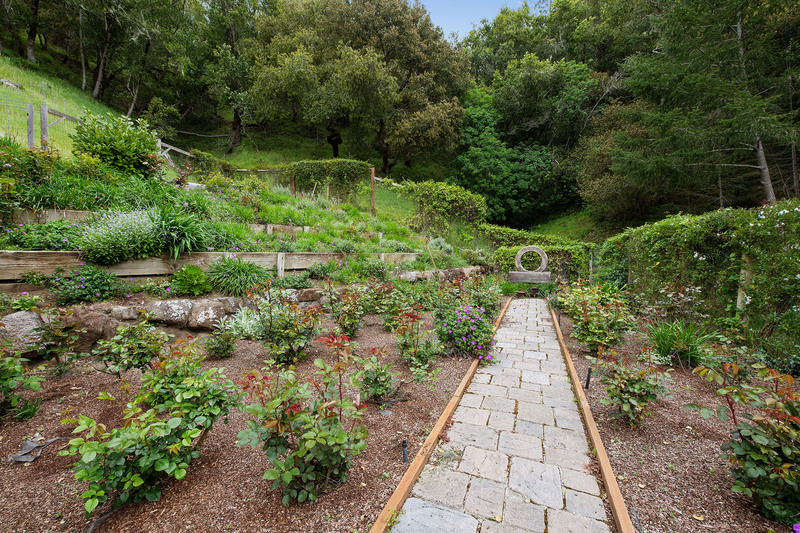 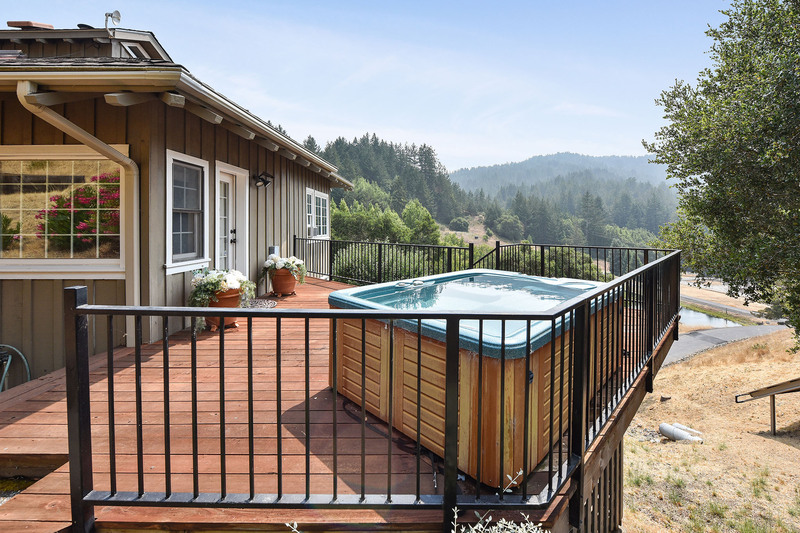 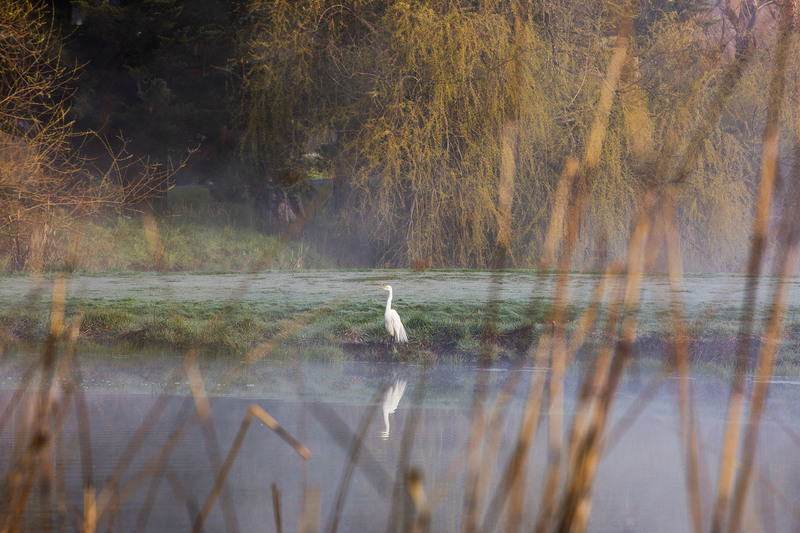 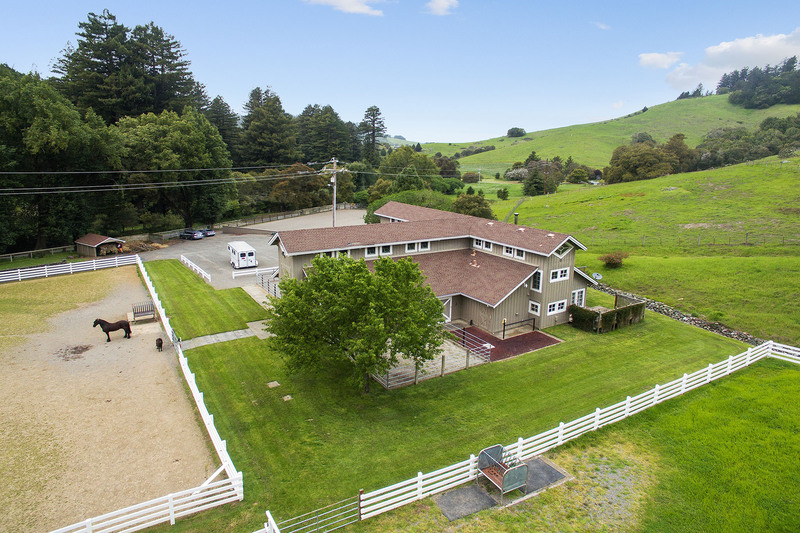 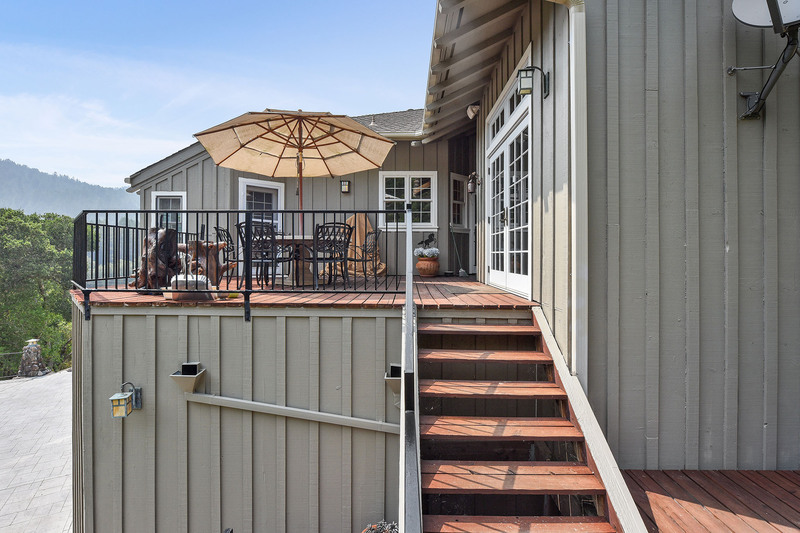 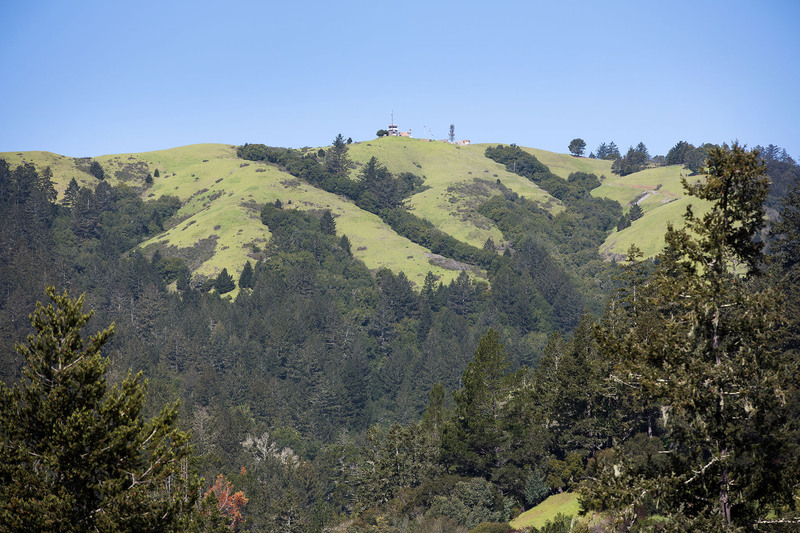 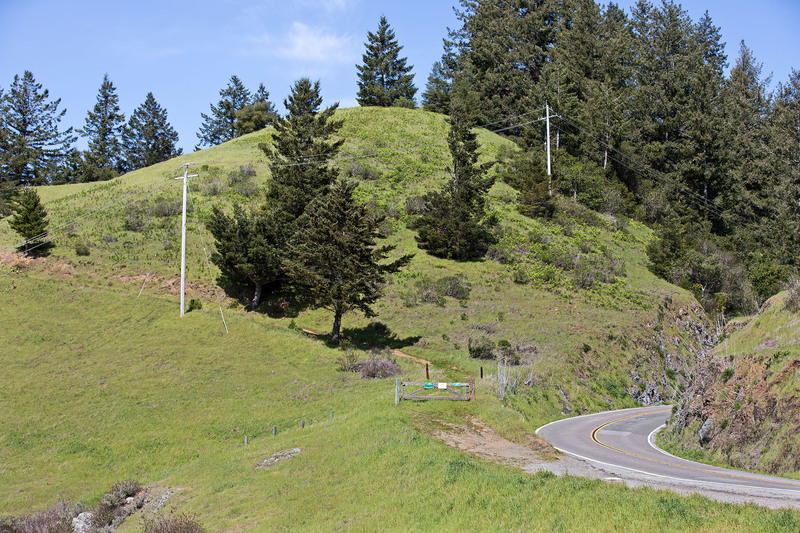 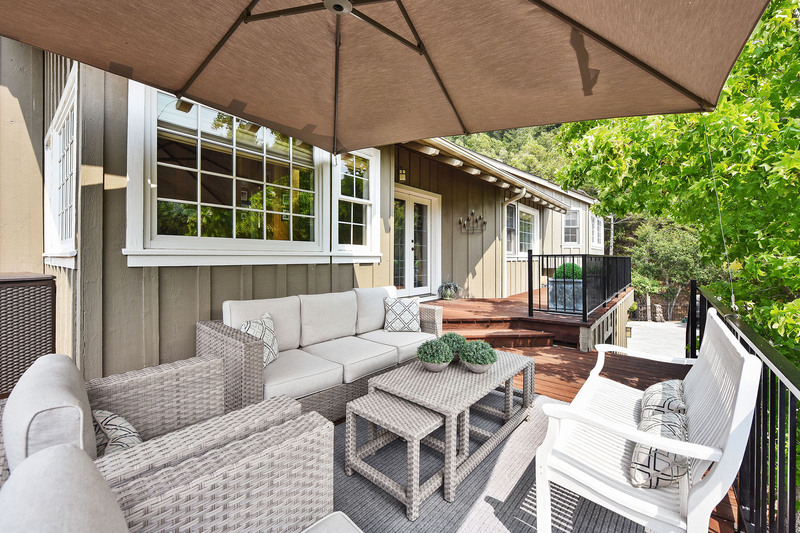 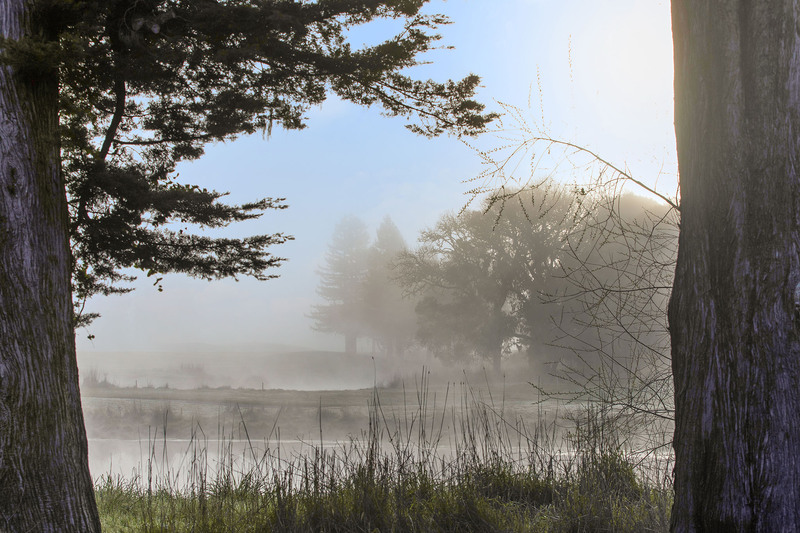 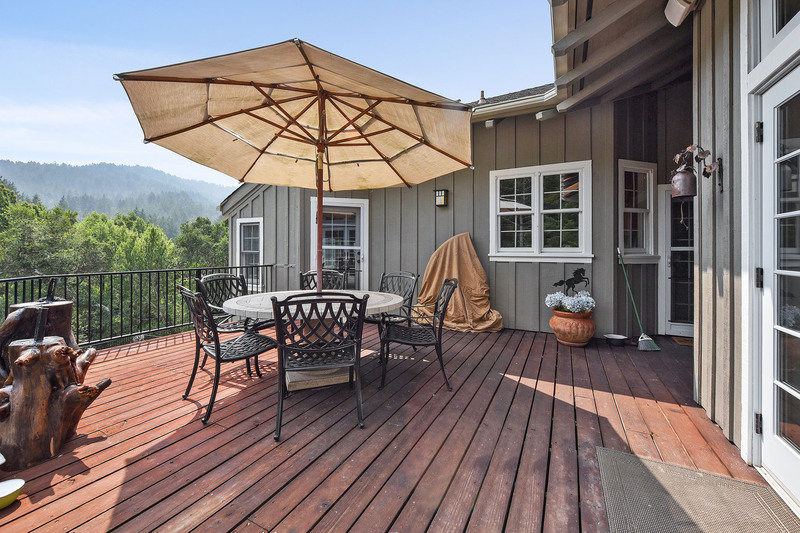 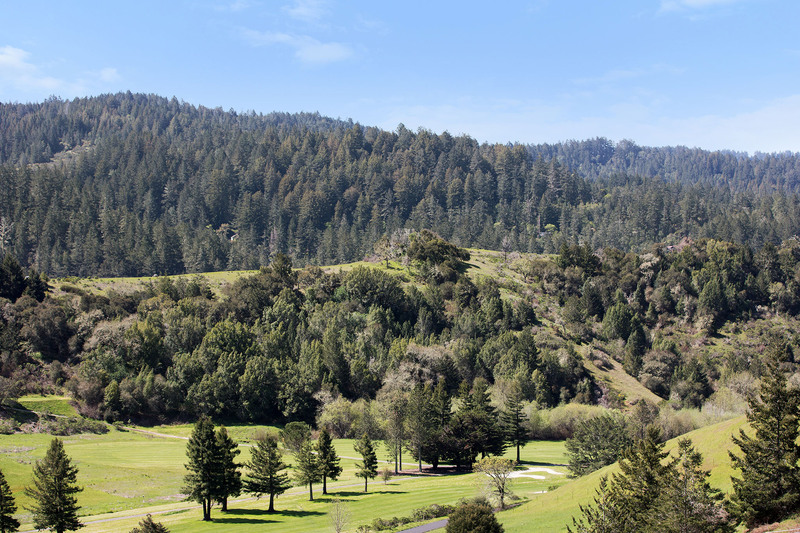 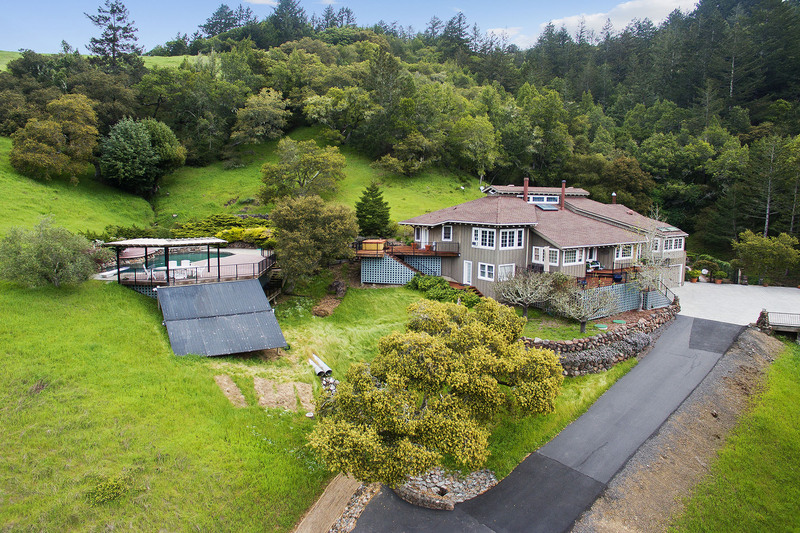 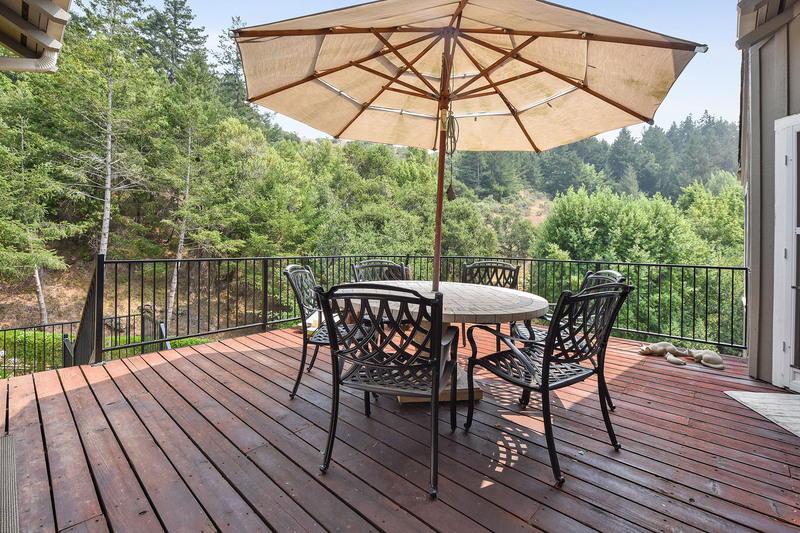 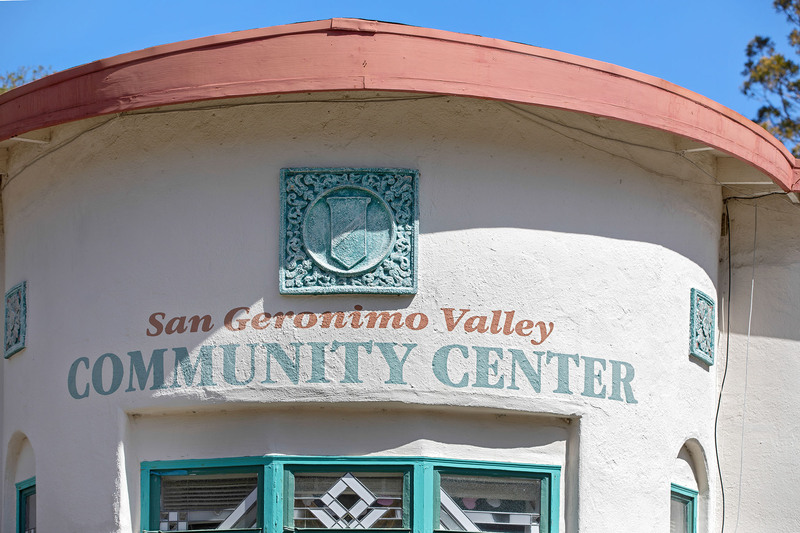 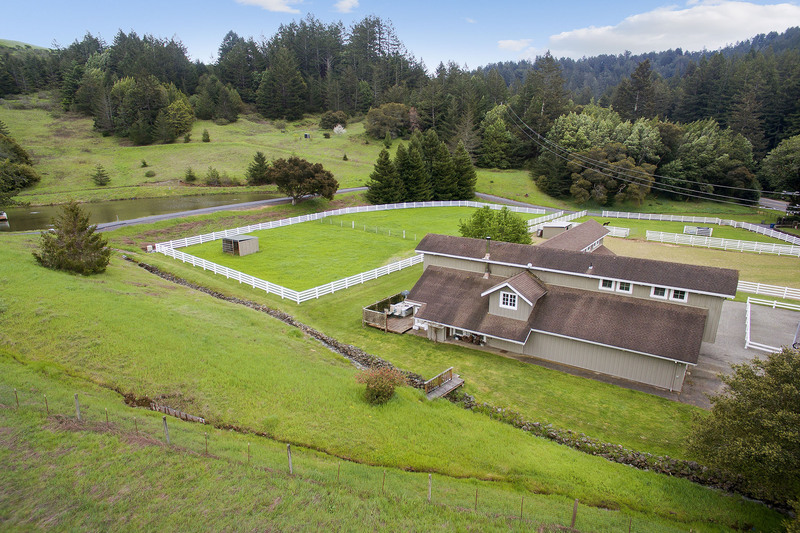 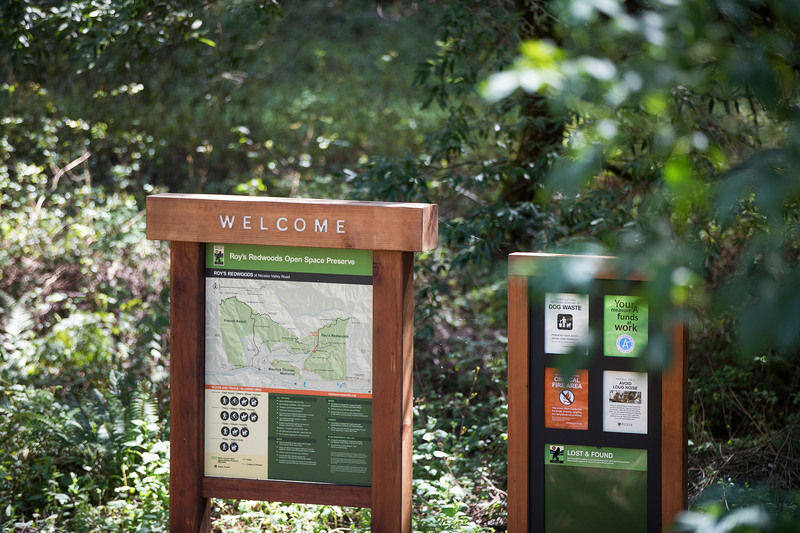 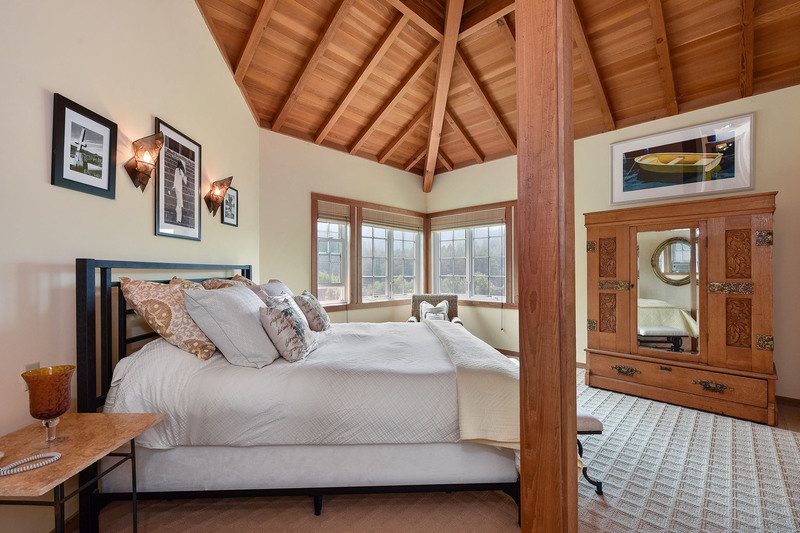 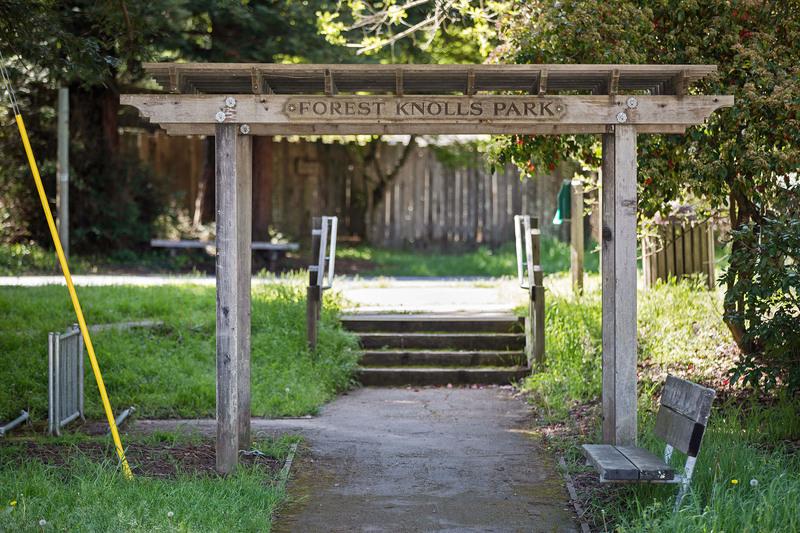 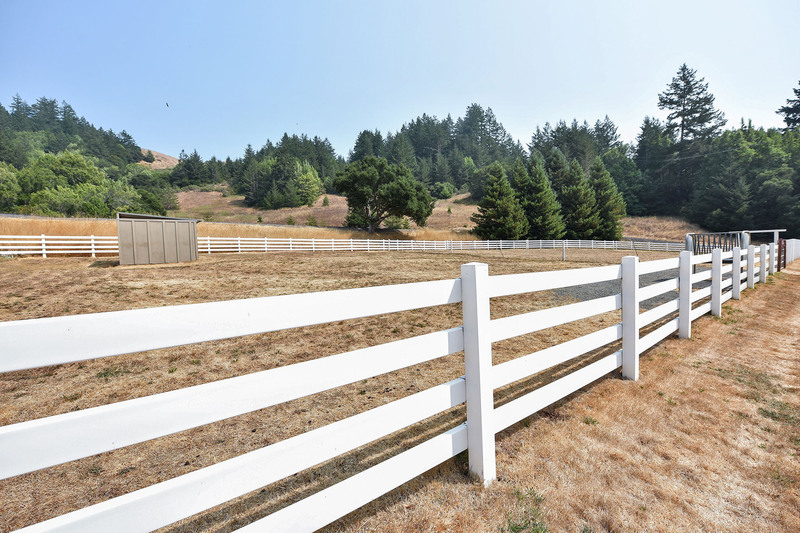 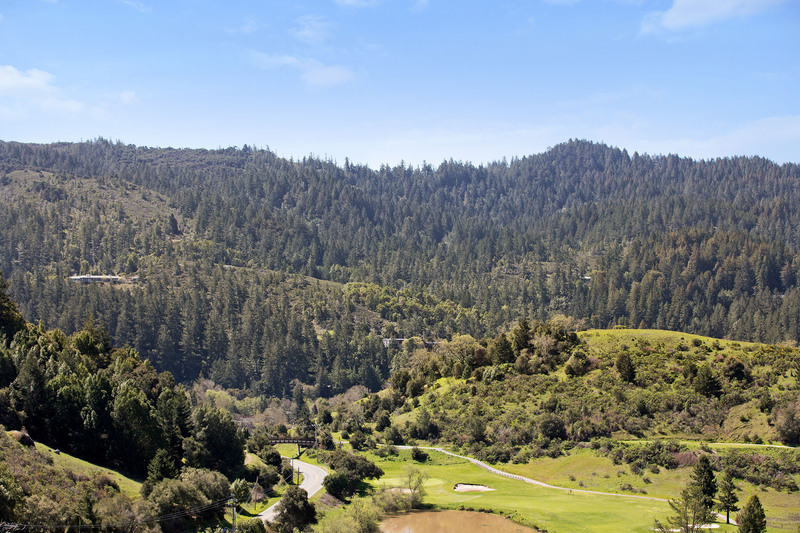 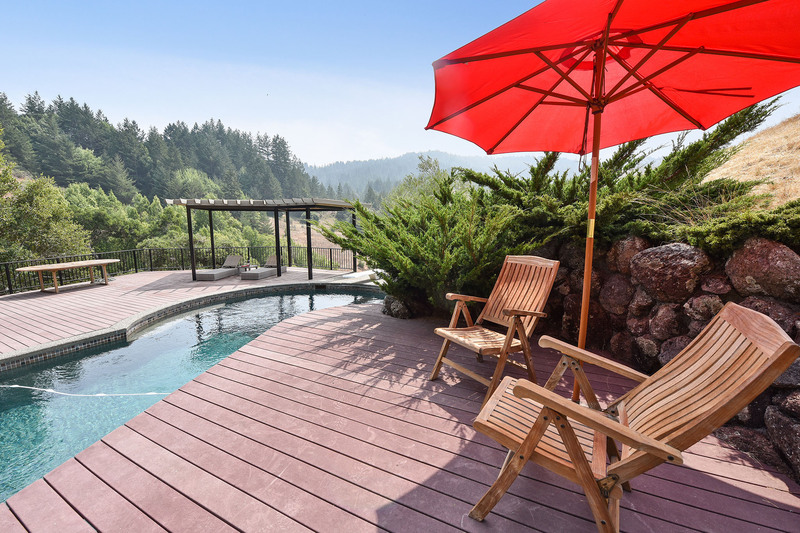 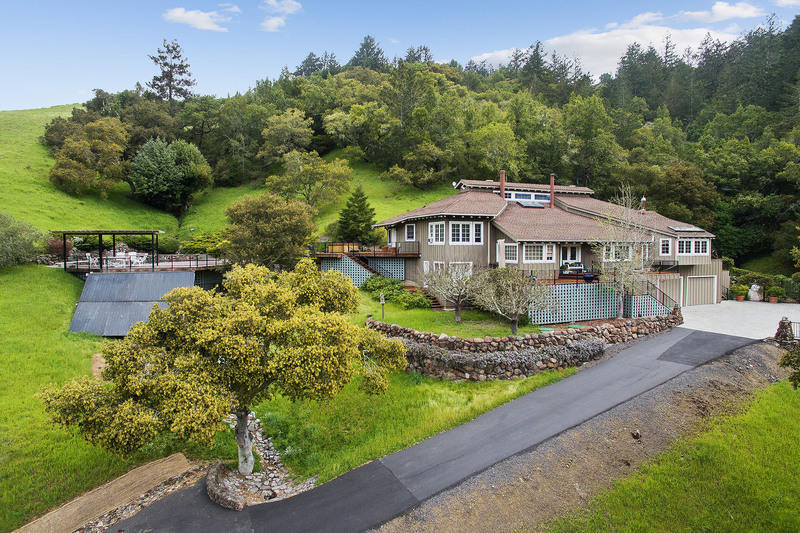 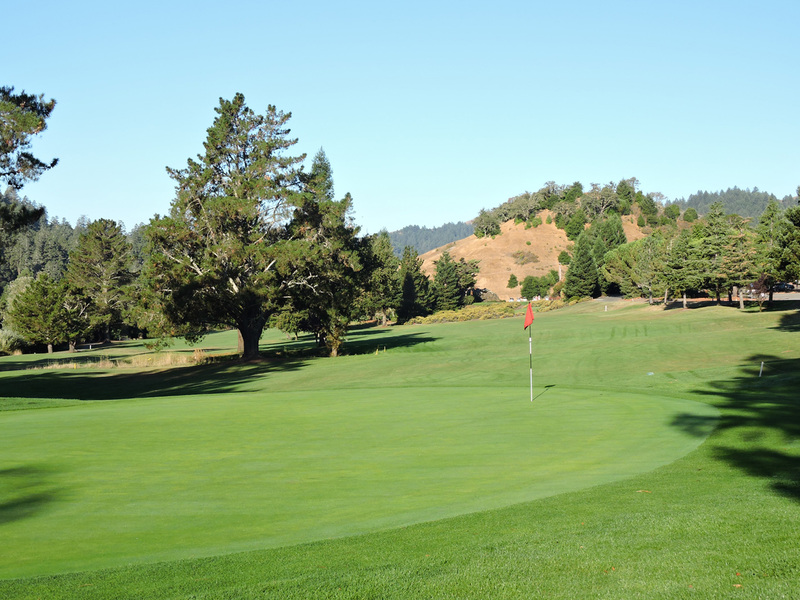 Nestled in the Nicasio Valley, between San Geronimo and Samuel P Taylor Park you’ll find an idyllic country property where you can escape and explore the natural world, just minutes from the hustle & bustle of city life. 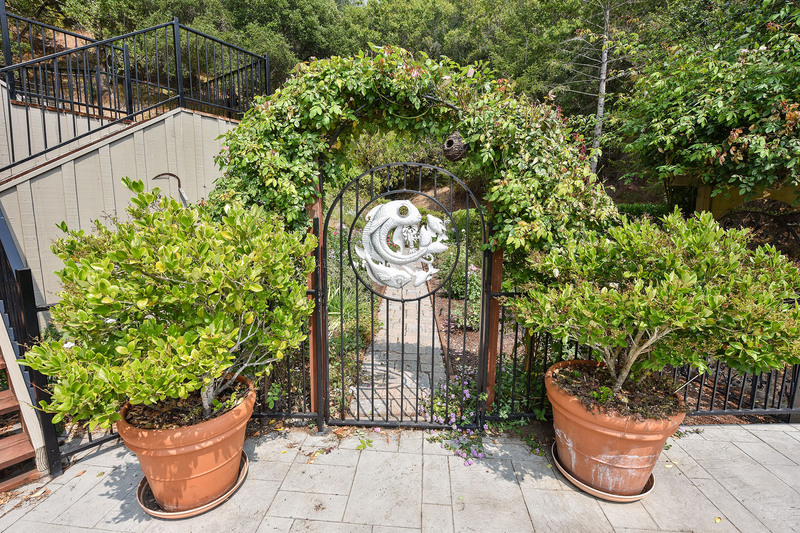 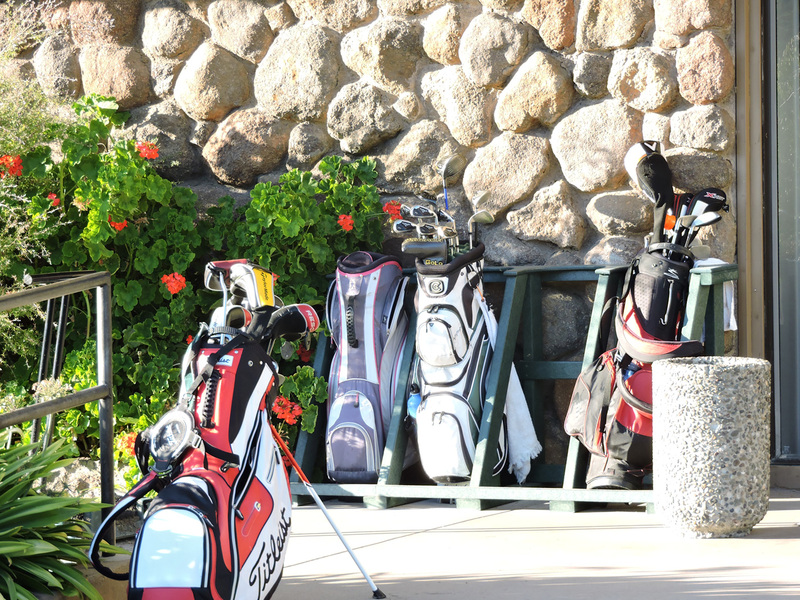 The setting is idyllic and you’ll feel how special it is when you drive through the gate. 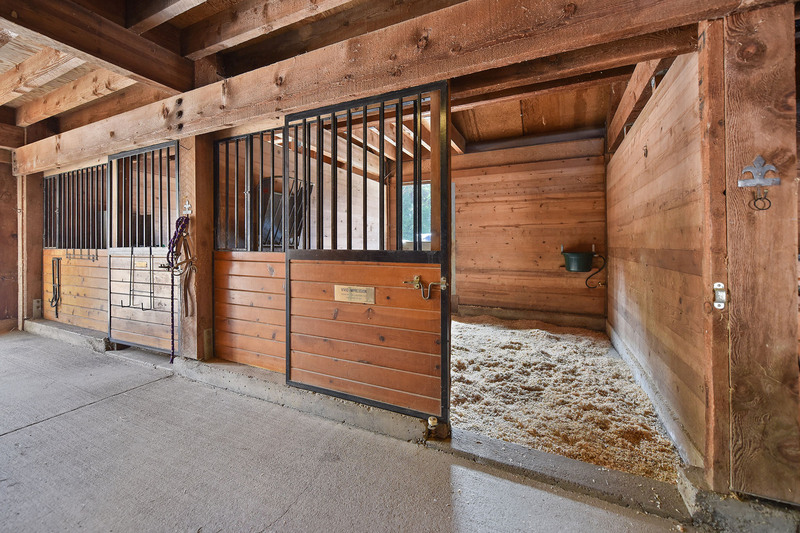 You’ll notice a definite sense of peace here, as you leave the cares and stresses of the world at the gate and come home to a calm and quiet place. 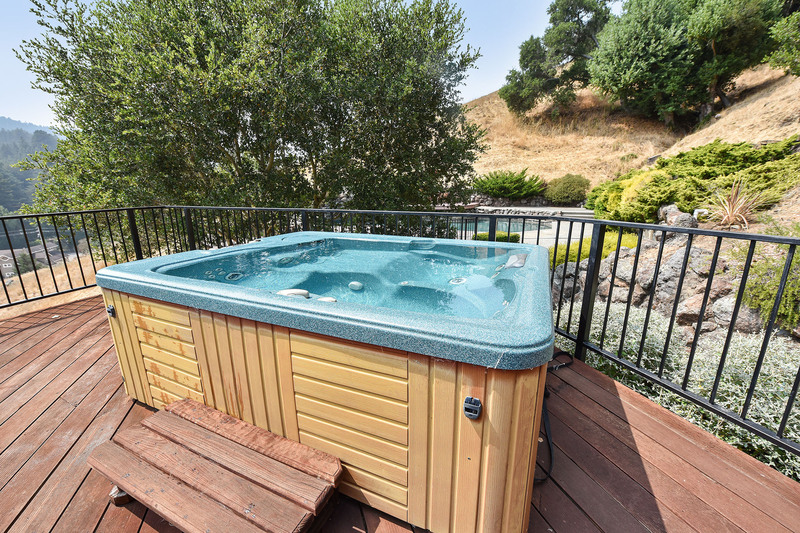 One with all the amenities to satisfy your many interests. 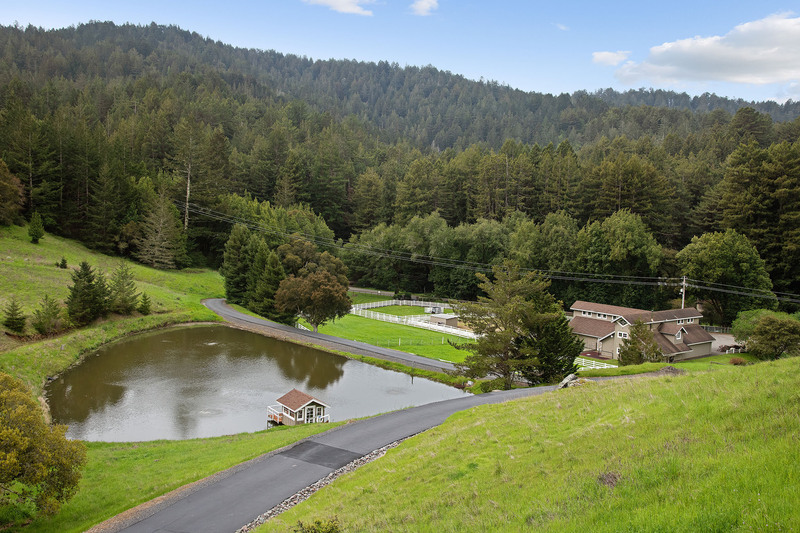 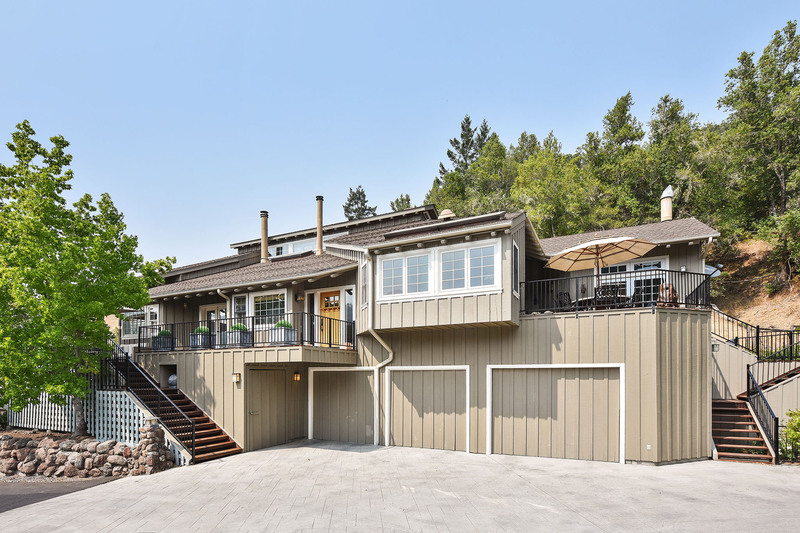 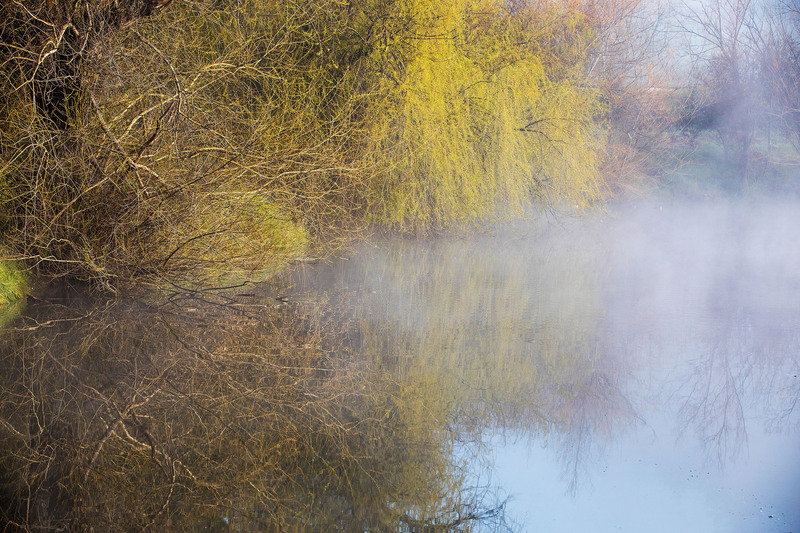 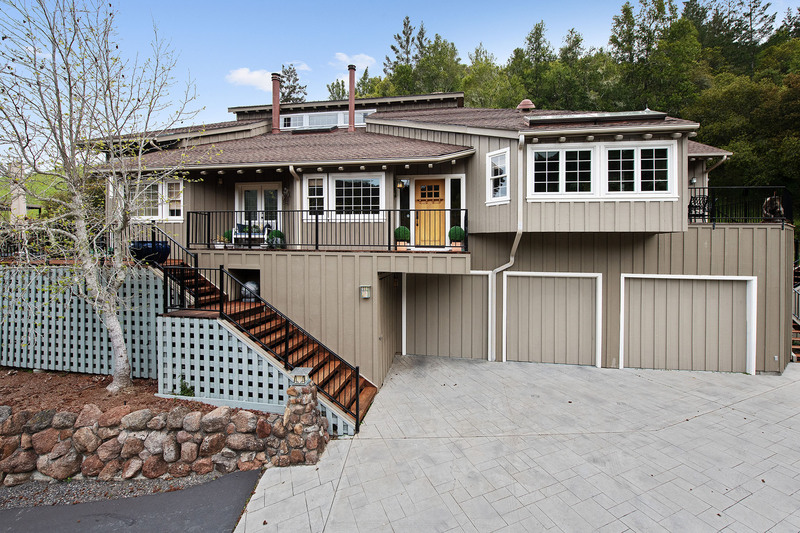 From the main home, set way back off the road, you overlook the pretty pond and watch the ducks and geese swim as they travel through the valley. 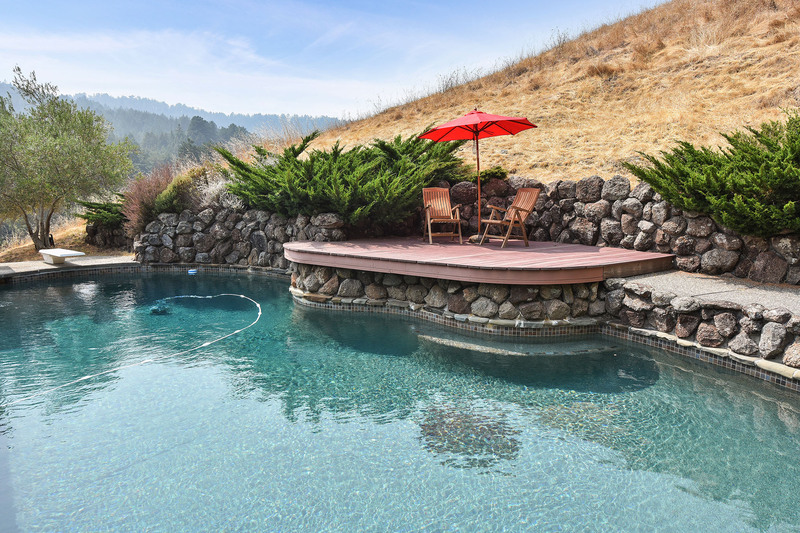 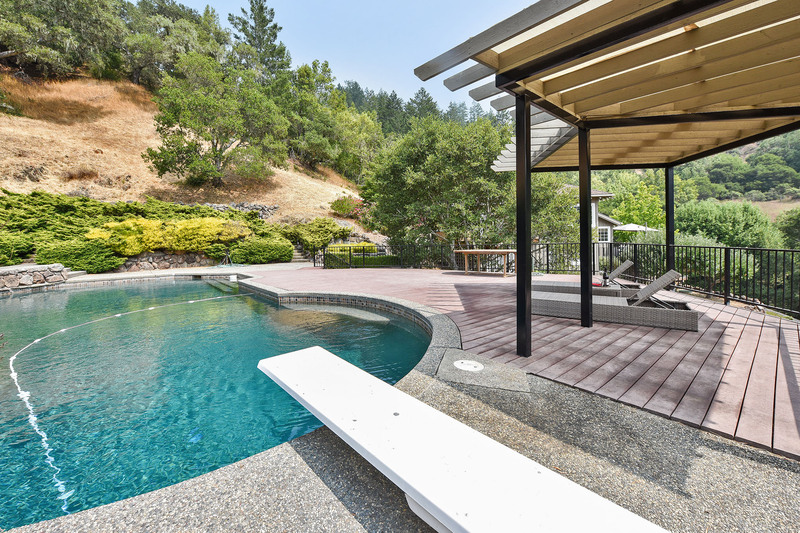 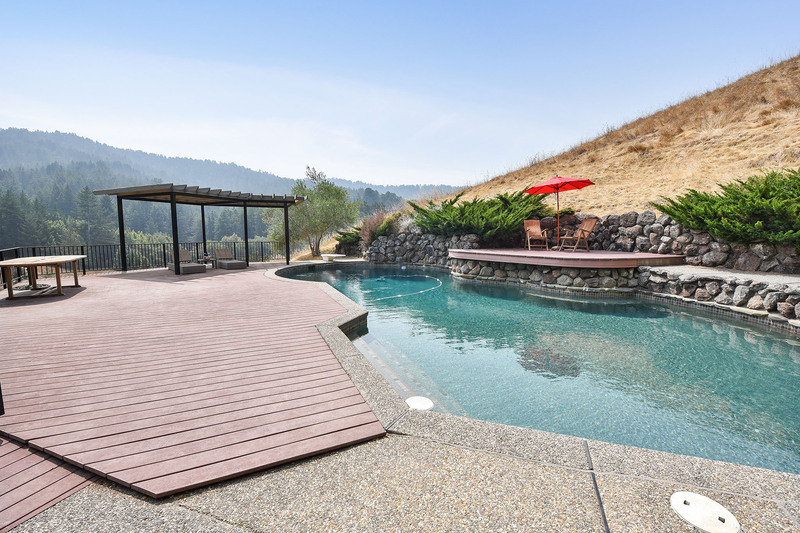 Out back, you have another water view- a beautiful pool with expansive decking for entertaining. 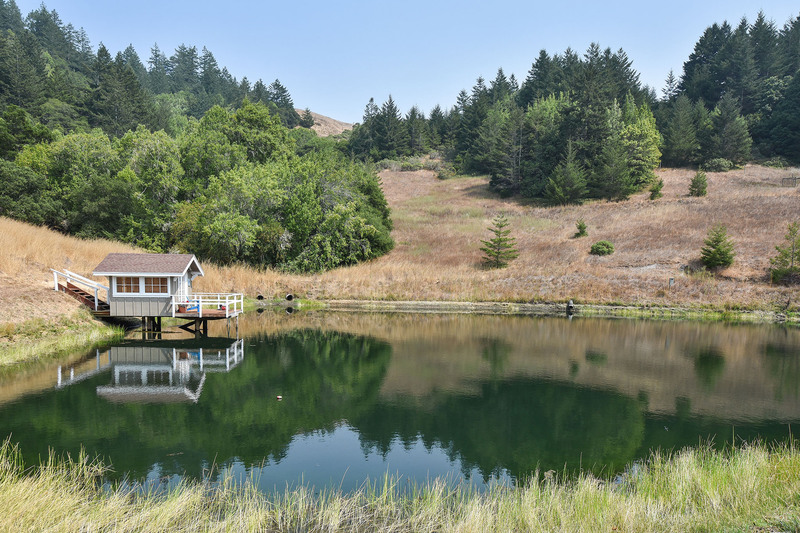 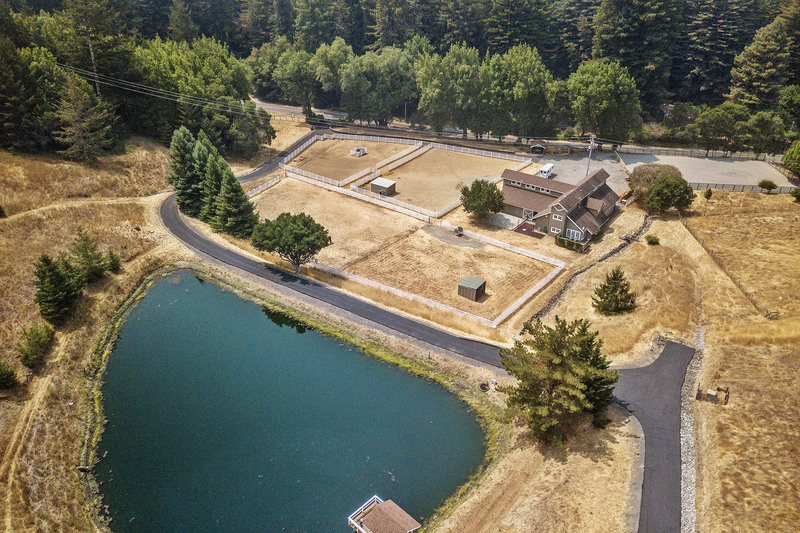 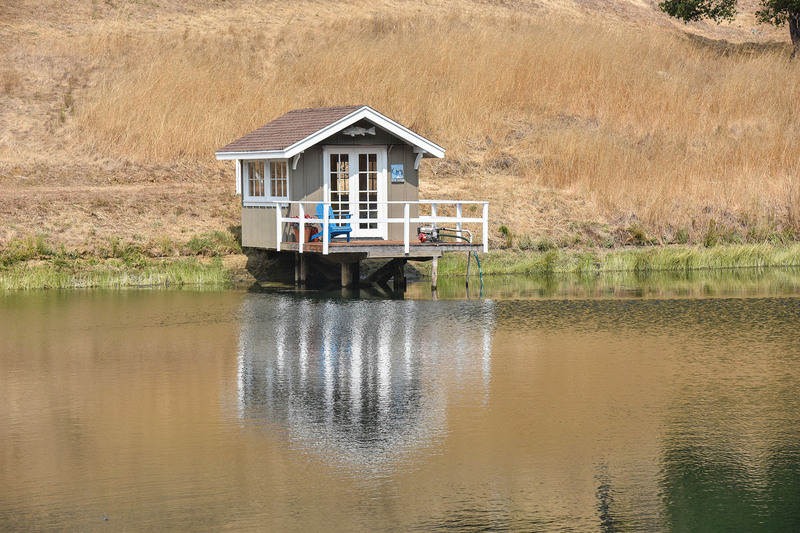 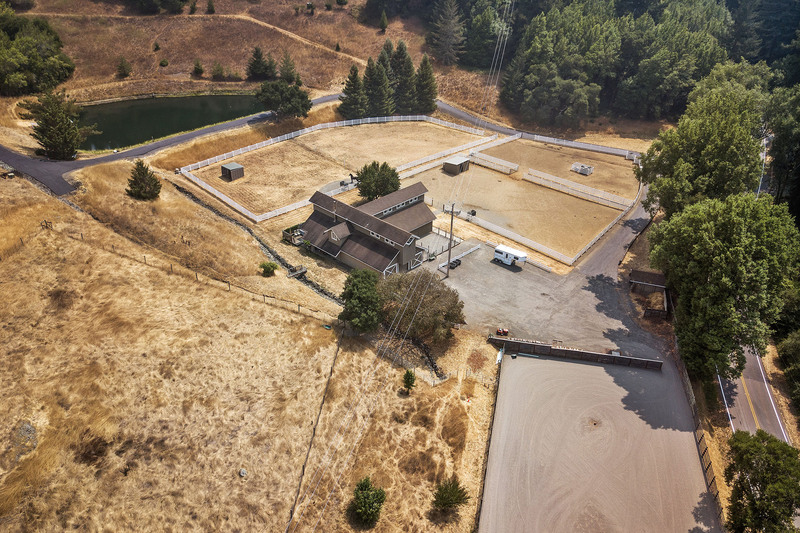 Nicasio is home of a massive reservoir and so water is an important feature out here and a very special element on this property. 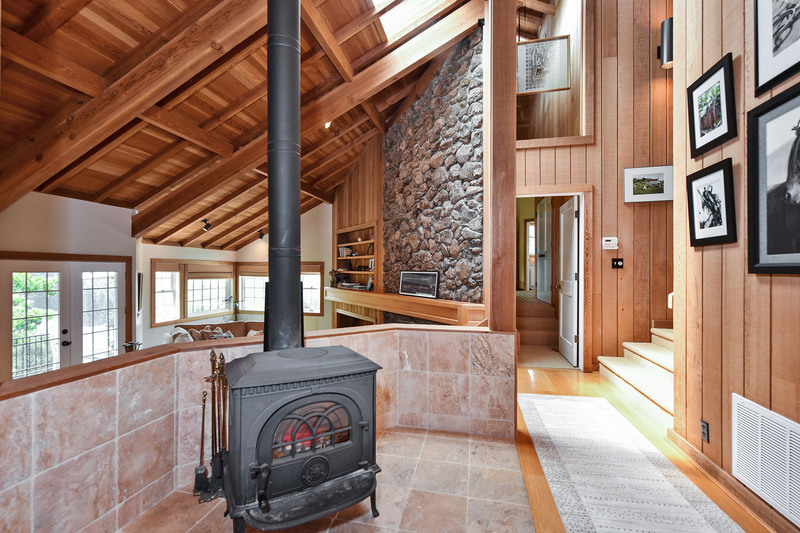 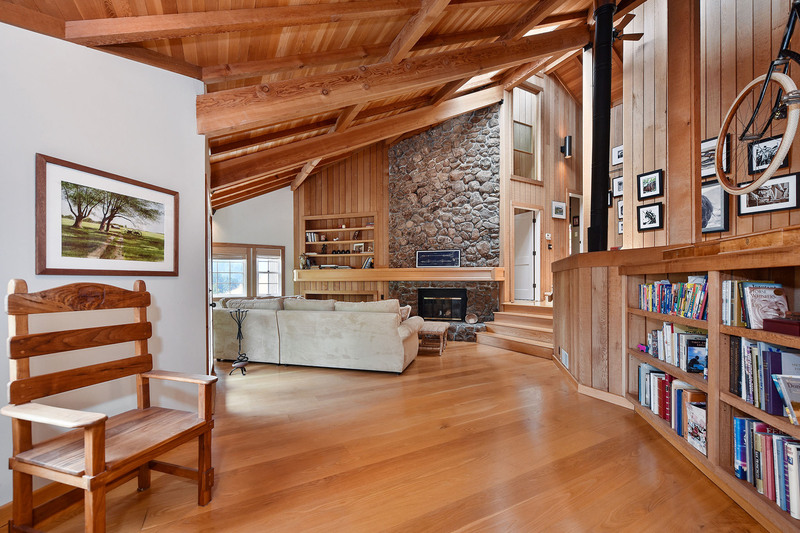 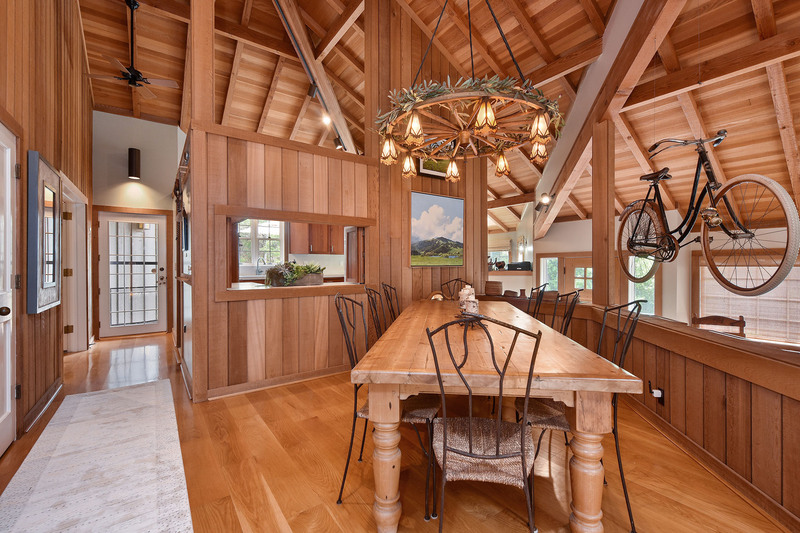 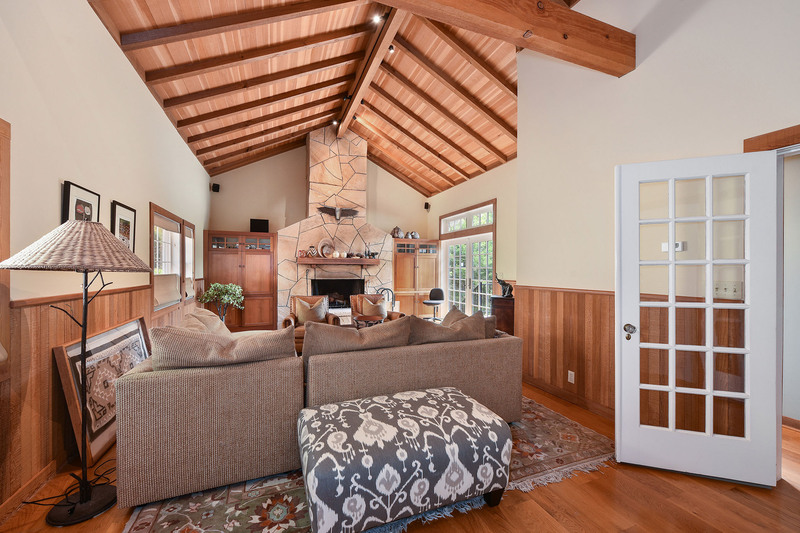 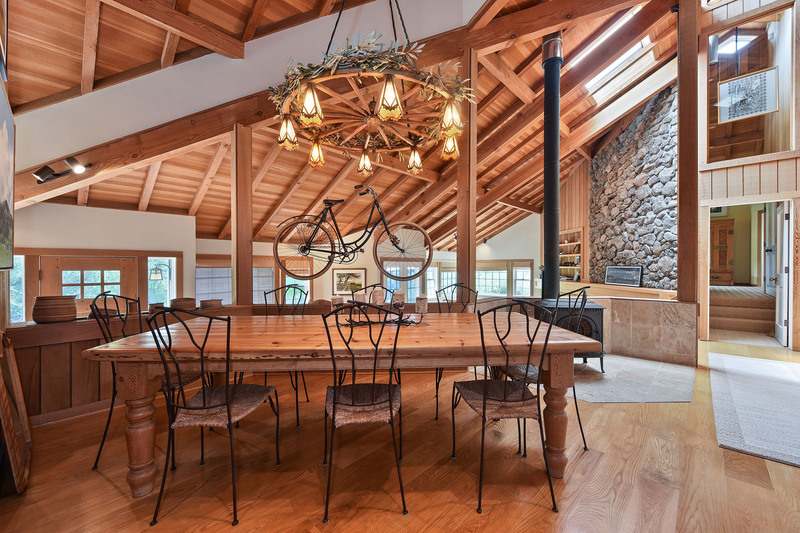 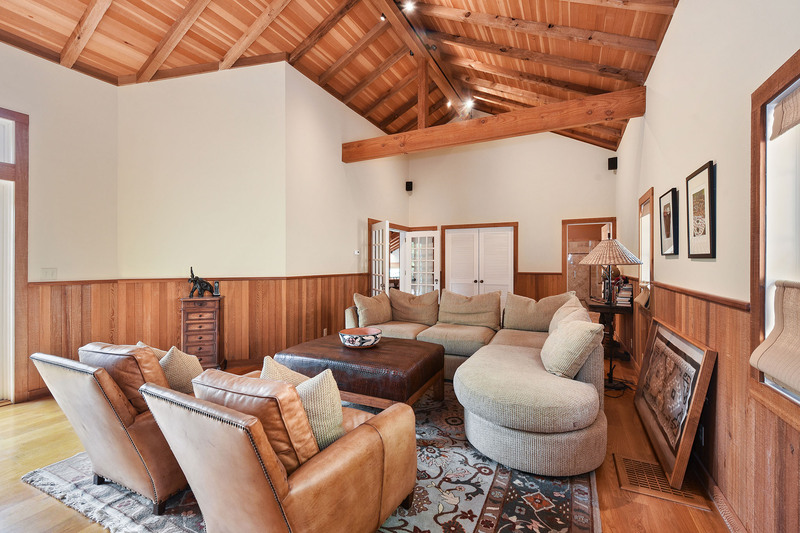 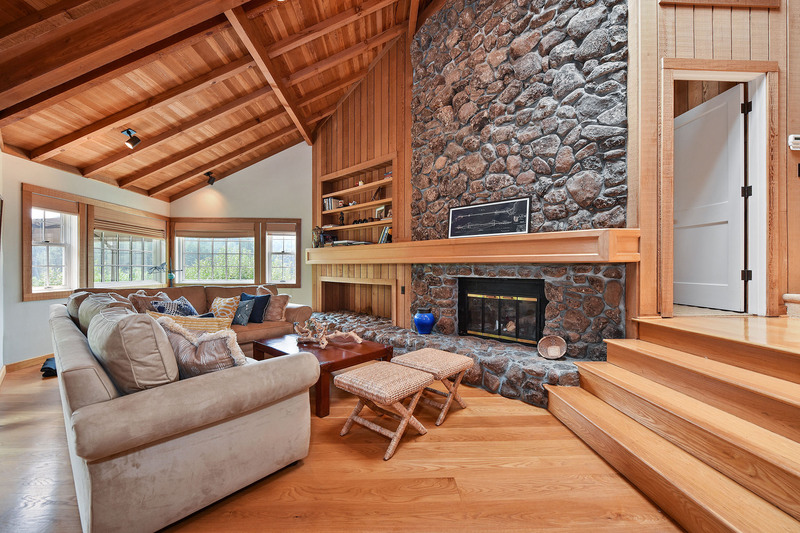 The home itself is contemporary rustic with a warm, cozy feeling from the natural wood, high ceilings and huge stone fireplace. 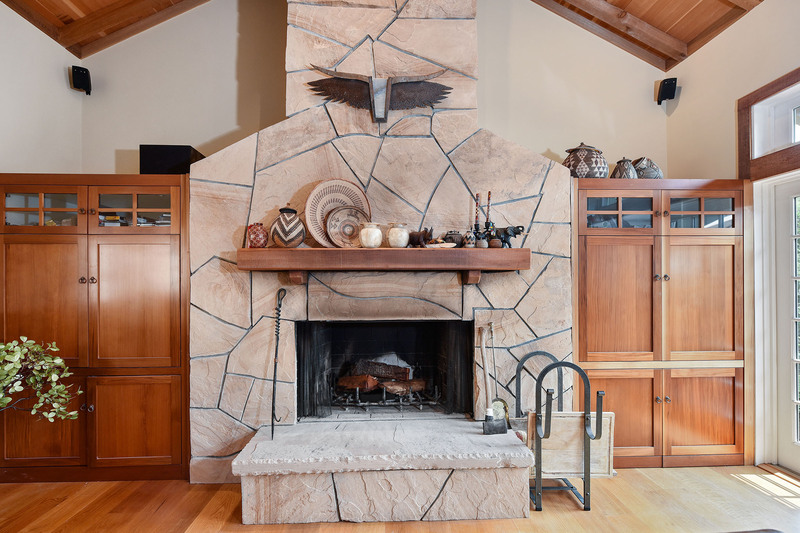 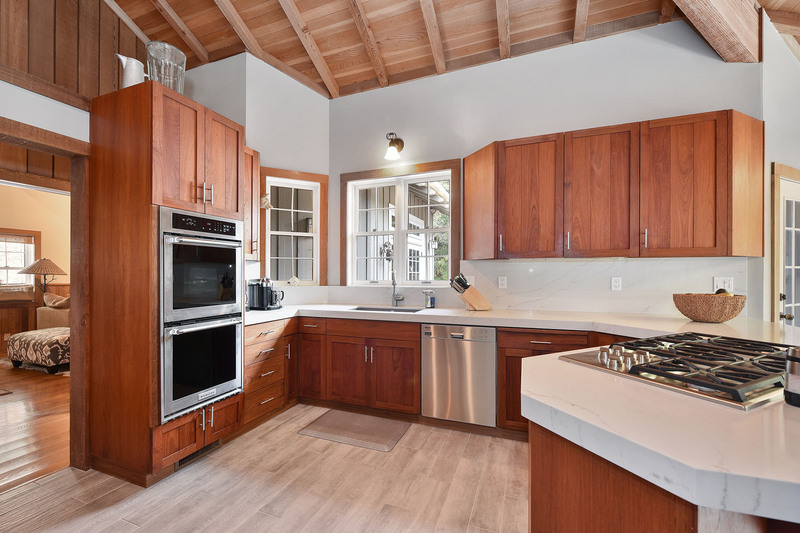 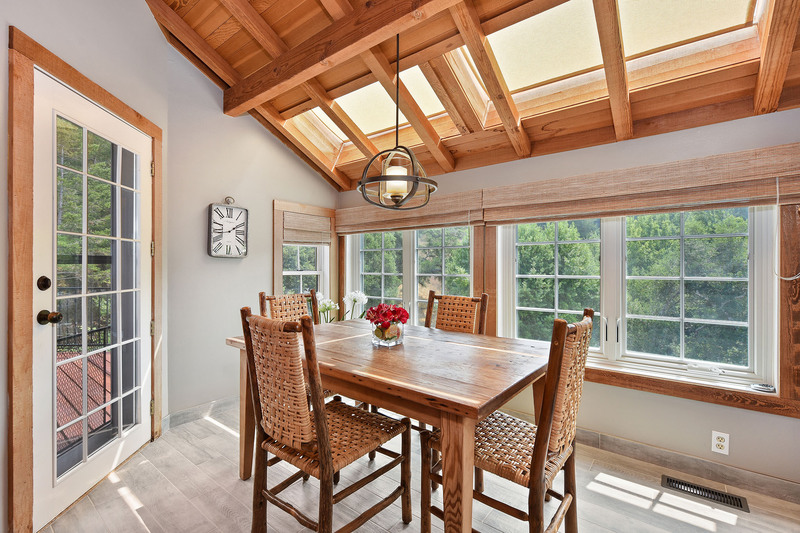 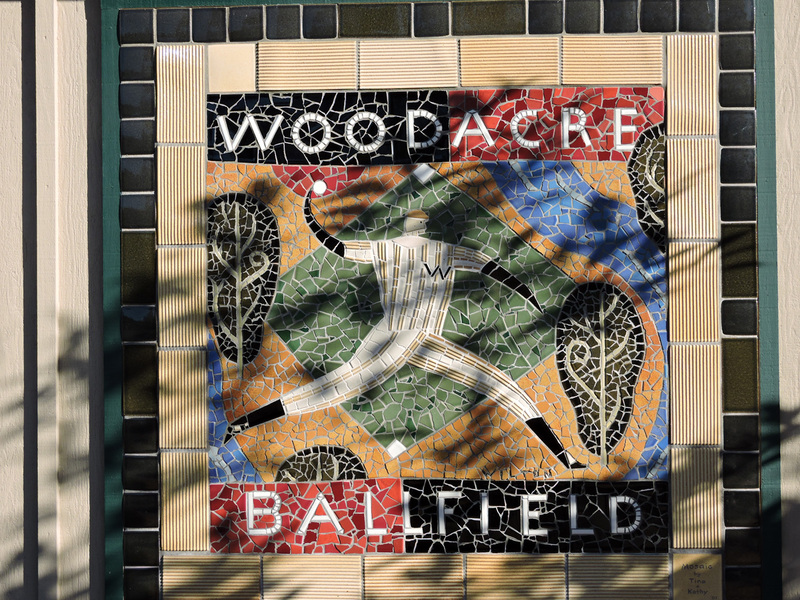 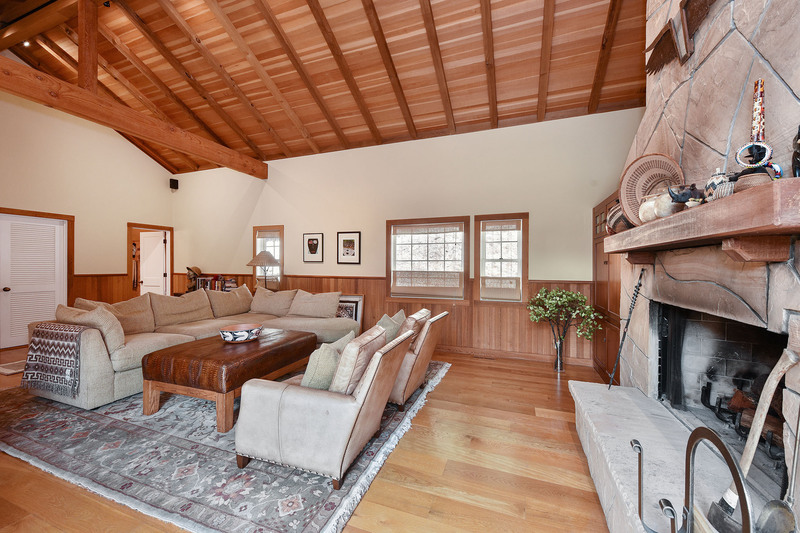 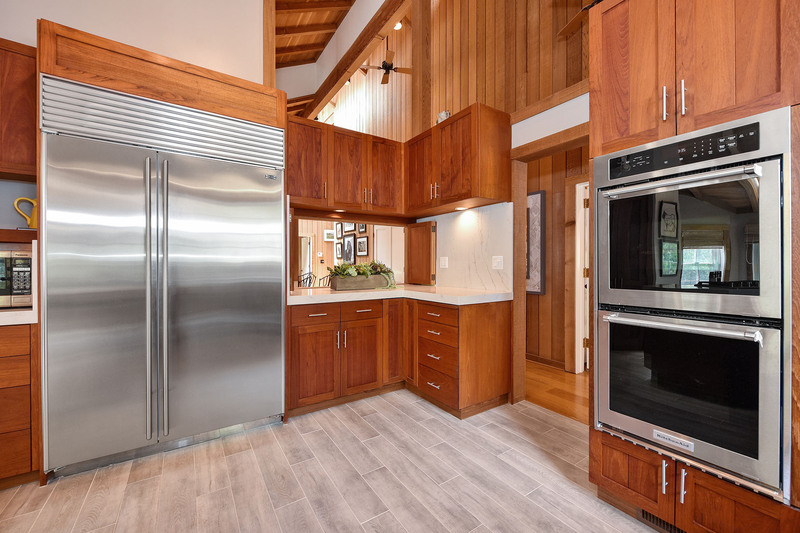 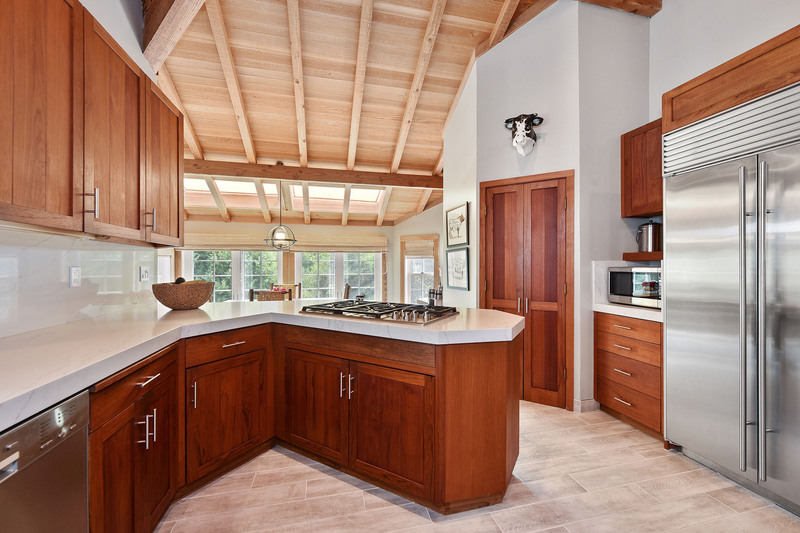 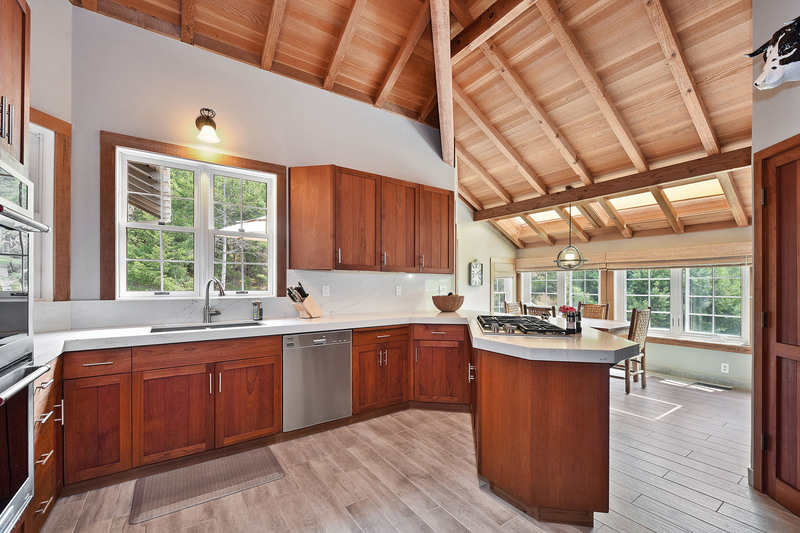 With the beautifully remodeled kitchen and the expansive family room, also graced by a lovely fireplace, you have wonderful, usable space for all your favorite indoor pursuits. 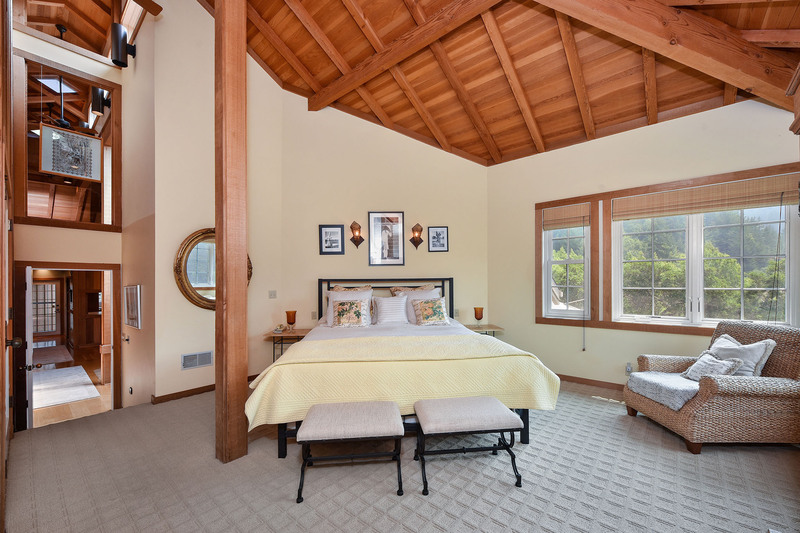 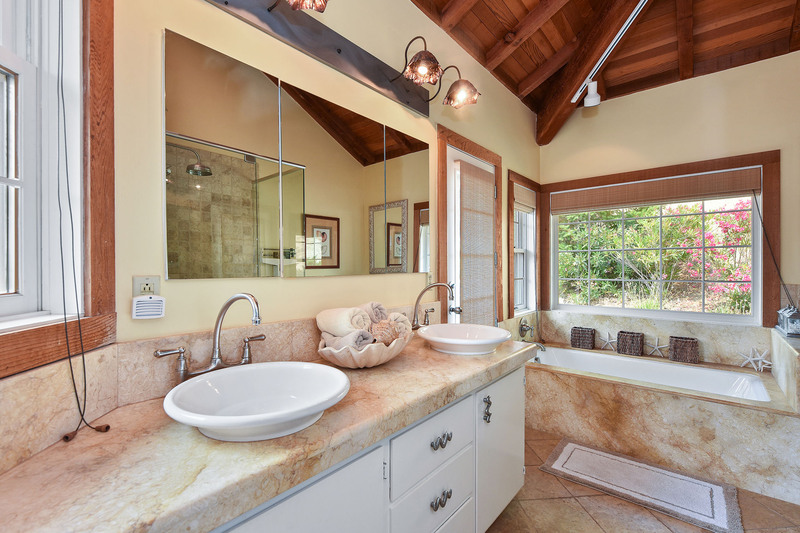 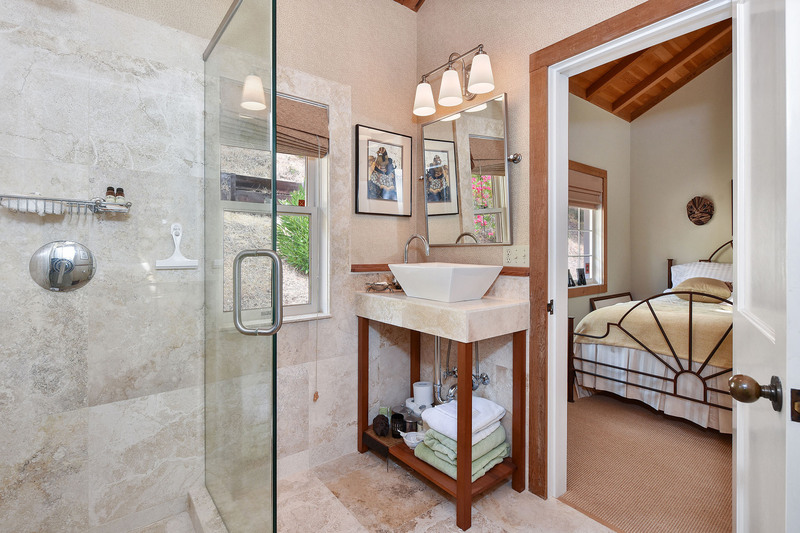 The master suite has a special feel with great windows, high ceilings, a walk in closet and a lovely bathroom which leads you out to the pool. 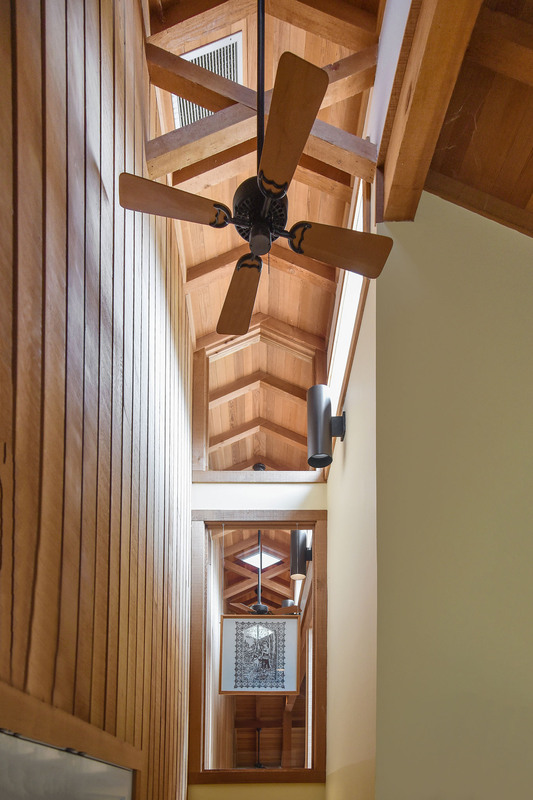 It’s a playful space with its interesting angular architecture and you’ll love retreating here in the evening. 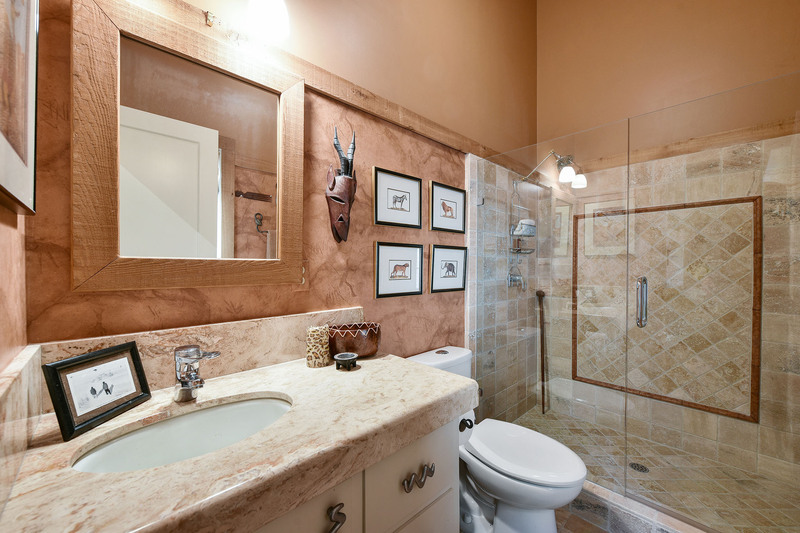 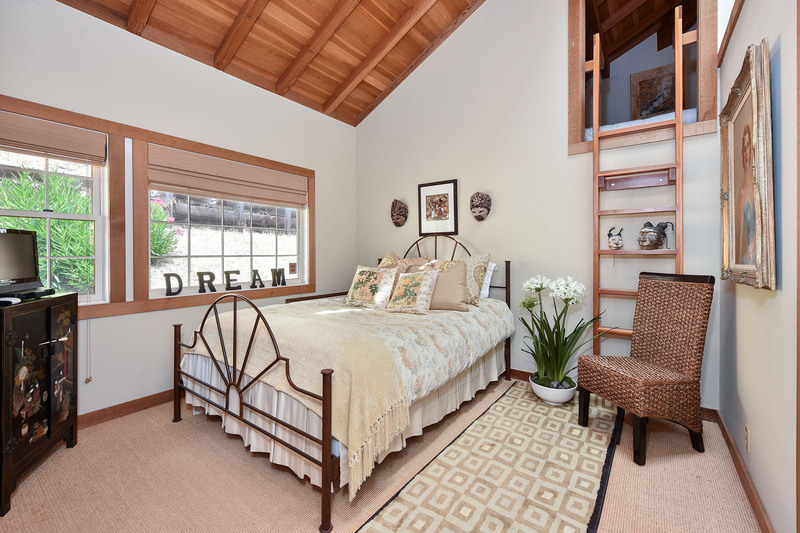 The other two bedrooms are connected with a Jack & Jill bathroom, also beautifully remodeled and one bedroom features a sweet sleeping or play loft as well. 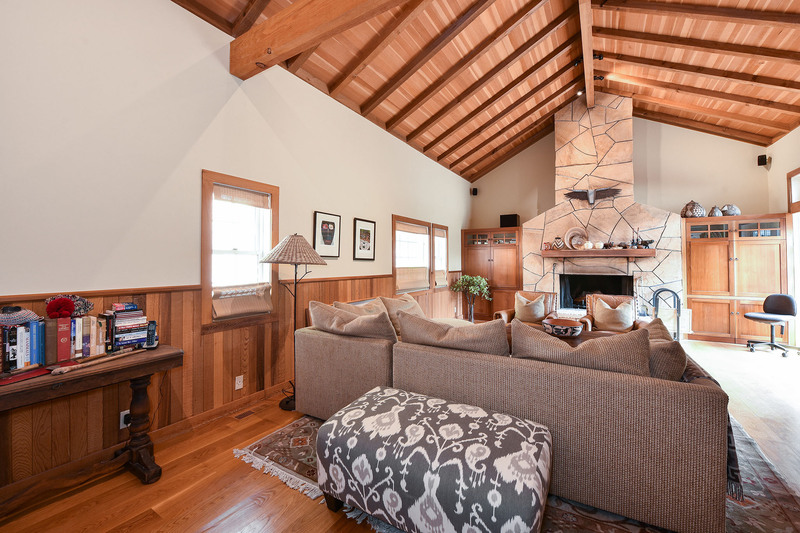 All in all, the house is a great space for a couple or for sharing with loved ones, with lots of private areas for everyone to have their own space. 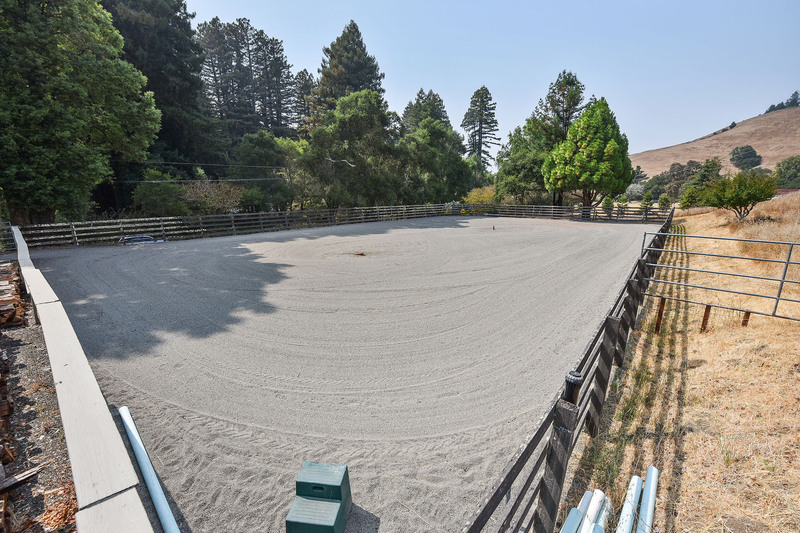 At the base of the property, near the gated entrance, is a wonderful equestrian set up which will please even the most demanding horses! 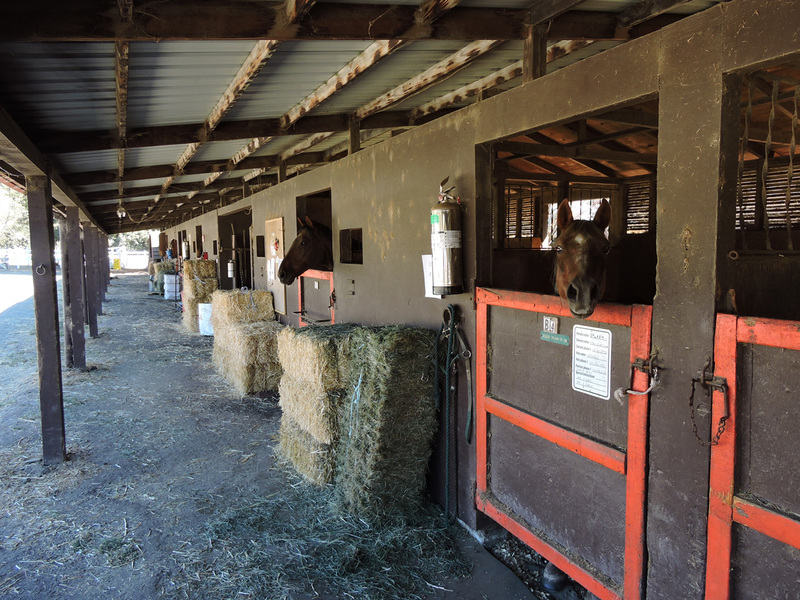 They will enjoy the large stalls with runs, extra wide aisle, amazing tackroom (a national champion lives here!) 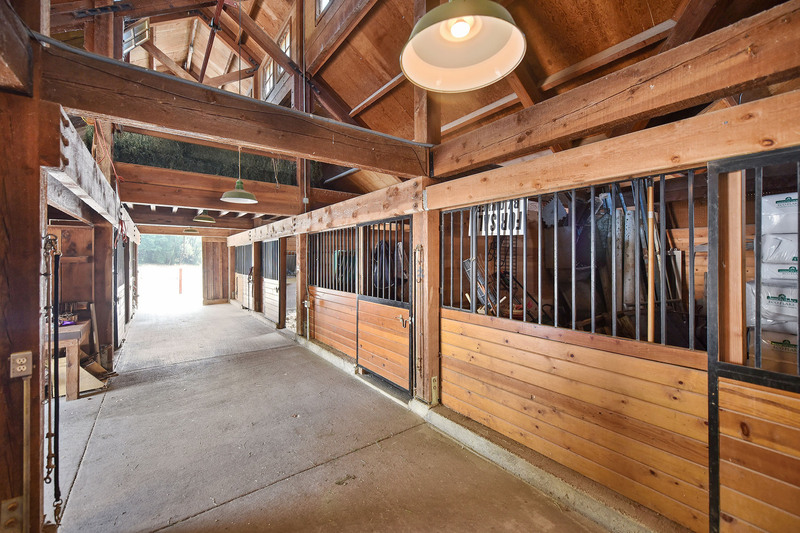 and feel totally spoiled. 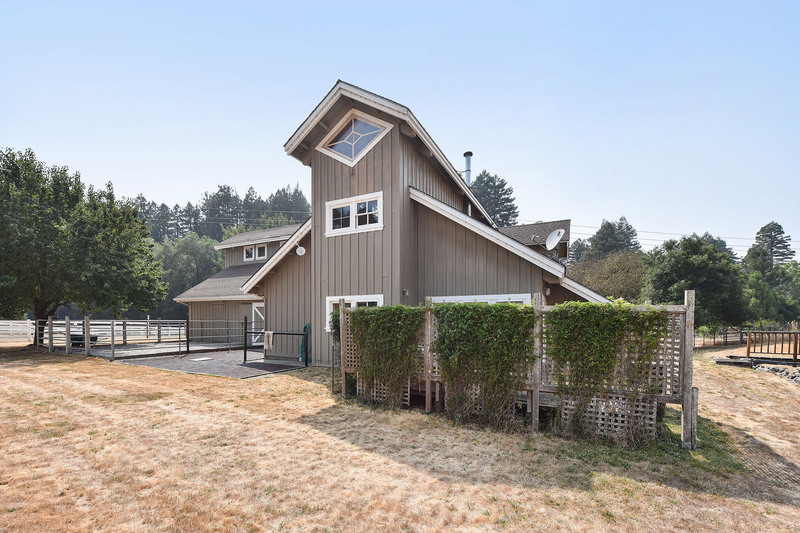 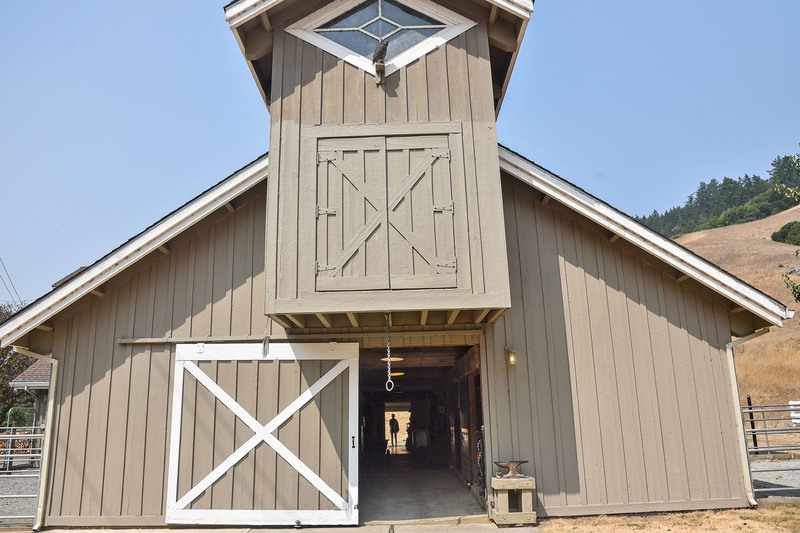 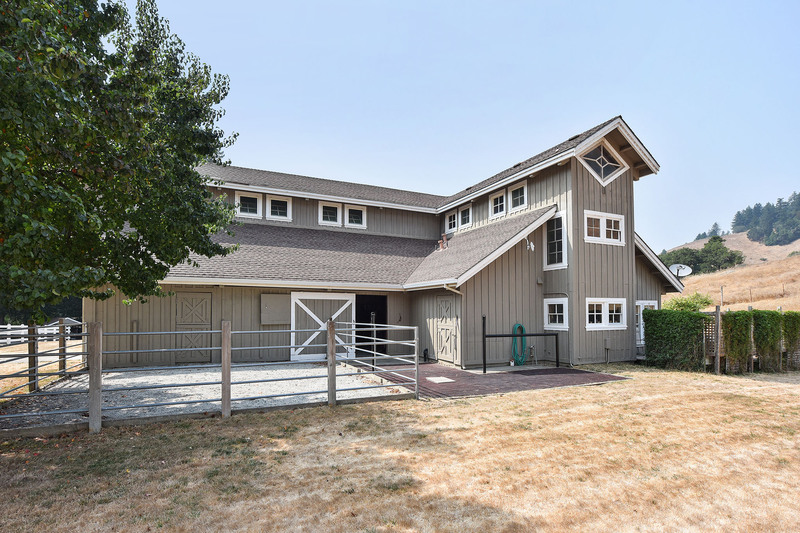 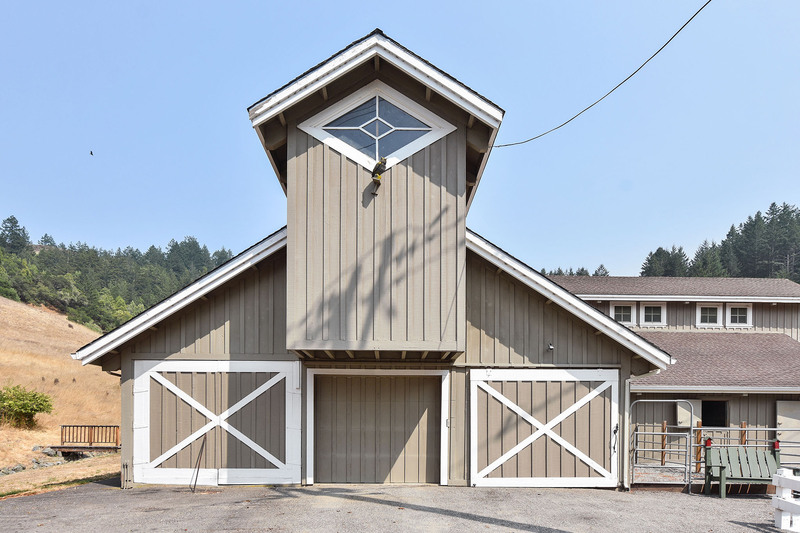 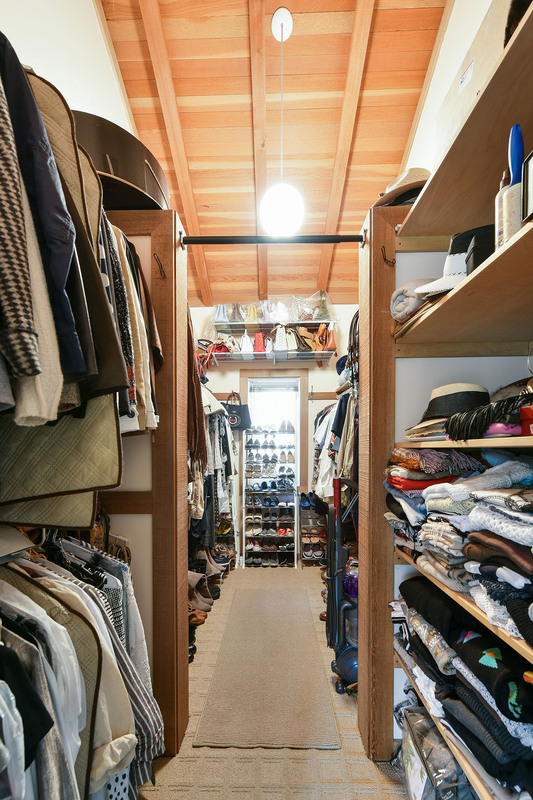 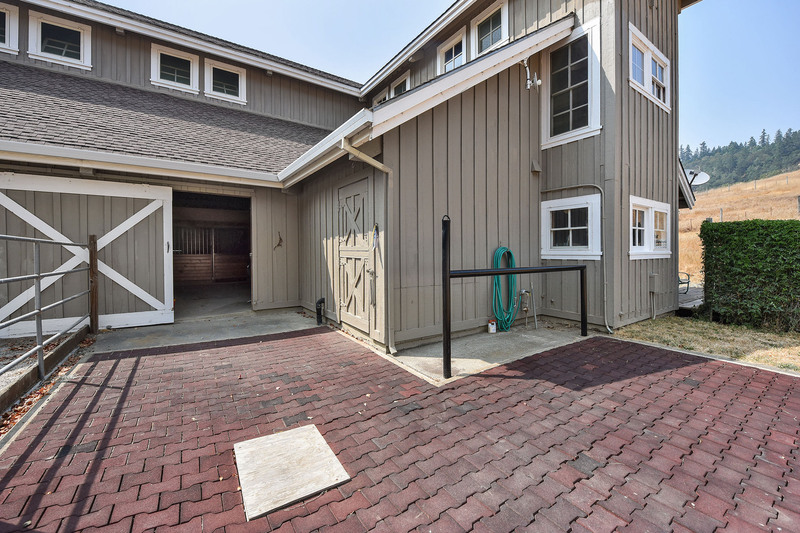 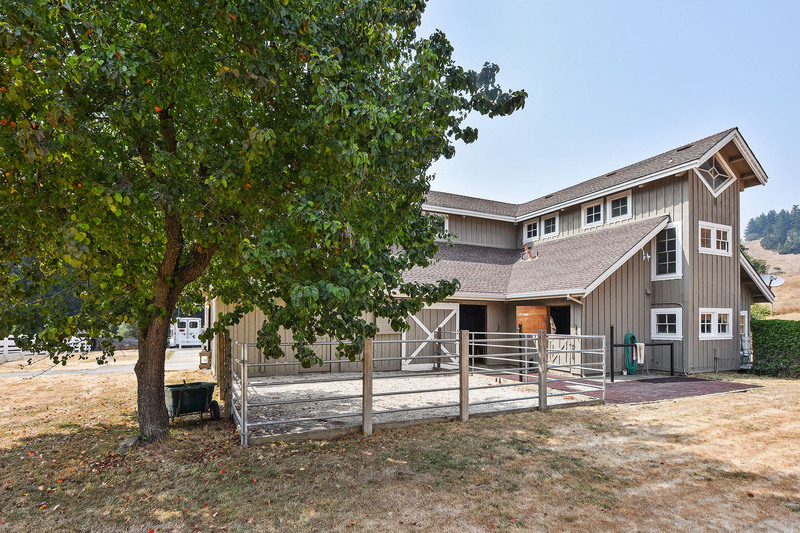 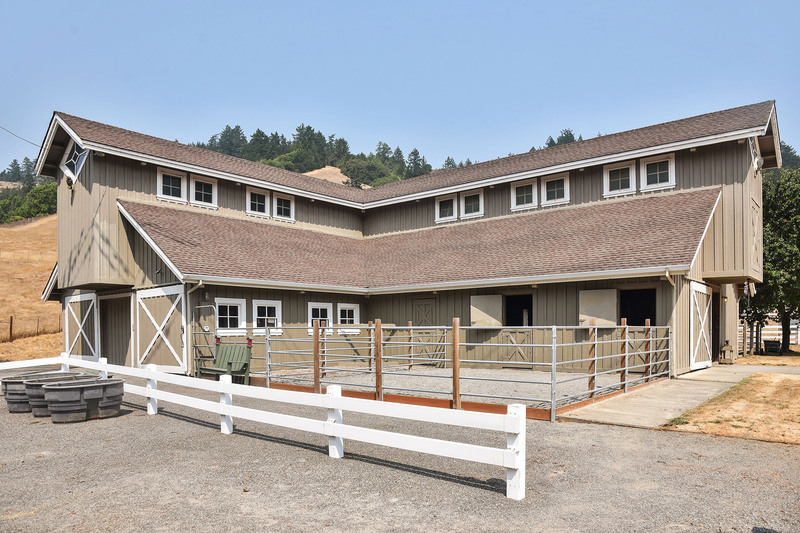 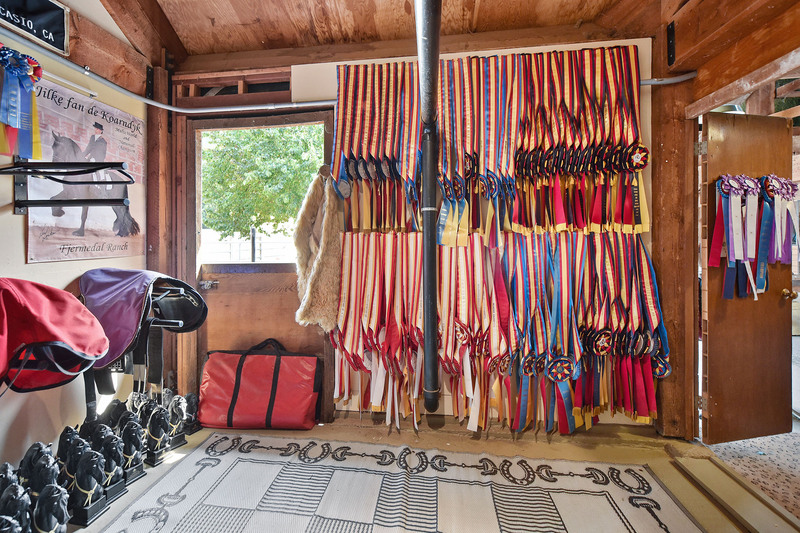 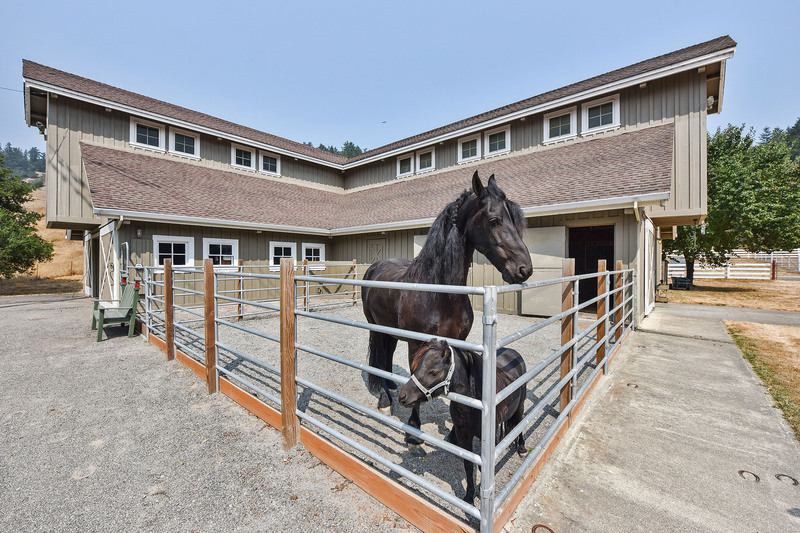 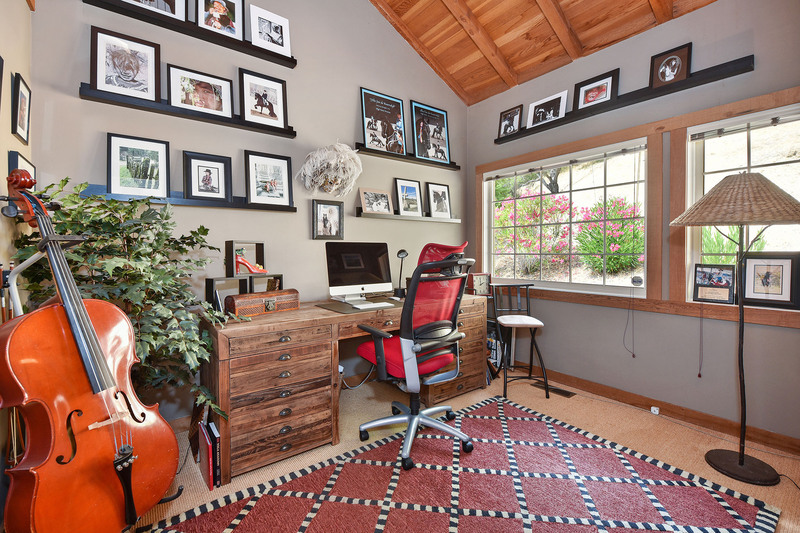 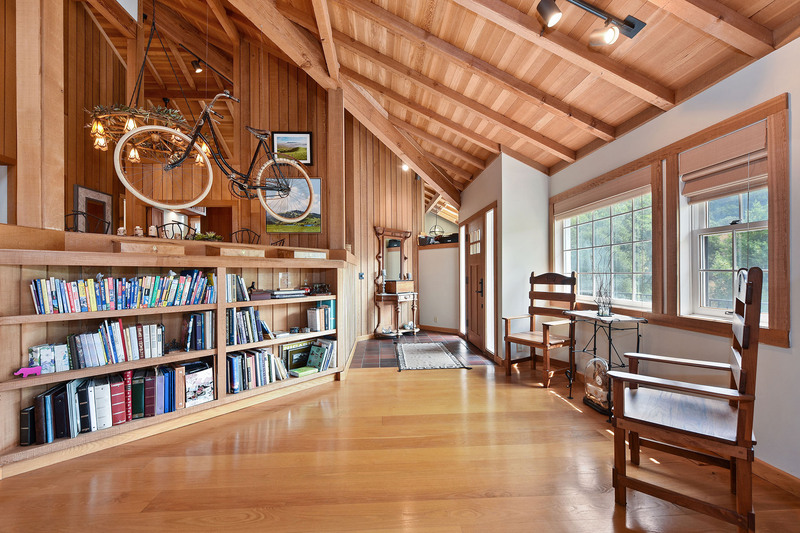 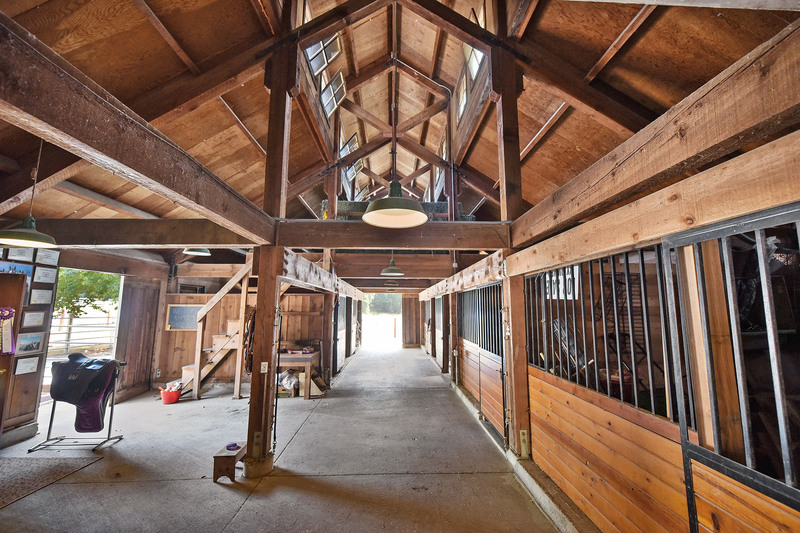 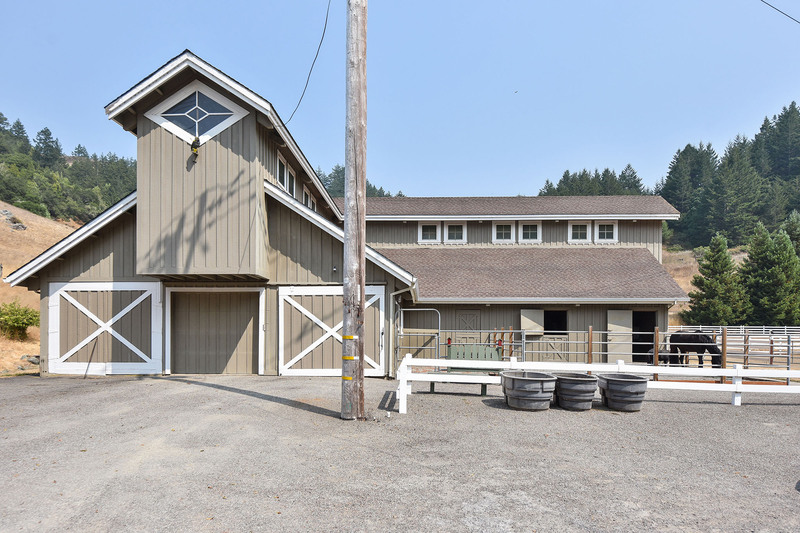 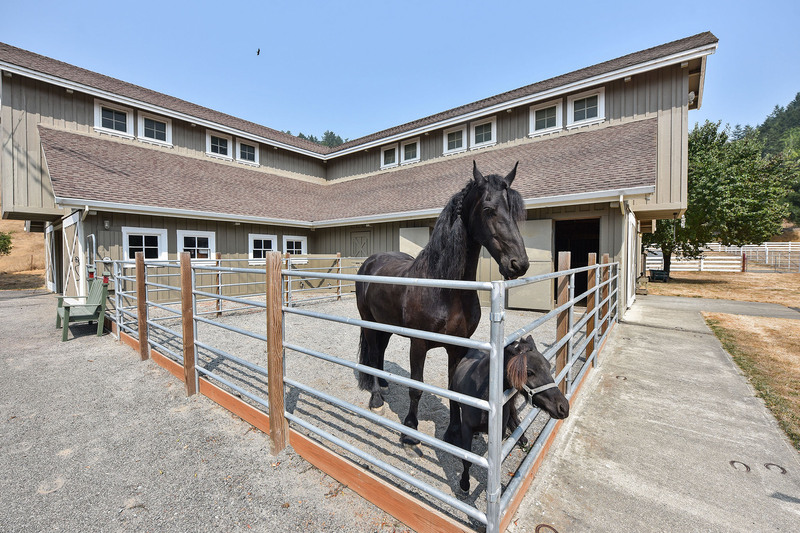 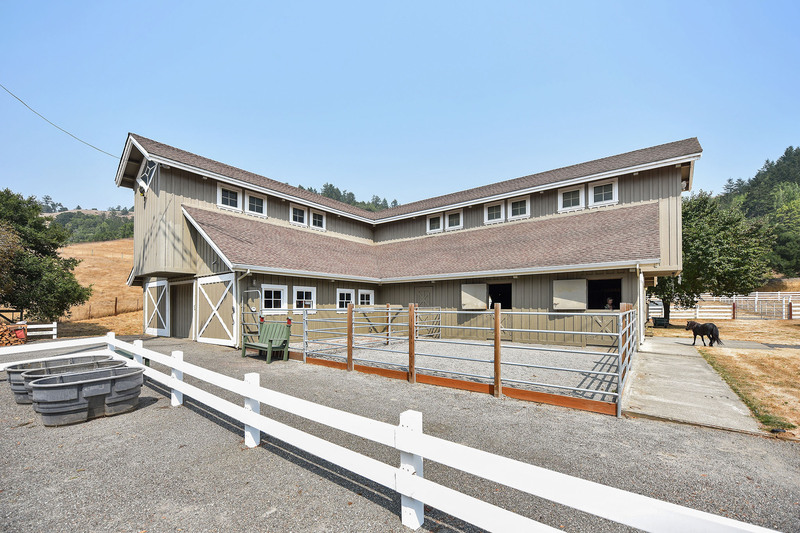 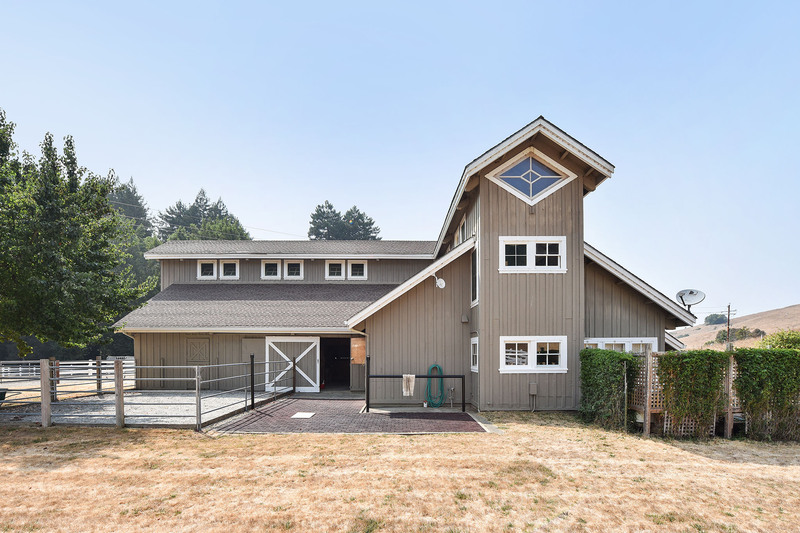 With its huge storage loft and space for hay, shavings and equipment, this barn does it all. 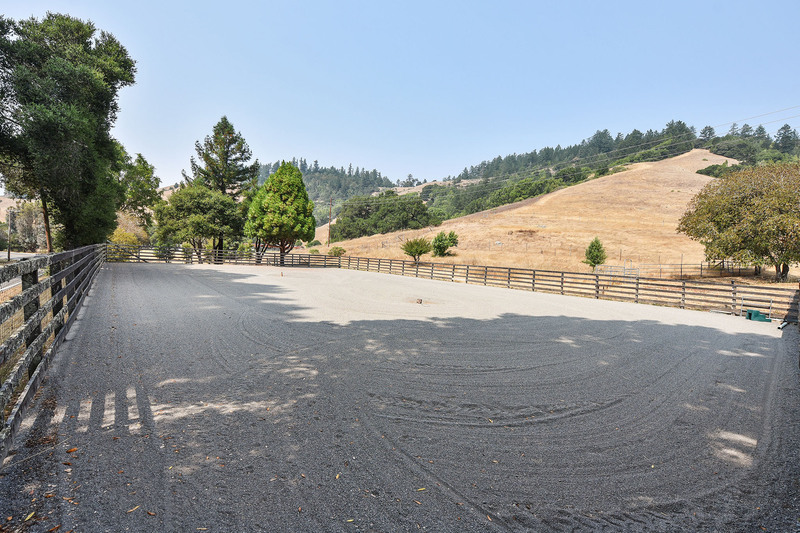 A great engineered arena and expansive paddocks complete the picture. 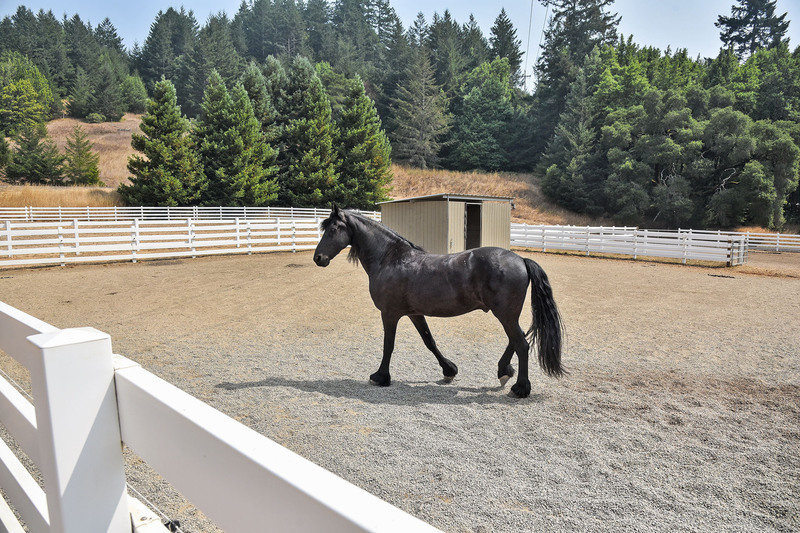 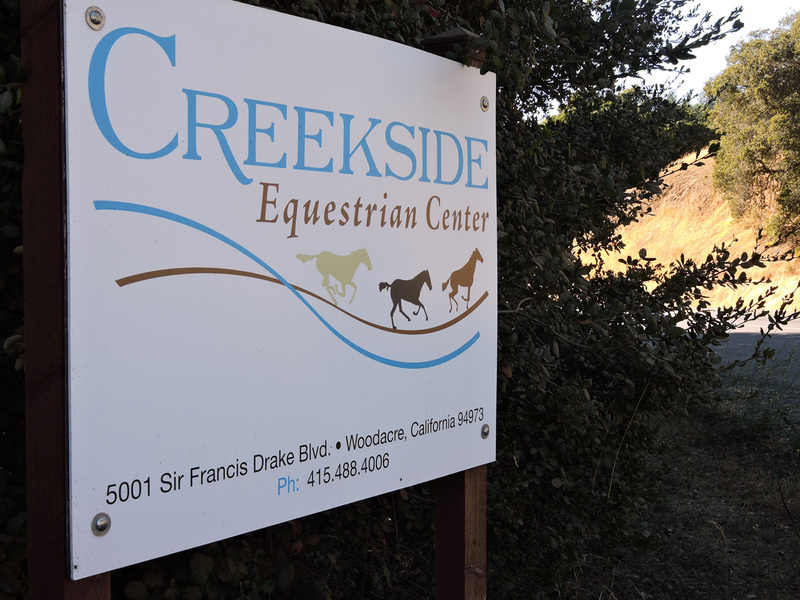 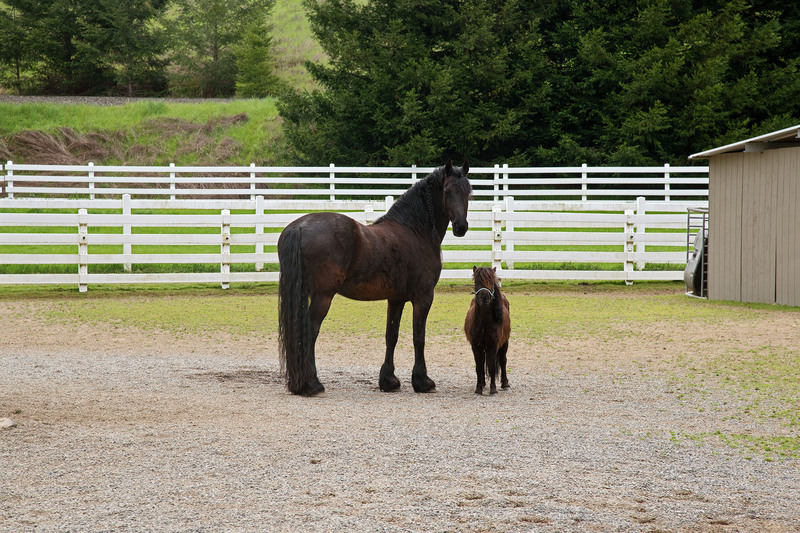 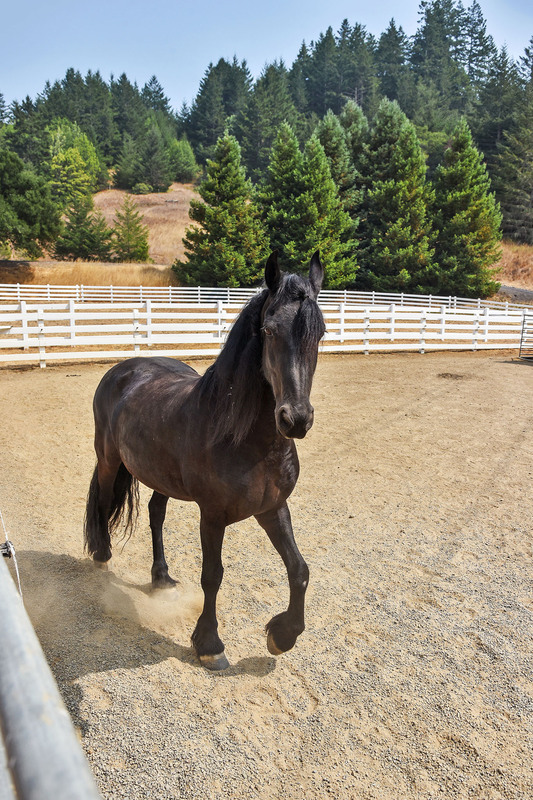 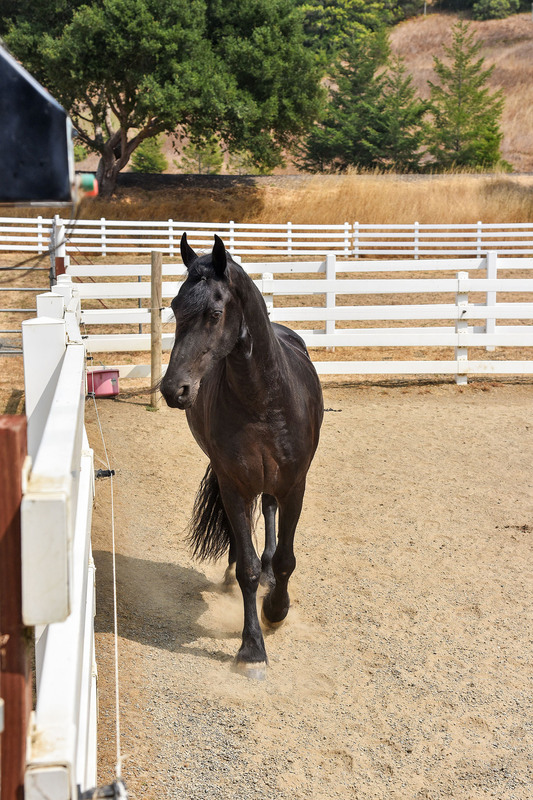 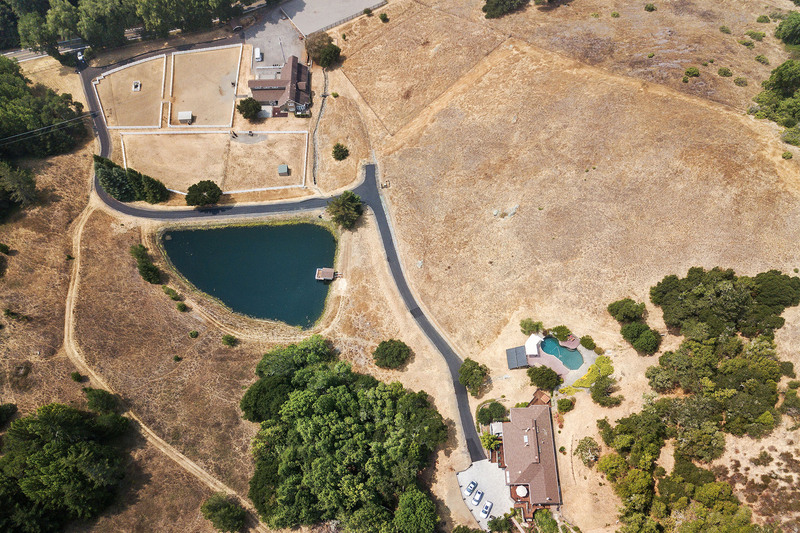 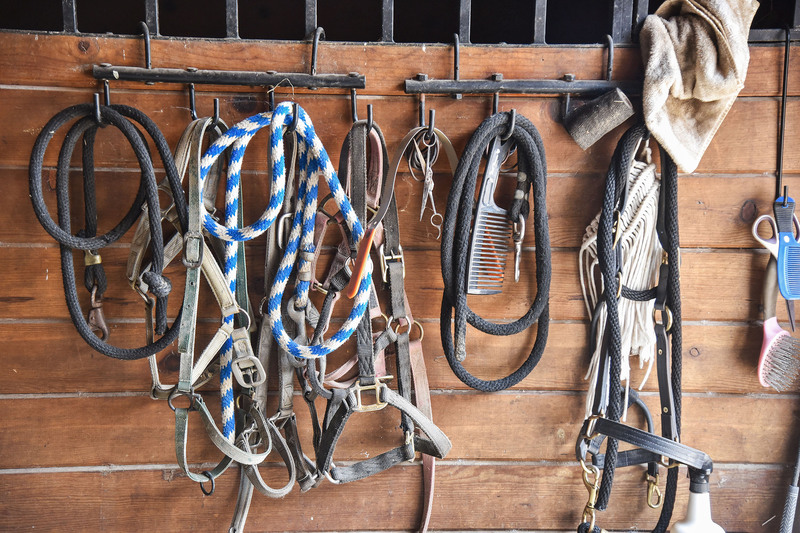 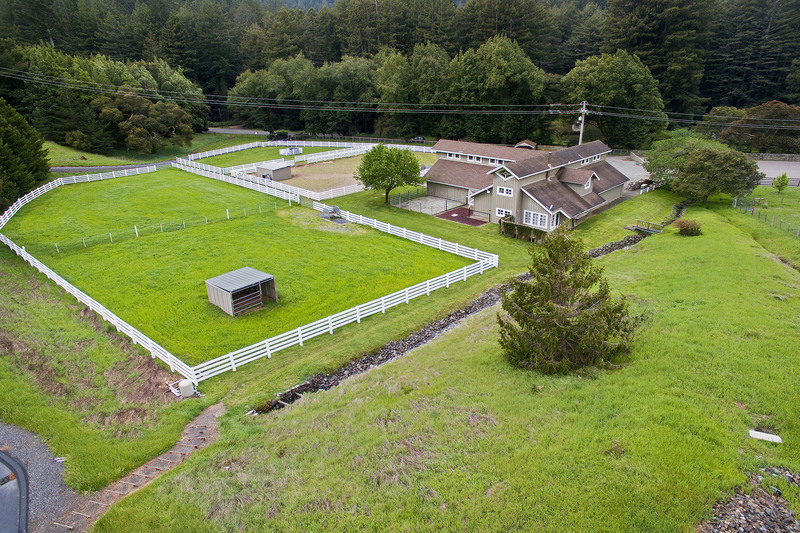 In all, the property comprises about 53 acres +/-, of which about 5 is set up and usable for your horses. 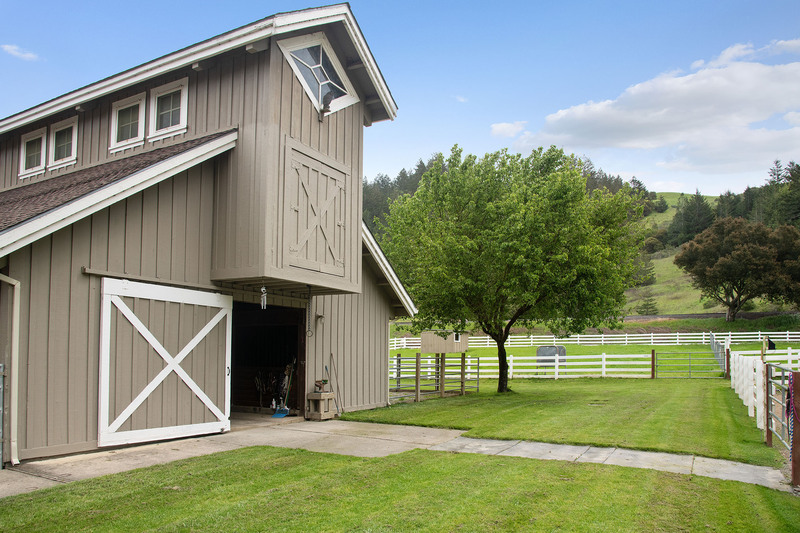 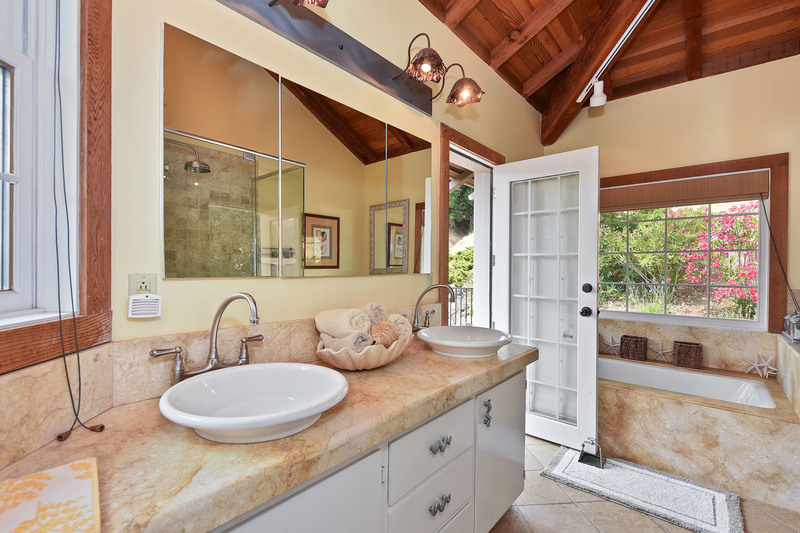 Above the barn is a wonderful caretakers unit with two bedrooms, which could also be used as a guest house or rental. 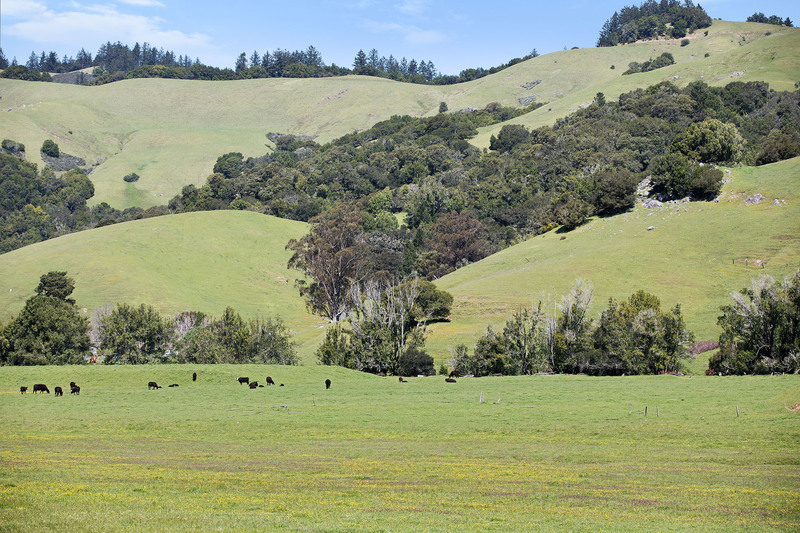 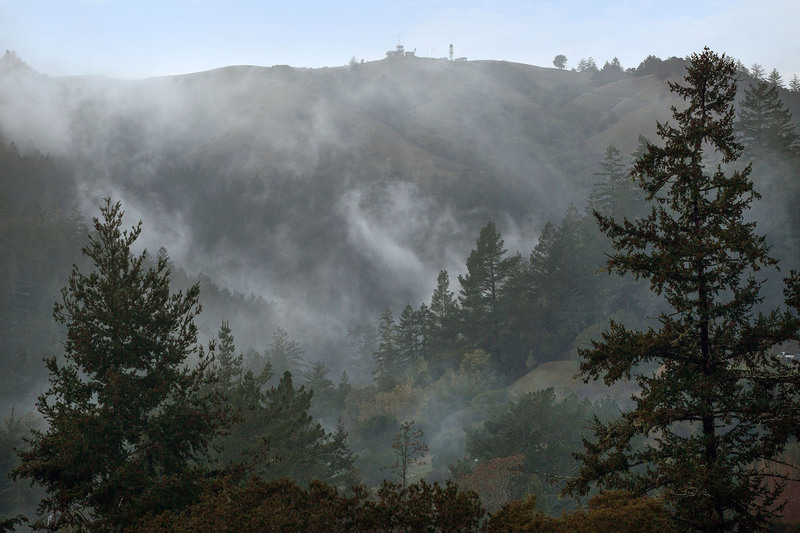 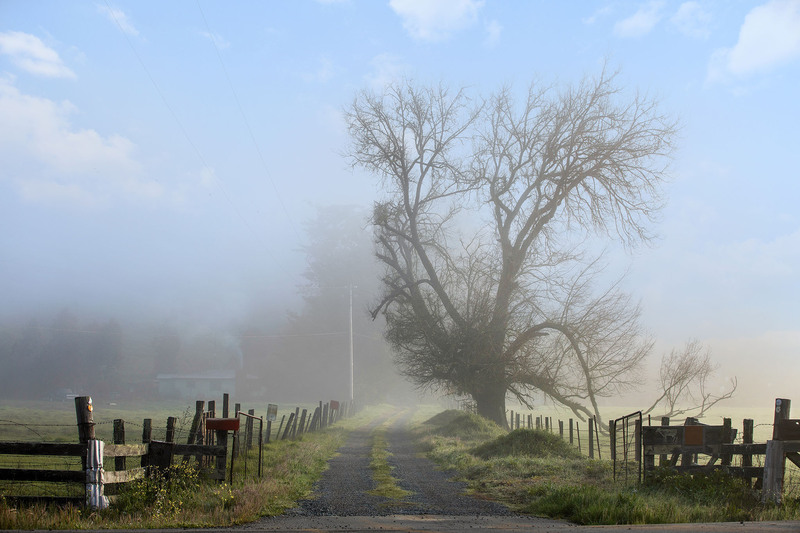 Nicasio is scenically very attractive with forests and open ridges surrounding the wide rolling valley. 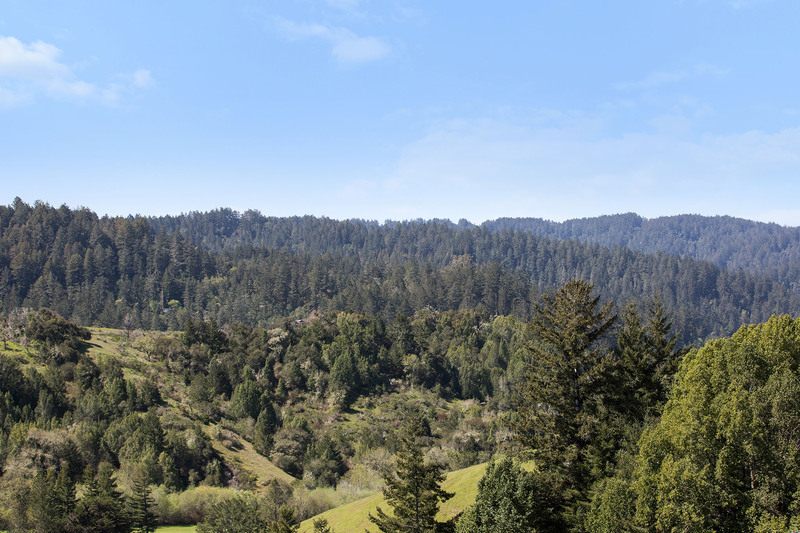 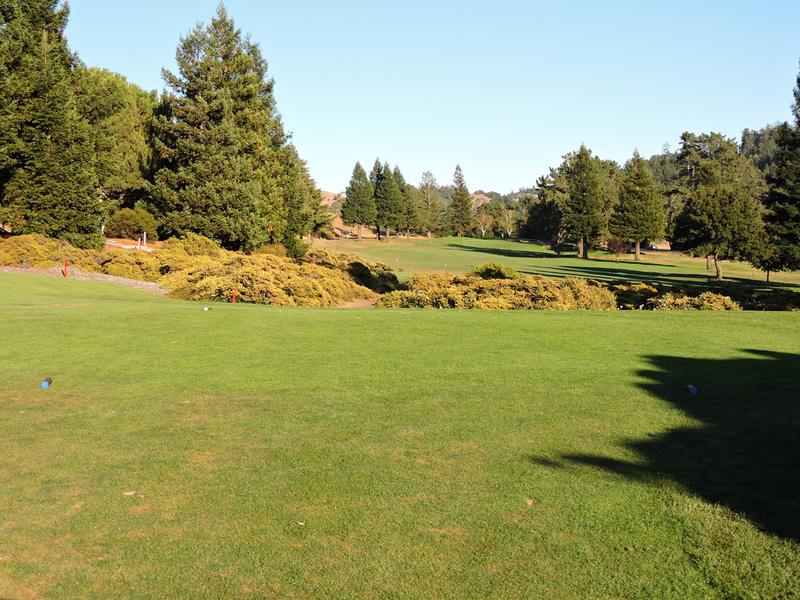 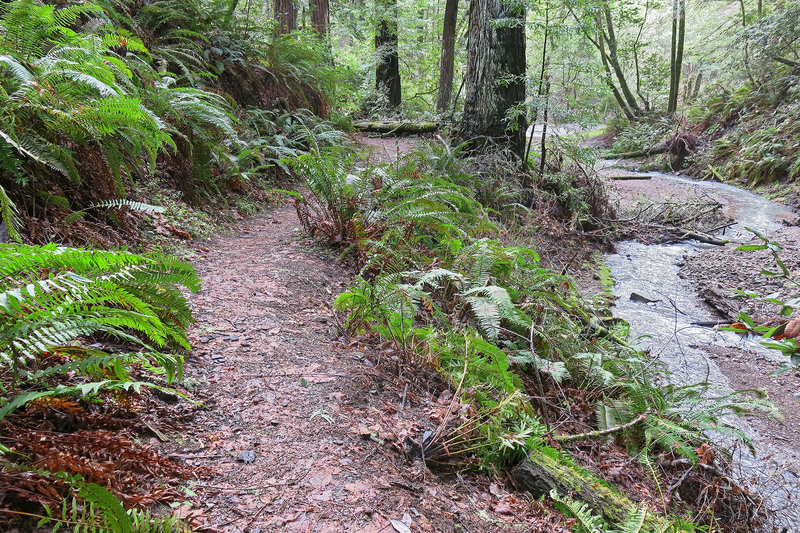 Oak, bay, and fir trees are common here, and there are some nice stands of redwoods as well. 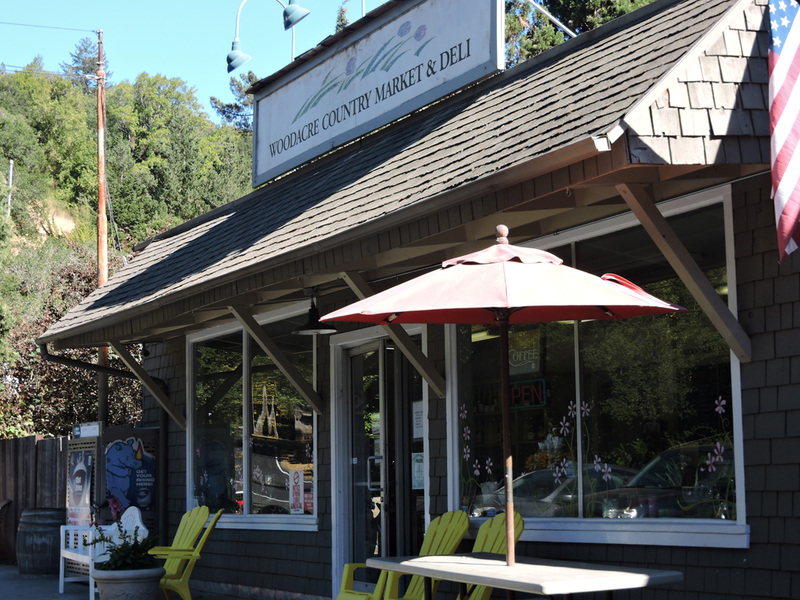 The hamlet is firmly entrenched in an agricultural lifestyle and there are lots of sustainable and organic operations in the valley. 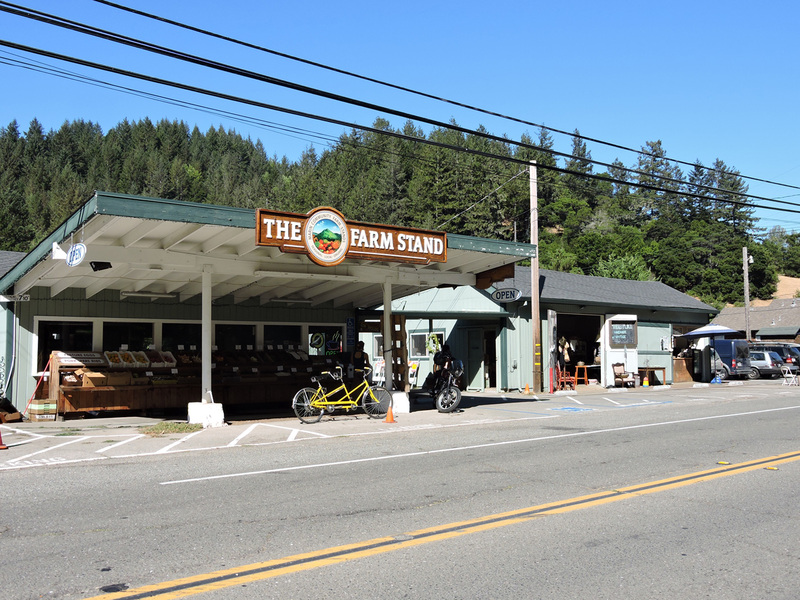 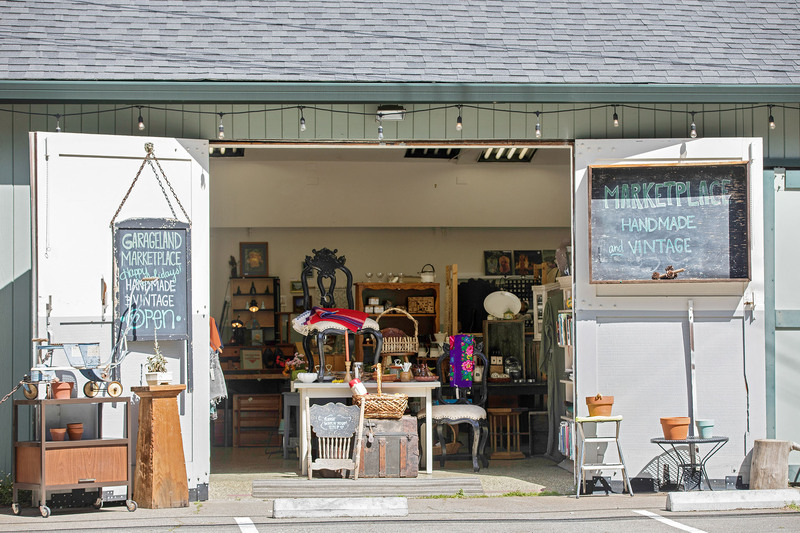 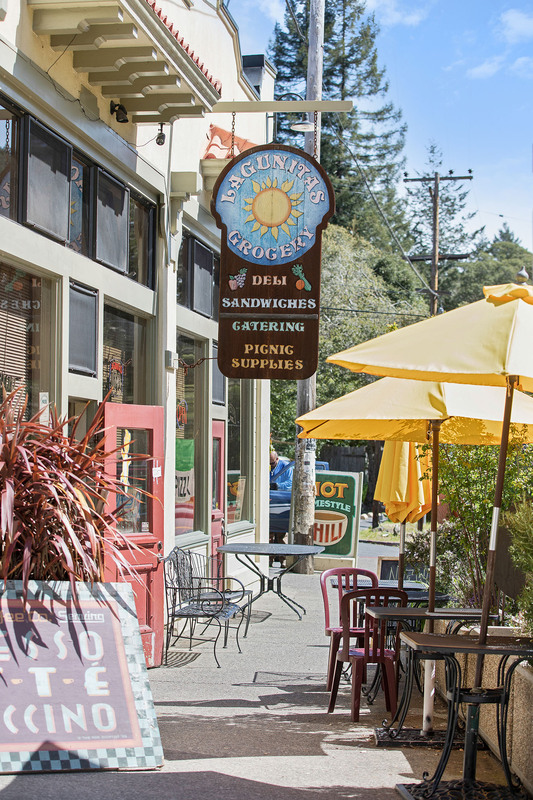 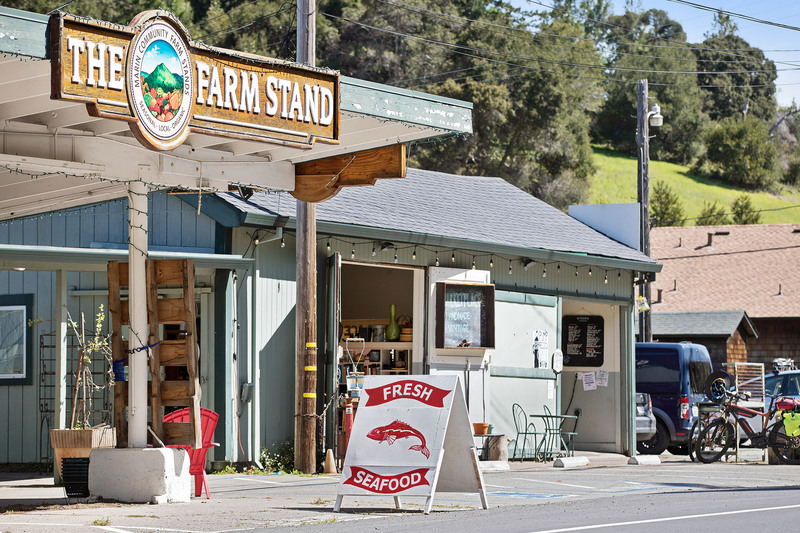 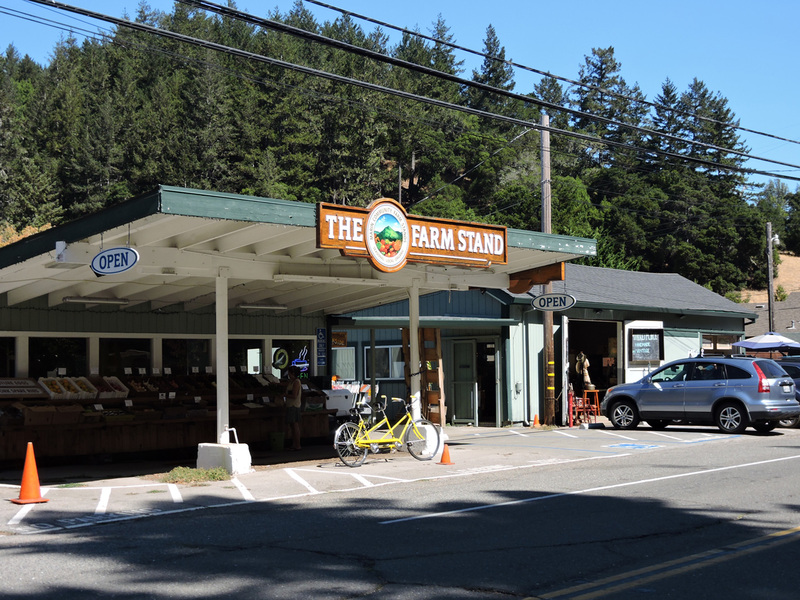 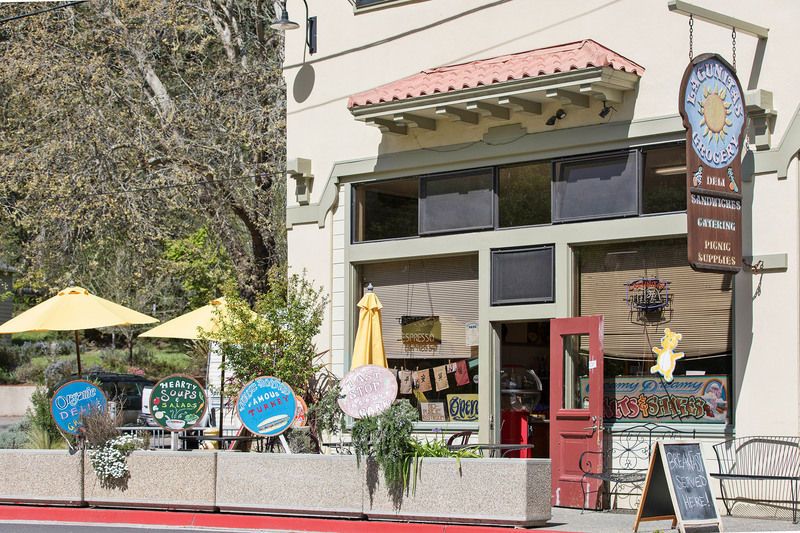 Nicasio Cheese company is a big draw but the locals all revere the Rancho Nicasio, the hub of social life here in the town. 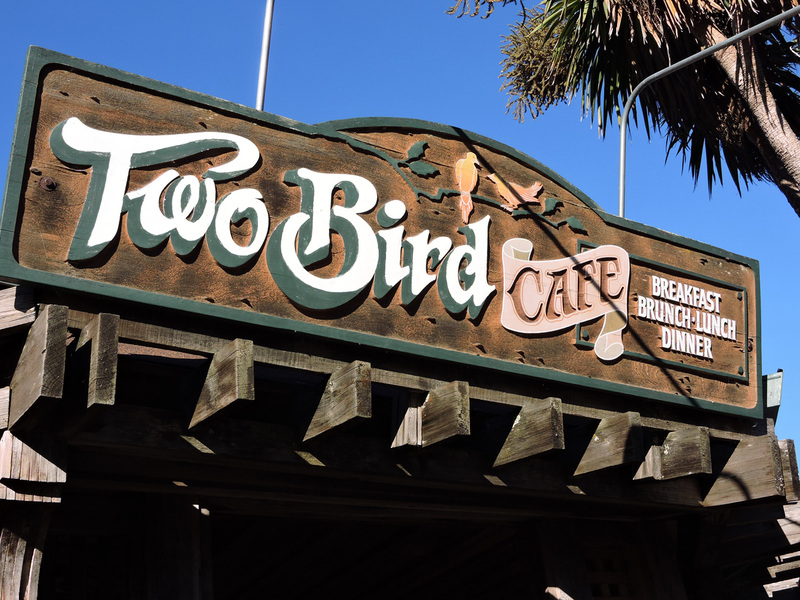 It’s a great place for outdoor music, fun & frivolity. 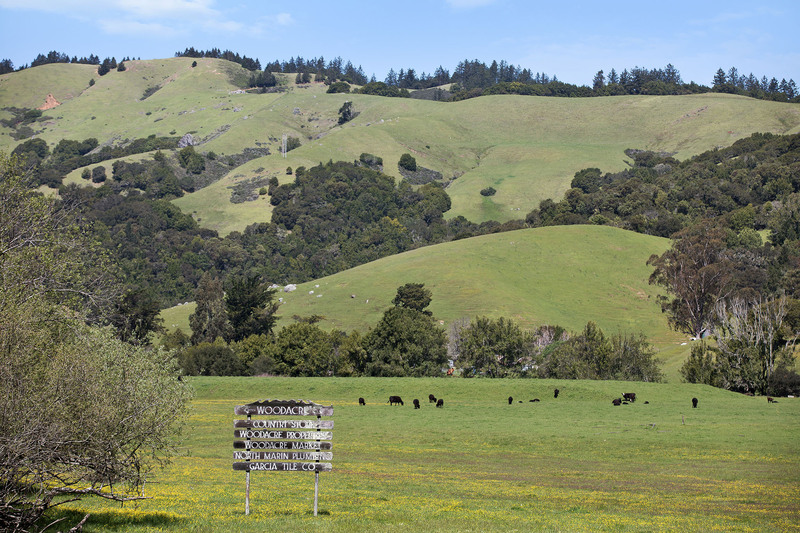 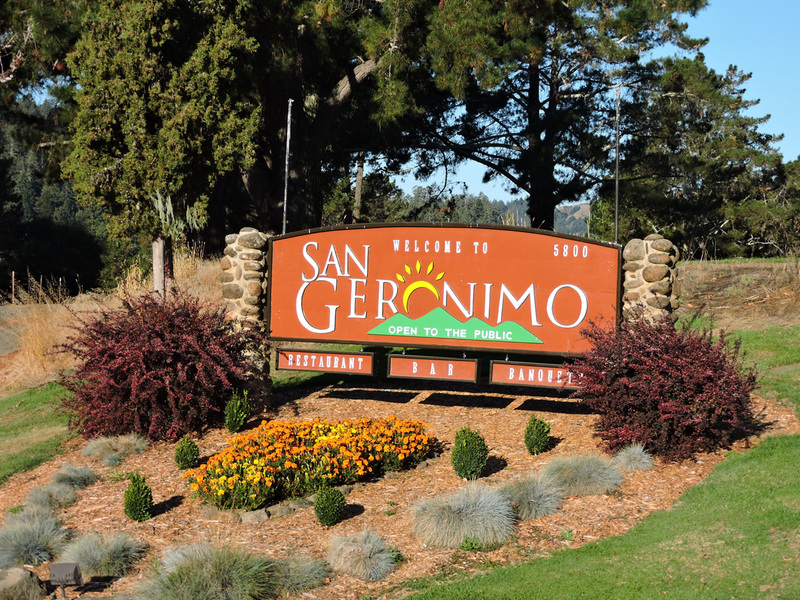 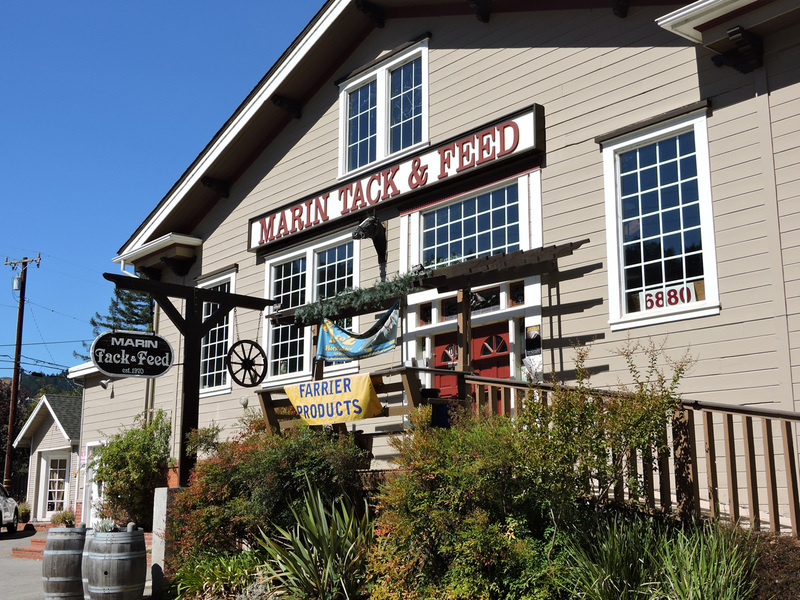 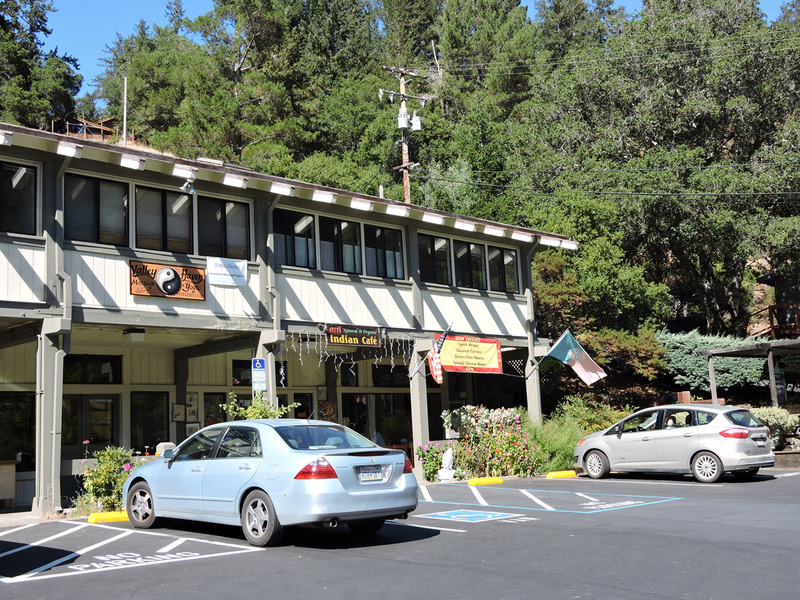 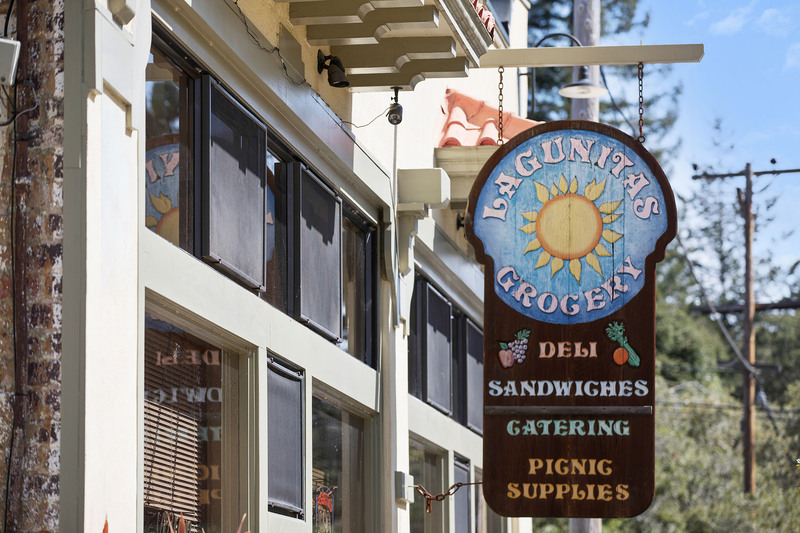 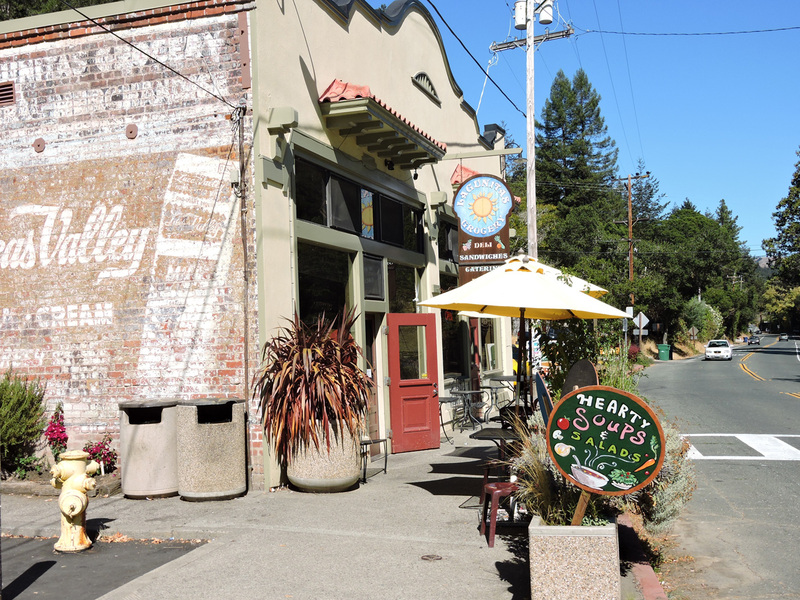 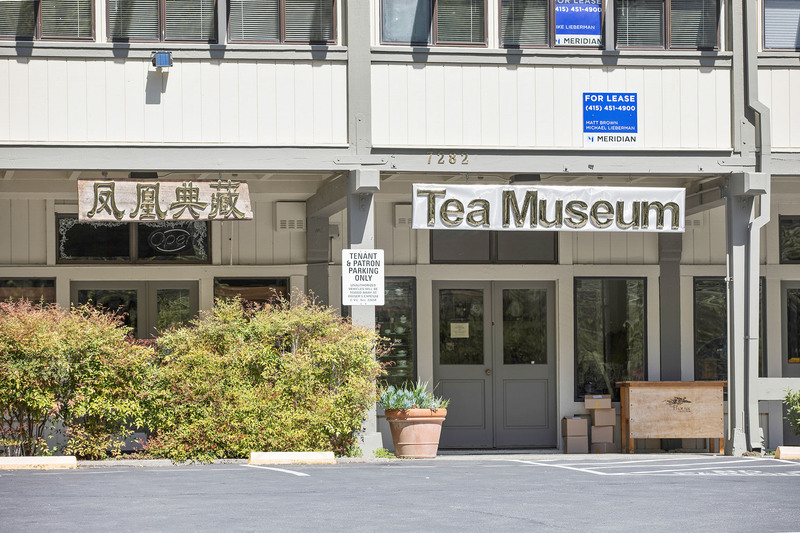 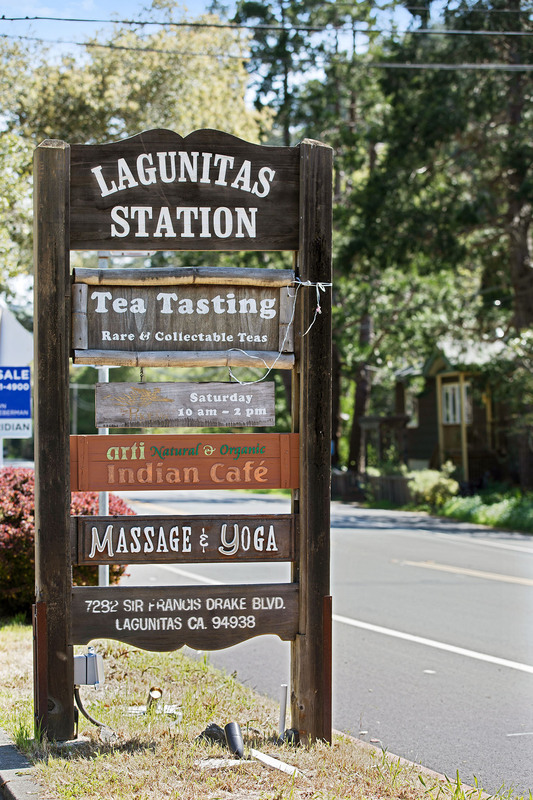 The most famous business in Nicasio is George Lucas’ Skywalker Ranch. 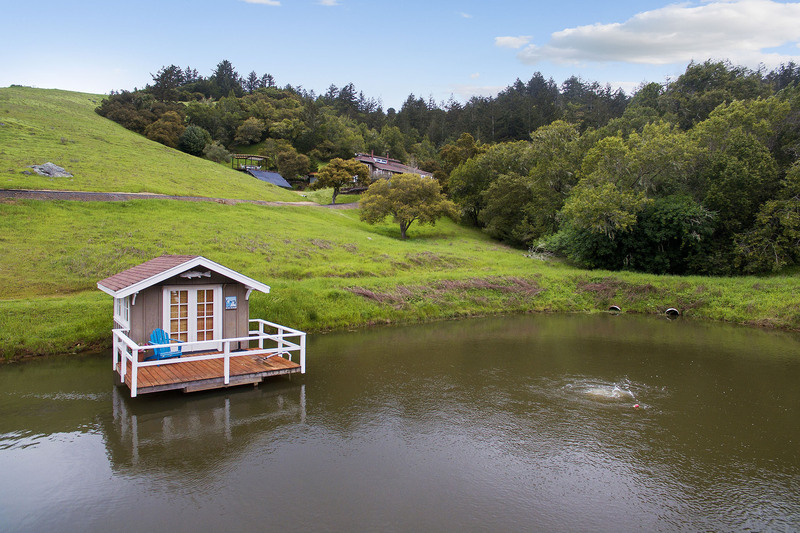 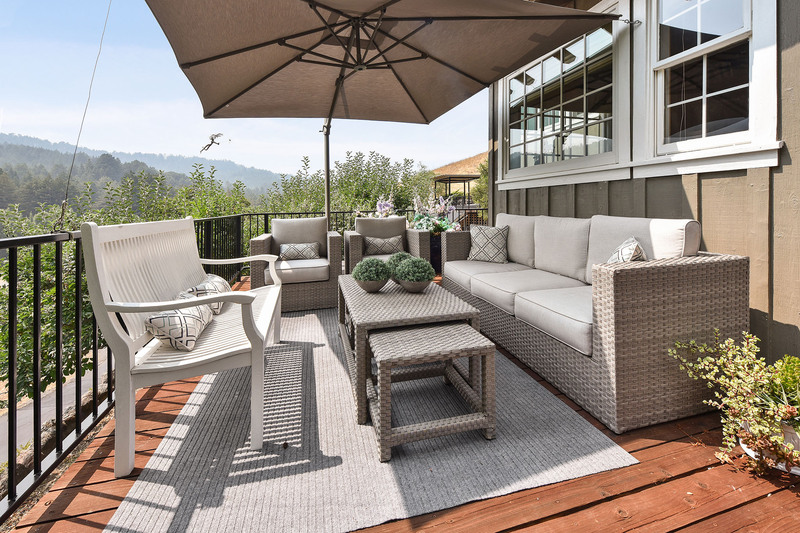 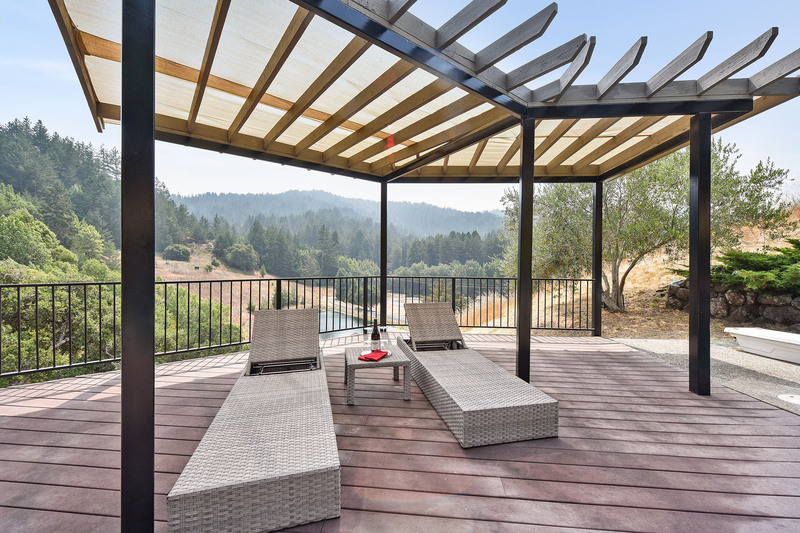 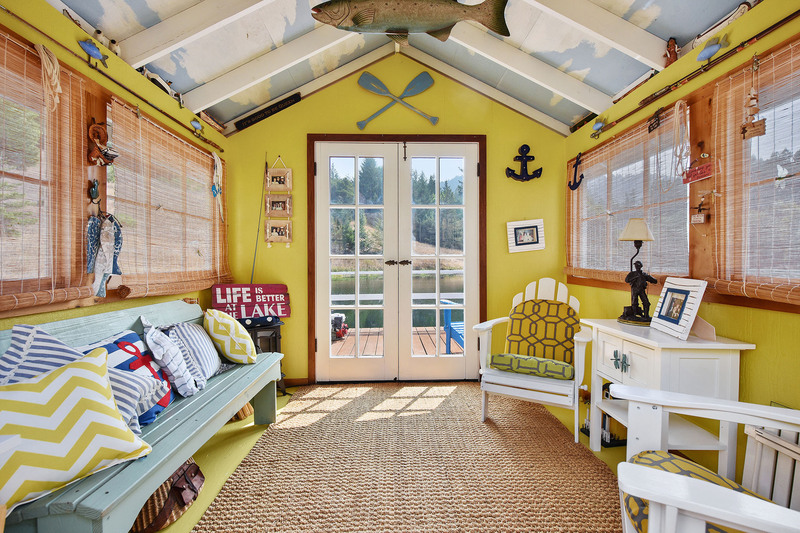 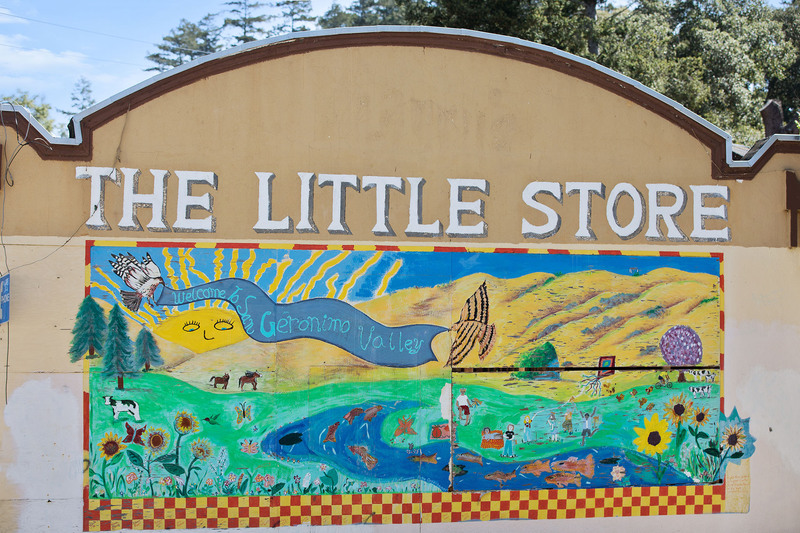 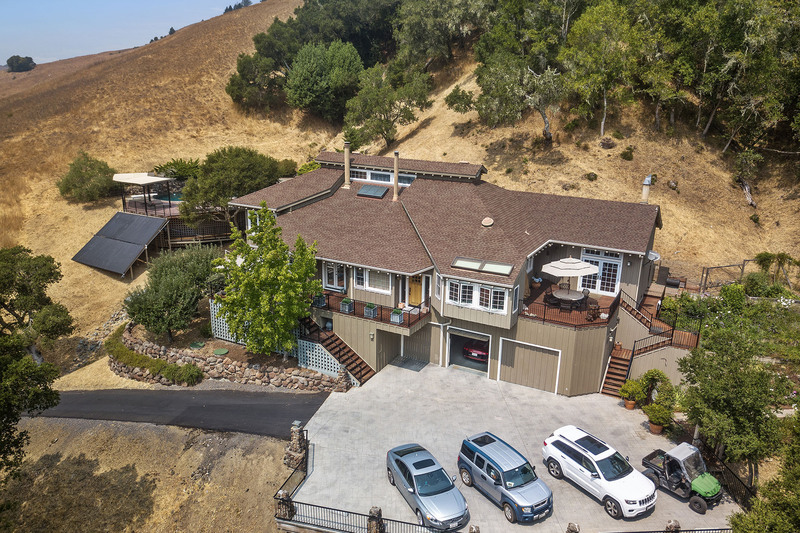 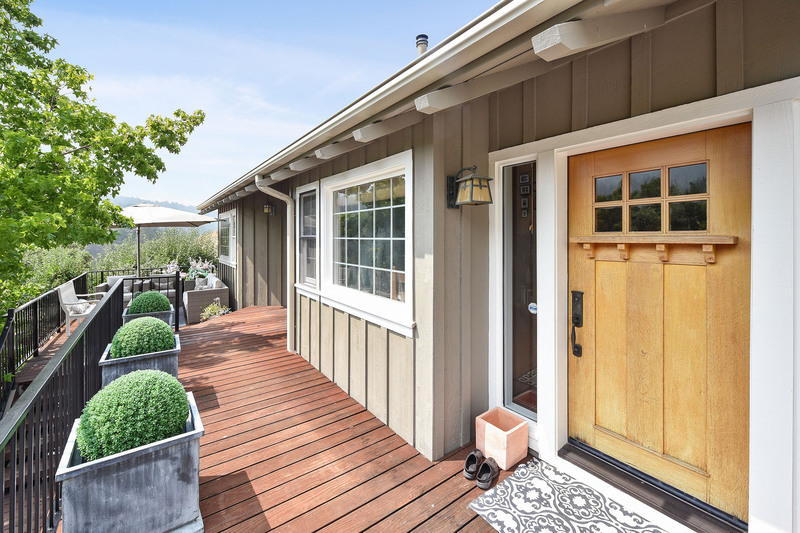 With only about 250 homes in Nicasio, this is a rare opportunity for the next owner to join this amazing community and make a life here, just 8 miles from Novato and an easy strike to San Francisco and Silicon Valley.